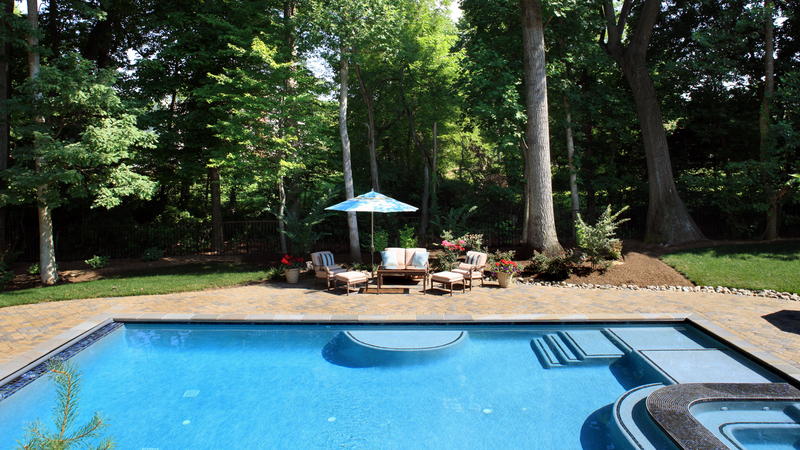 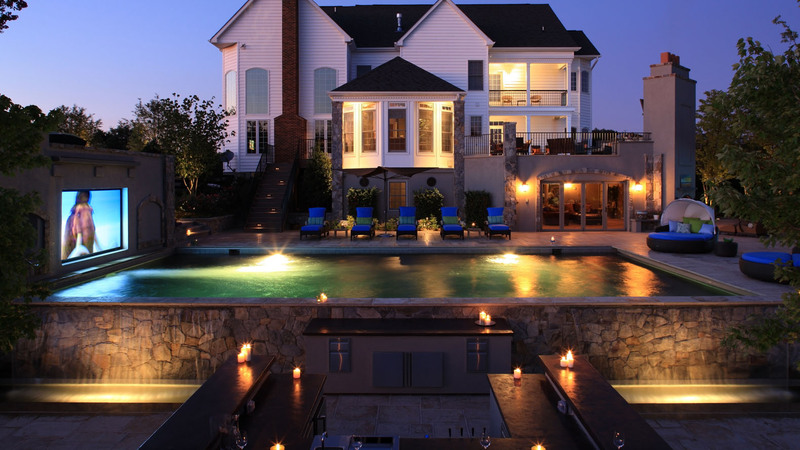 Ranked as the #1 Pool Builder in the DC Metro Area. 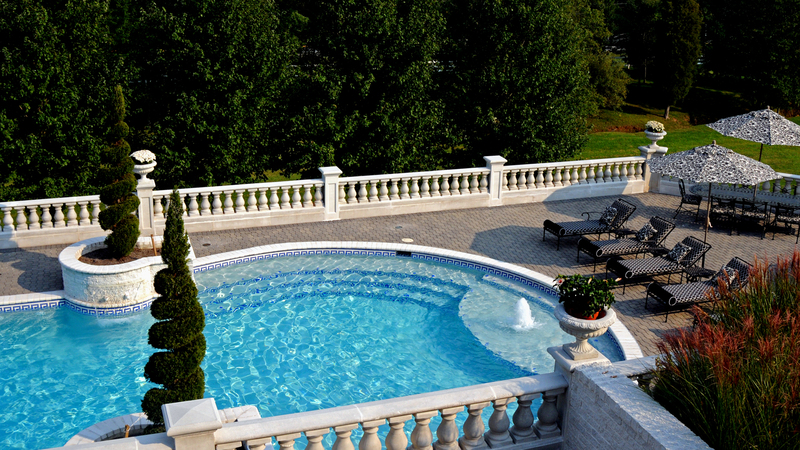 Tailored to your exact vision. 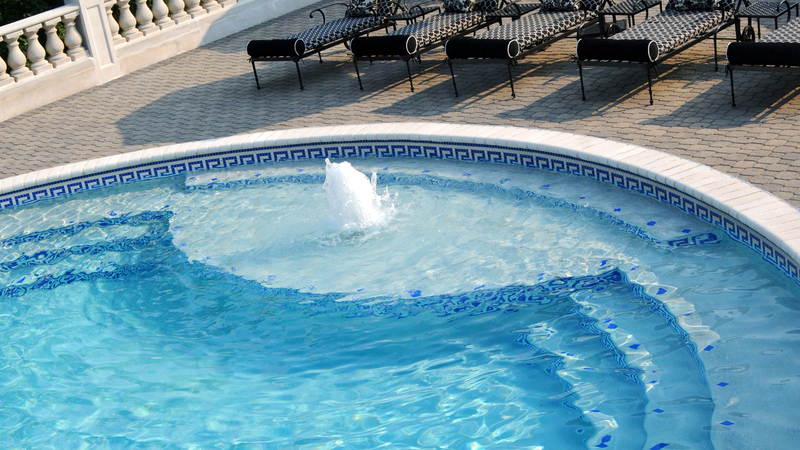 Exquisite designs to suit your lifestyle and every budget. 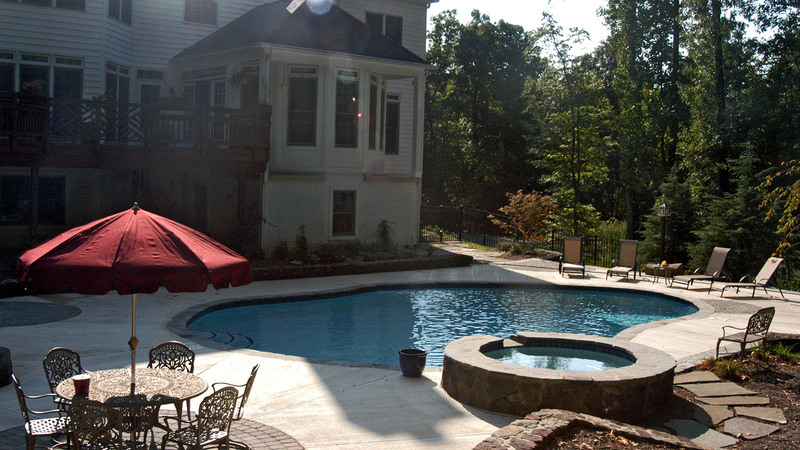 Serving the DC-Metro area for over 30 years. 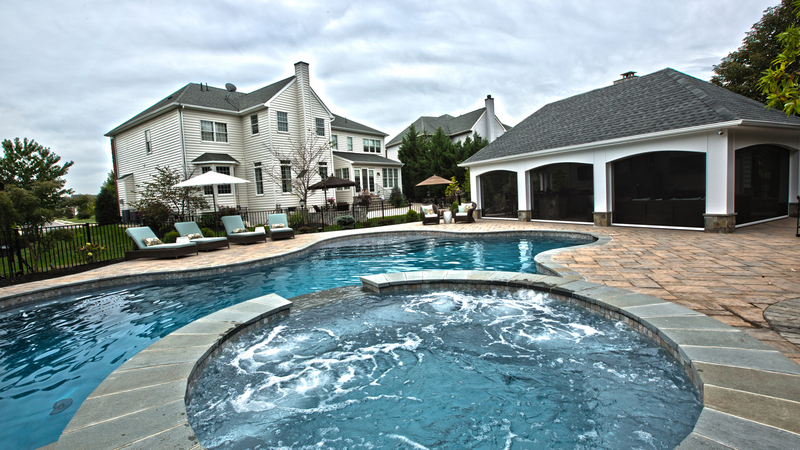 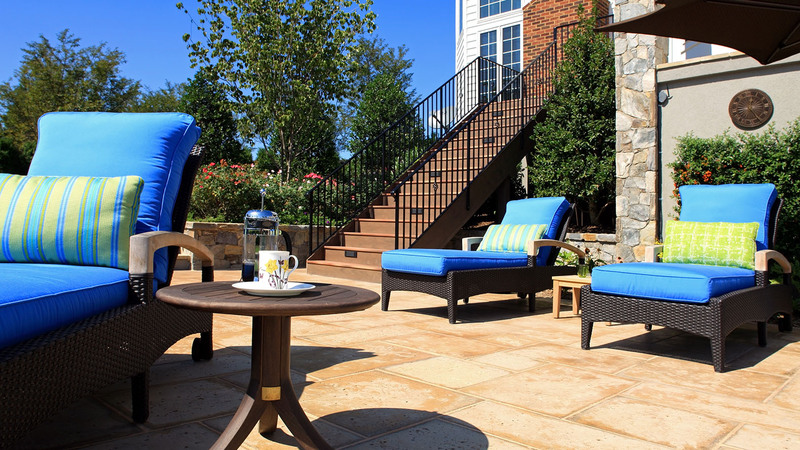 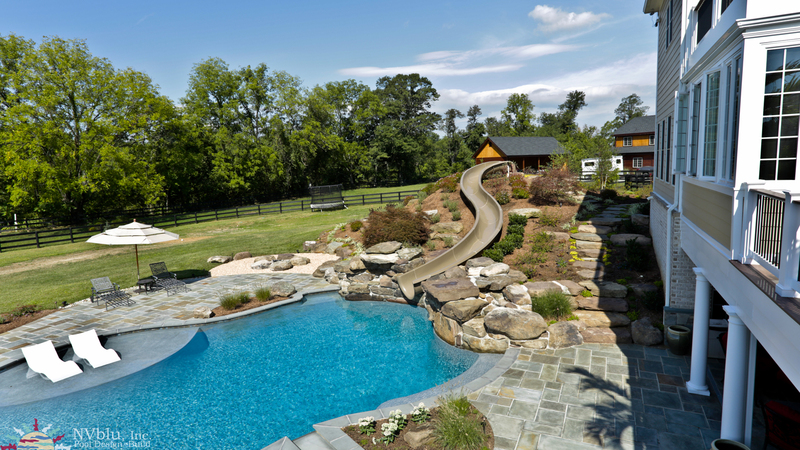 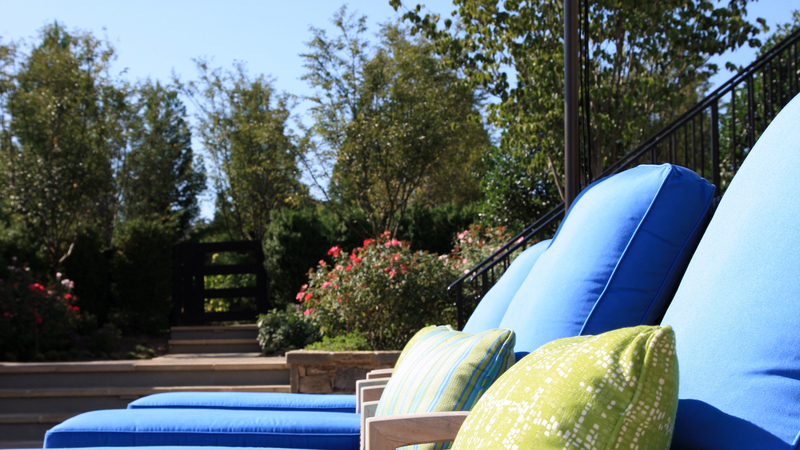 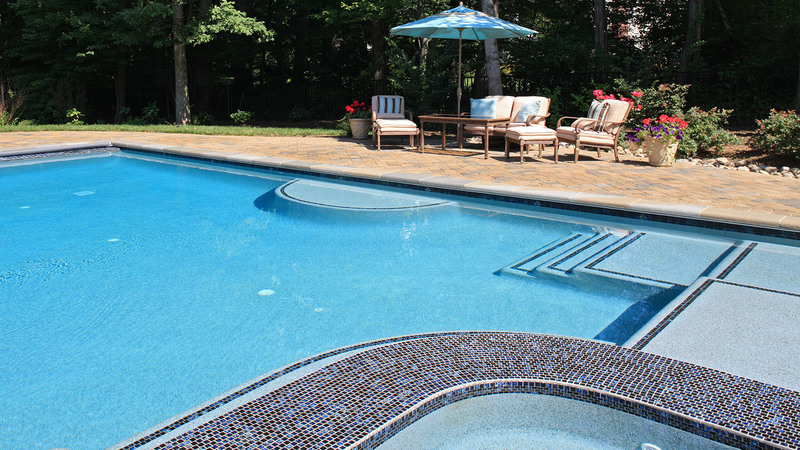 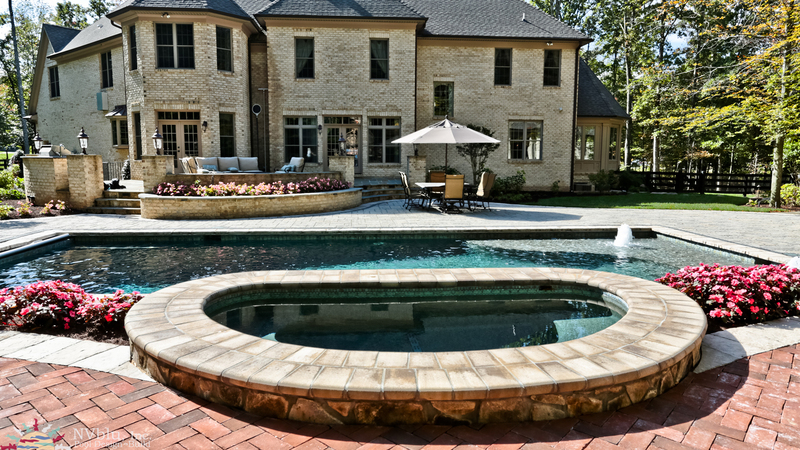 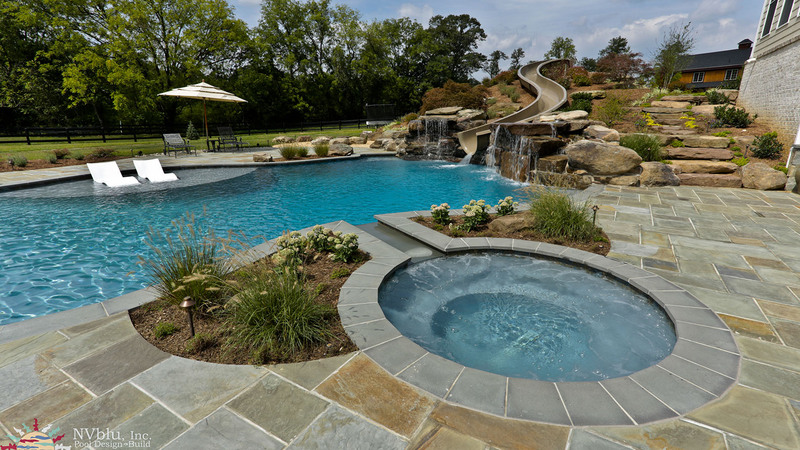 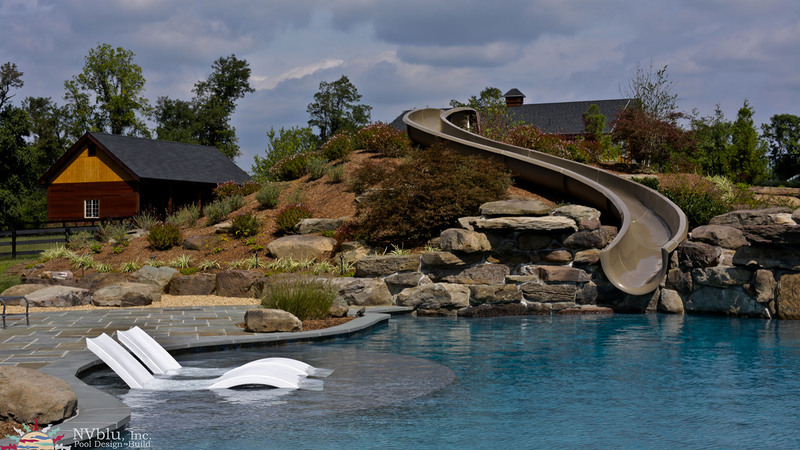 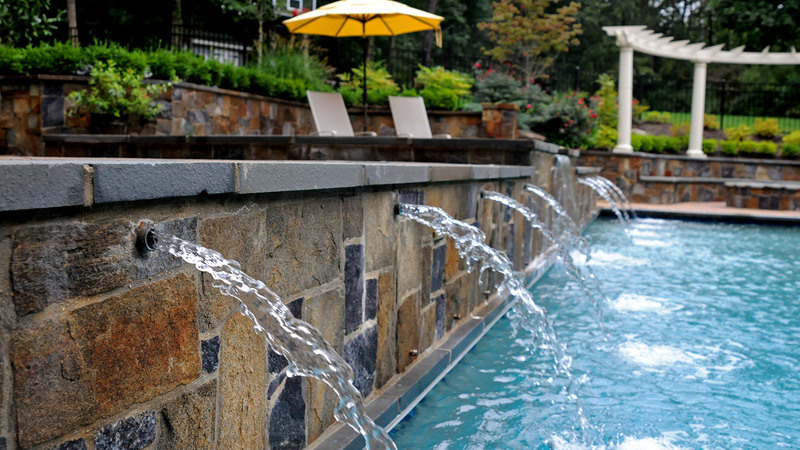 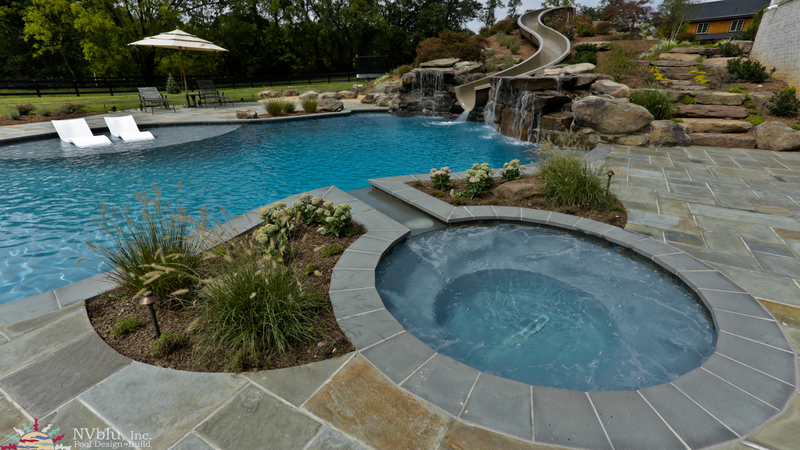 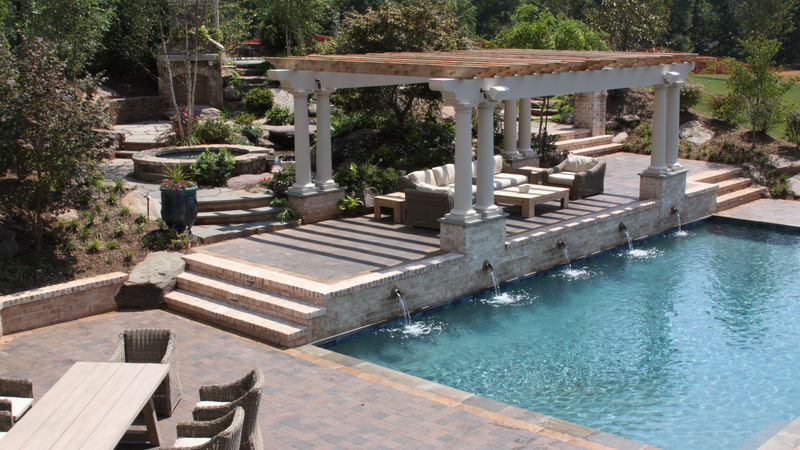 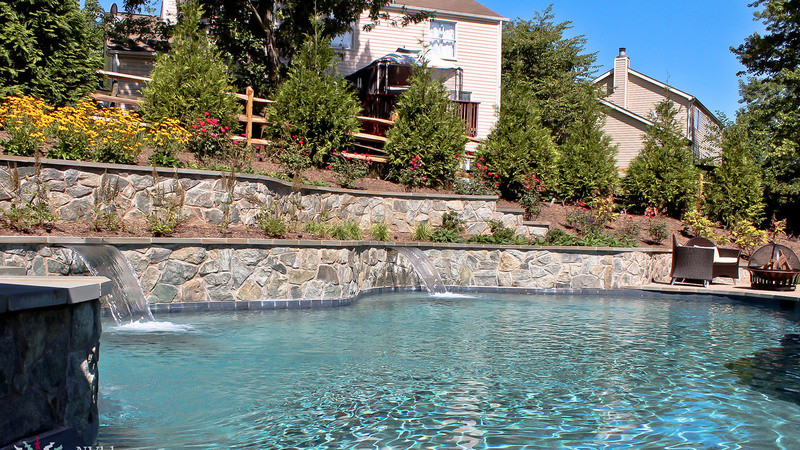 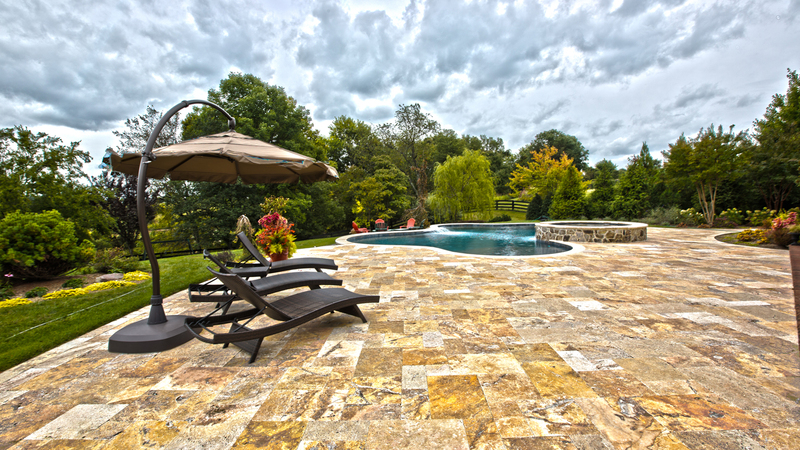 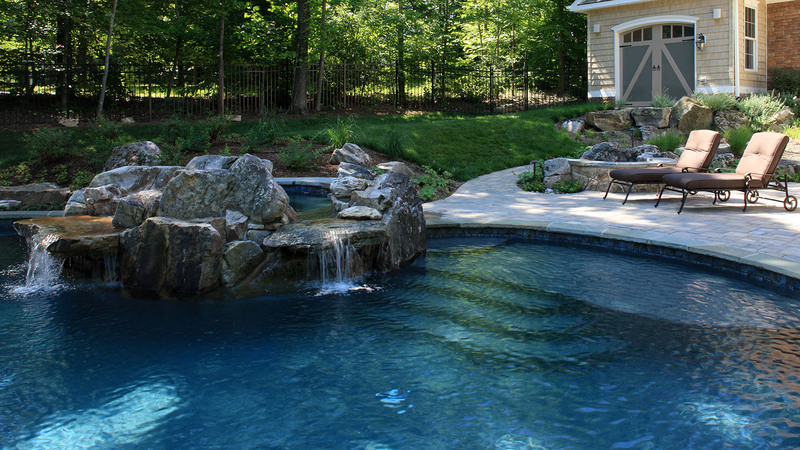 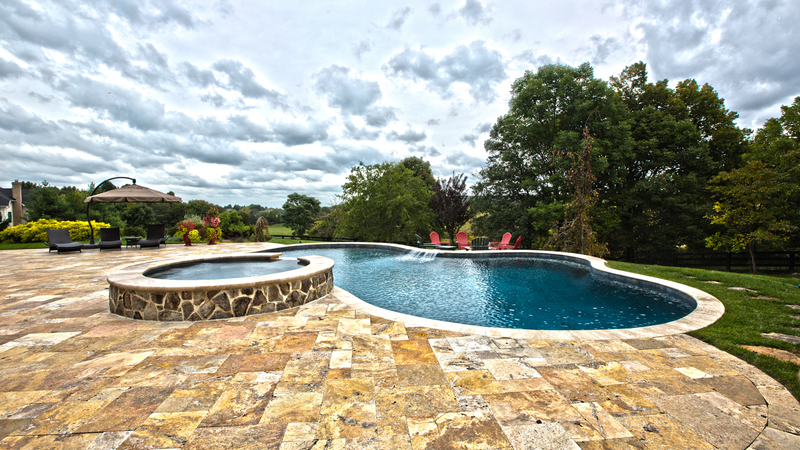 Based in the Washington DC Metro area, NVblu has over a 30 year history of providing the highest quality award winning swimming pool and outdoor living design and construction services. 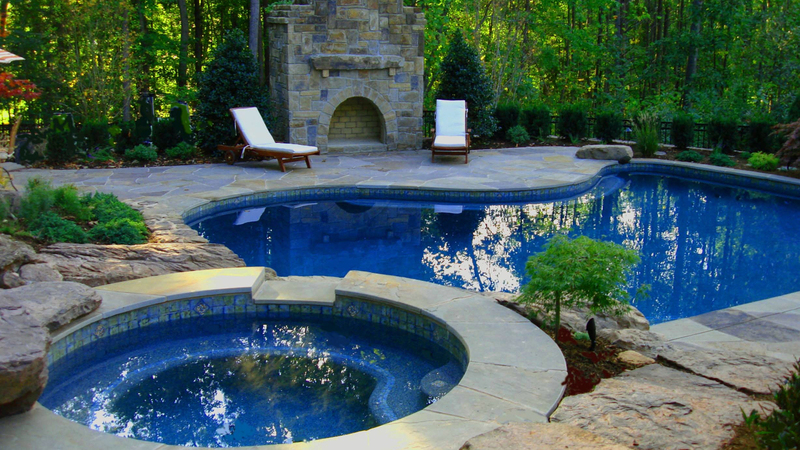 NVblu's mission is to help clients realize their dreams and get the best possible water and outdoor living environment for their investment. 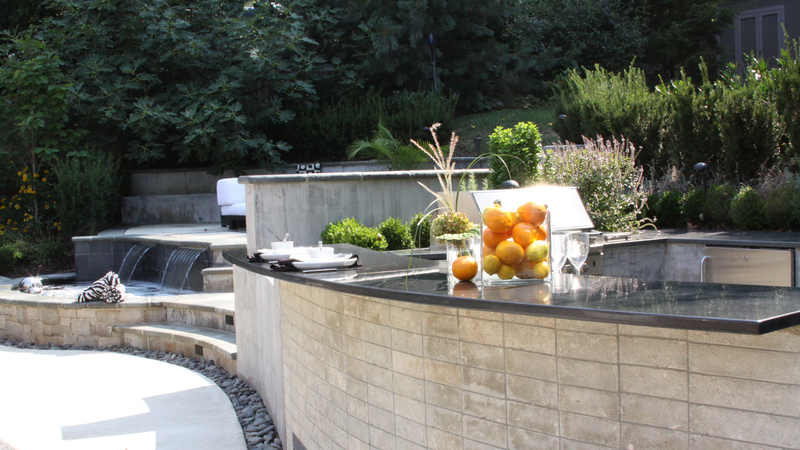 Clients enjoy the ability to make their own choices, backed by the support of decades of professional insight on their side. 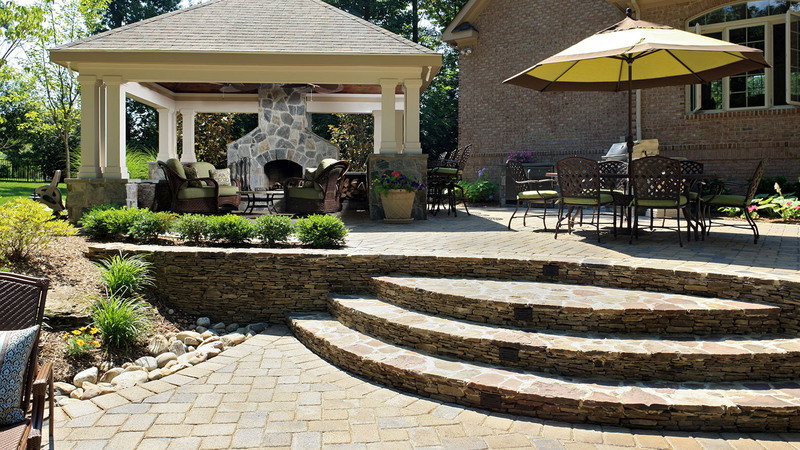 They are never pressured and are encouraged to participate in the design-build process as much or as little as they desire. 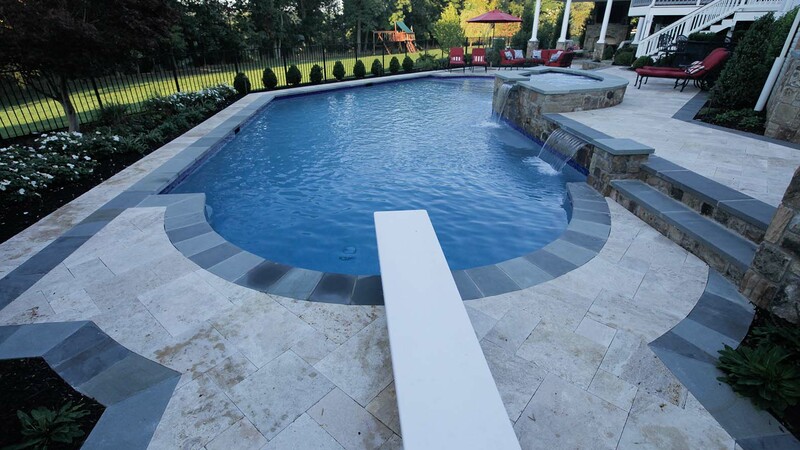 NVblu understands the importance of staying on the leading edge of technology and material development in order to give clients the widest range of choices. 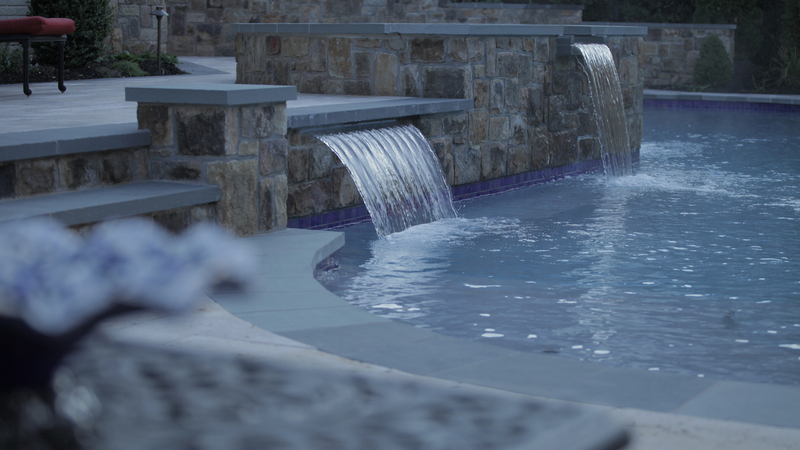 By working with a network of qualified specialists and subcontractors, NVblu is able to deliver the highest in design excellence. 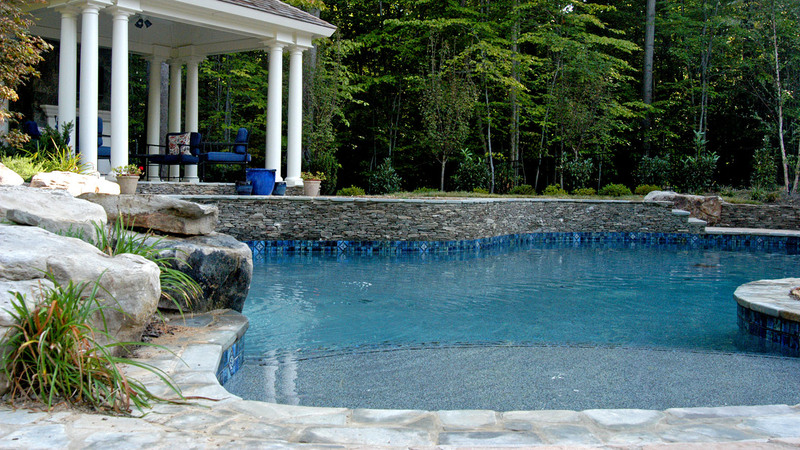 And, because the firm is intentionally small, clients deal personally with company principals who take great pride in making each pool built by NVblu the best that it can be. 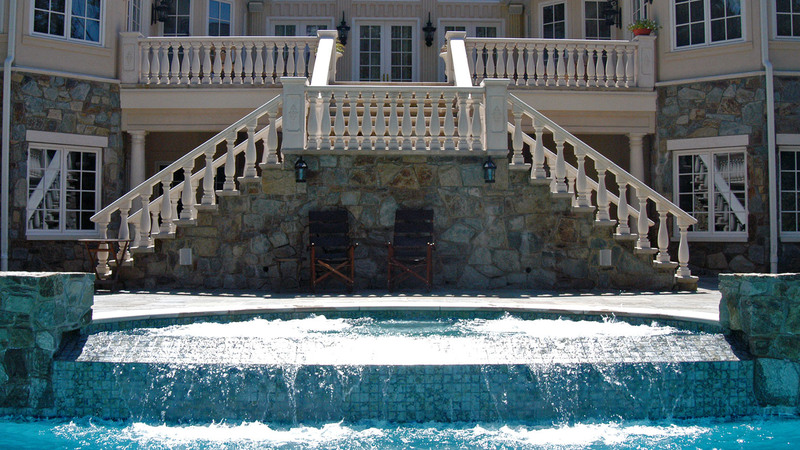 NVblu and its industry leading designers are affiliated with the most prestigious organizations in our industry. 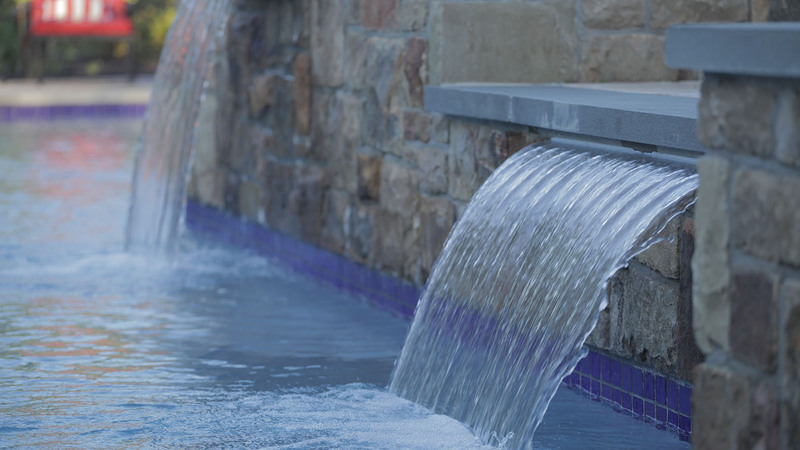 Our continuing training and keeping up with industry trends allows us to provide you with the most innovative and uniquely qualified services available. 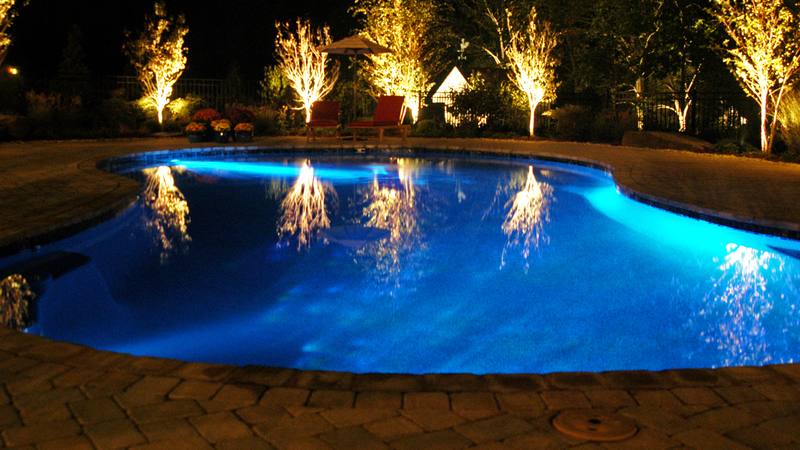 NVblu is led by career swimming pool professionals. 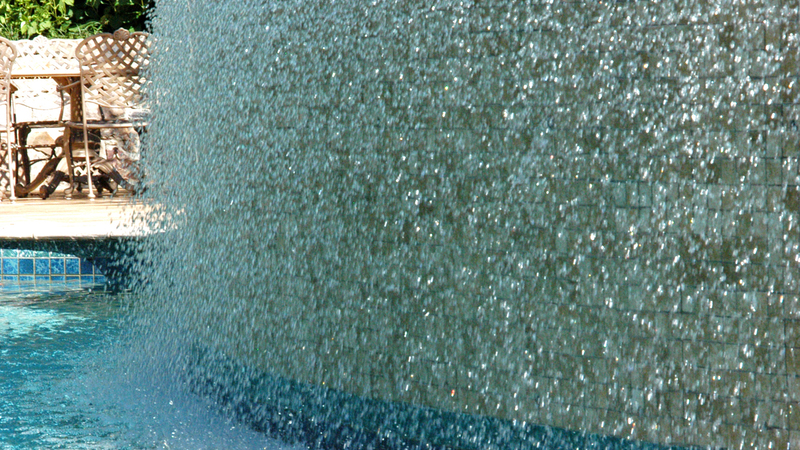 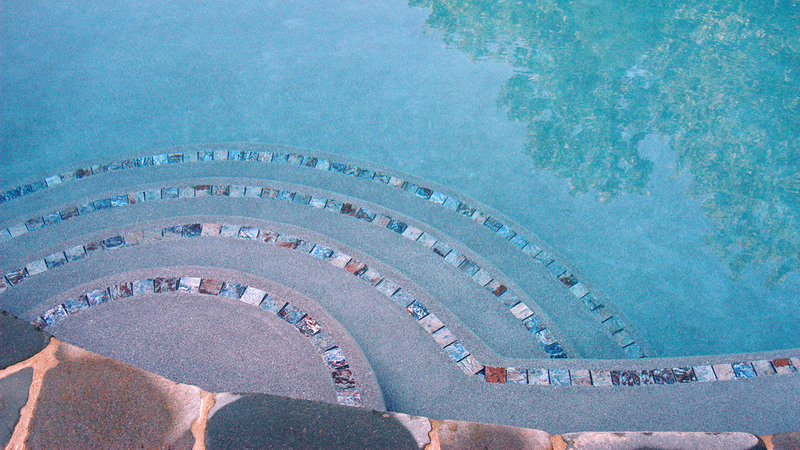 Jack has been heavily involved in all facets of the pool business for over 35 years, and is considered to be the area's premier expert and authority on pool construction and design, and on pool code compliance. 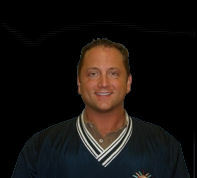 Jack was born in Washington, DC and raised in Northern Virginia, and holds a BA degree in Political Science from Virginia Tech and a JD degree from George Mason University School of Law, and is a member of the Virginia State Bar. 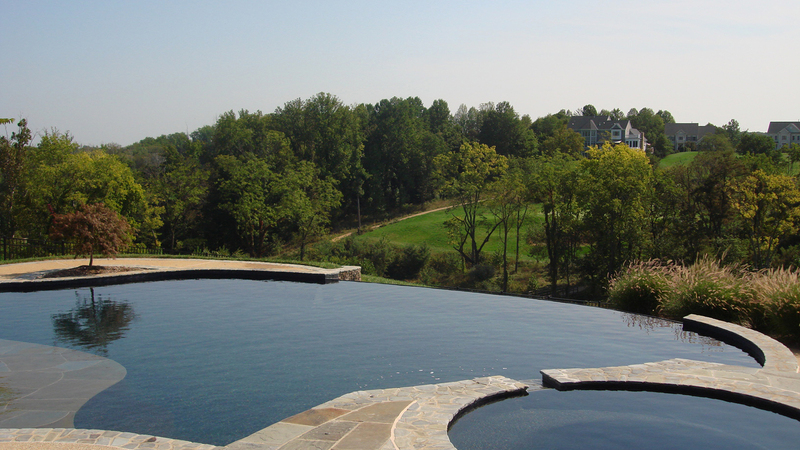 Drew was born and raised in Northern Virginia, and graduated from Virginia Tech with a BA in International Business. 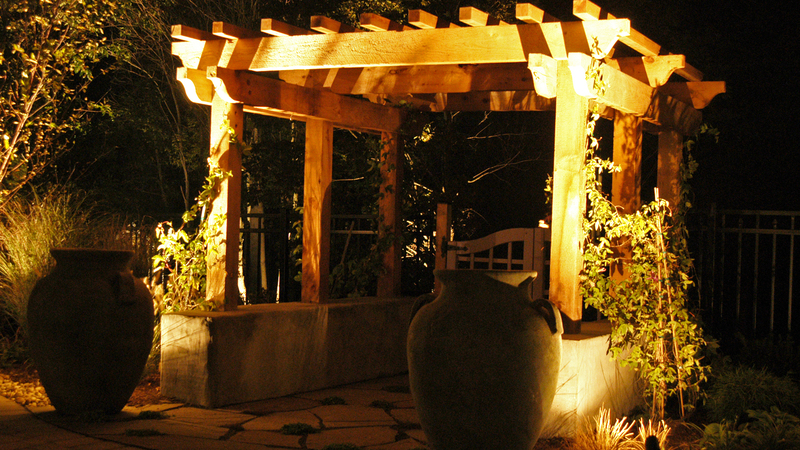 His significant postgraduate studies in Engineering, Architecture, and Landscape Design make him uniquely qualified to lead NVblu's design teams and management operations. 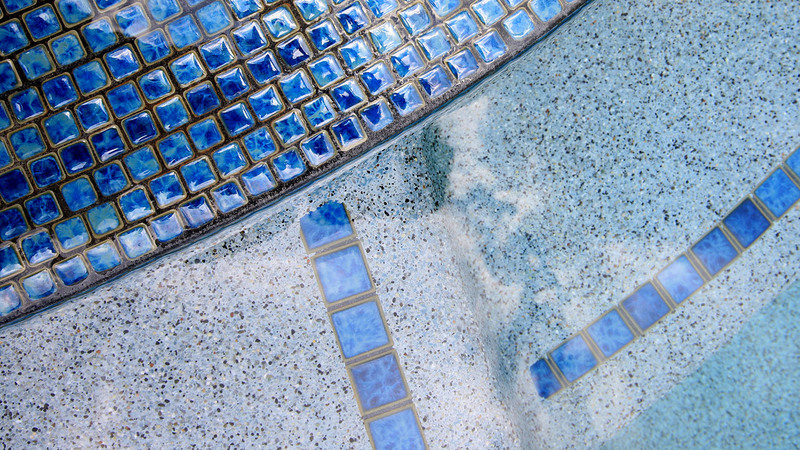 He is heavily involved in all aspects of NVblu's construction activities and business affairs and is the company's liaison and point-of-contact with its commercial clients. 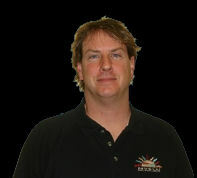 He also coordinates projects with other design professionals, architects, and engineers and is responsible for overseeing development of NVblu design concepts and plans for commercial projects, to include hydraulic calculations, systems analysis and CAD design. 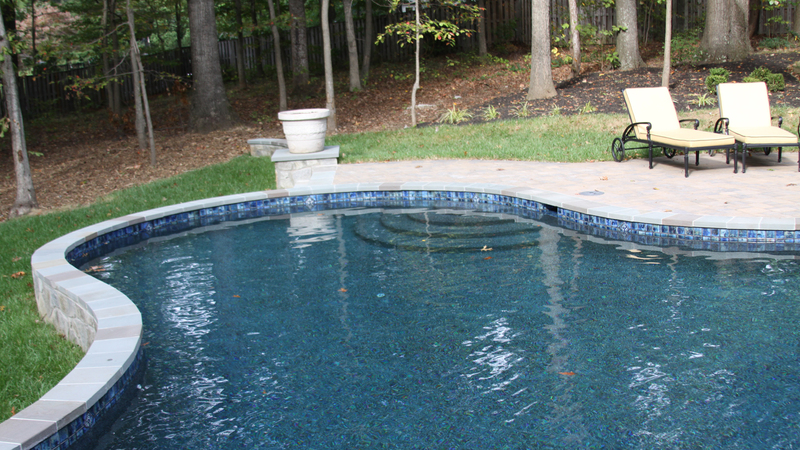 Chris was born and raised in Northern Virginia and has been in the pool construction business since 1975. 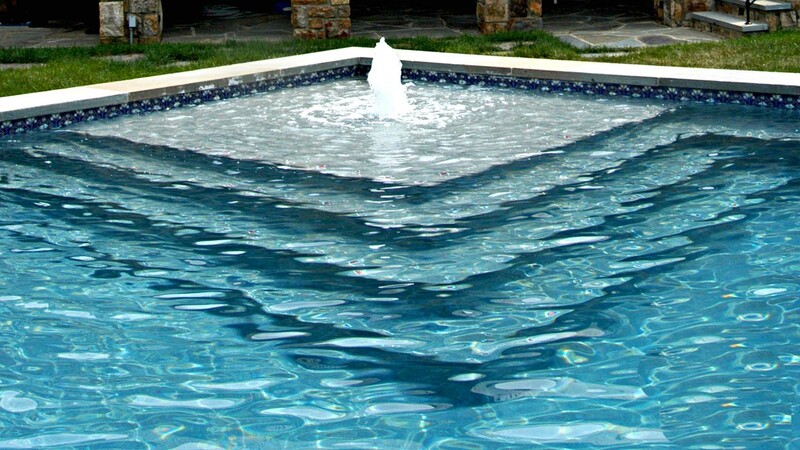 He is considered an expert in all facets of pool and building construction. 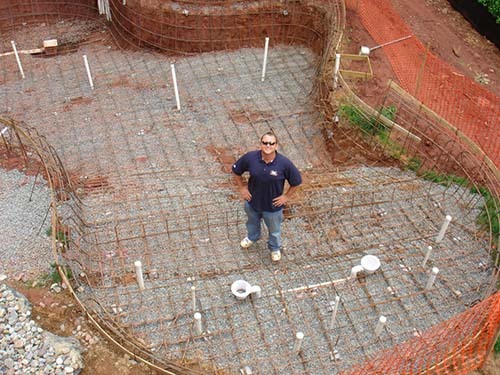 Chris is a graduate of Radford University, and a Certified Land Disturber by the Commonwealth of Virginia. 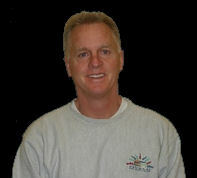 Chris has been with NVblu since 1991, and has been instrumental in its growth and development. 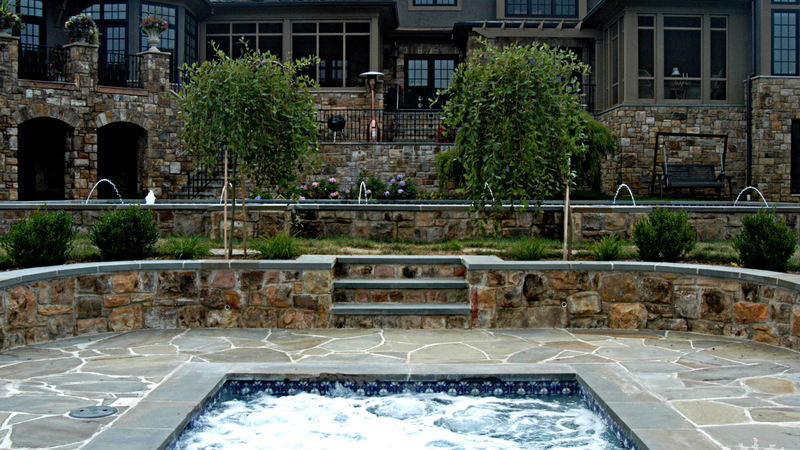 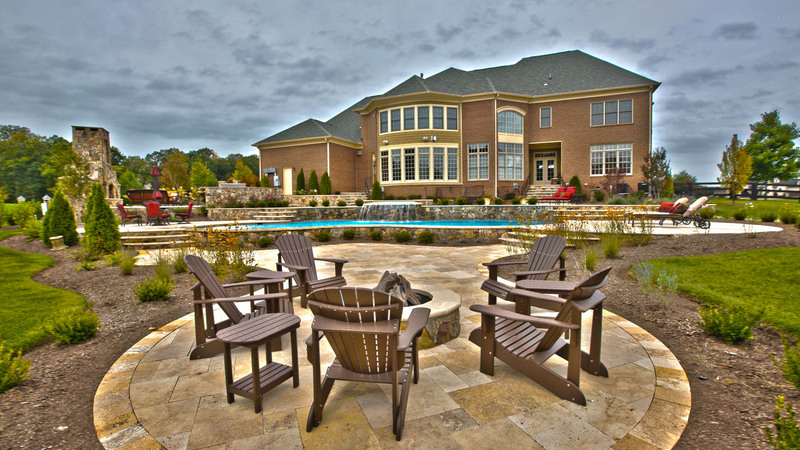 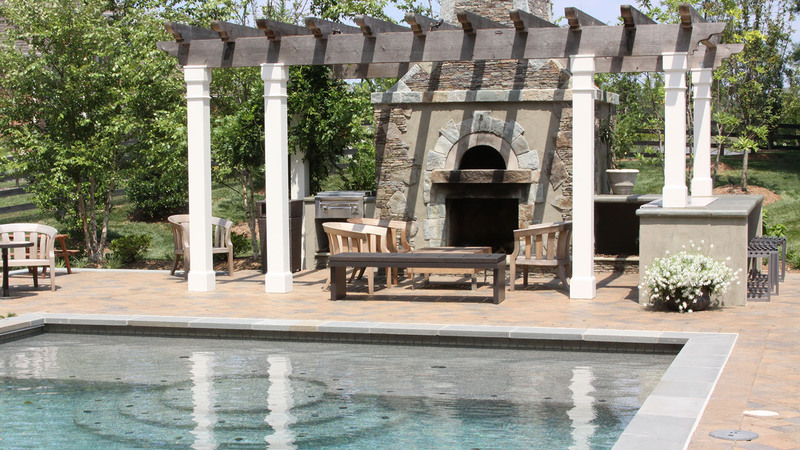 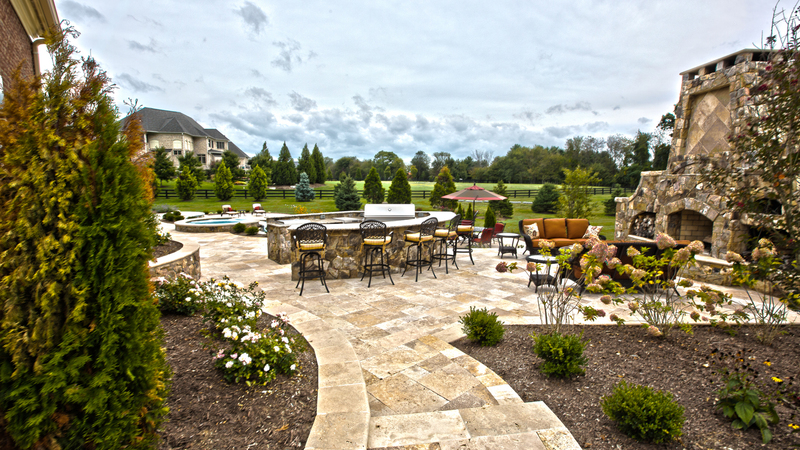 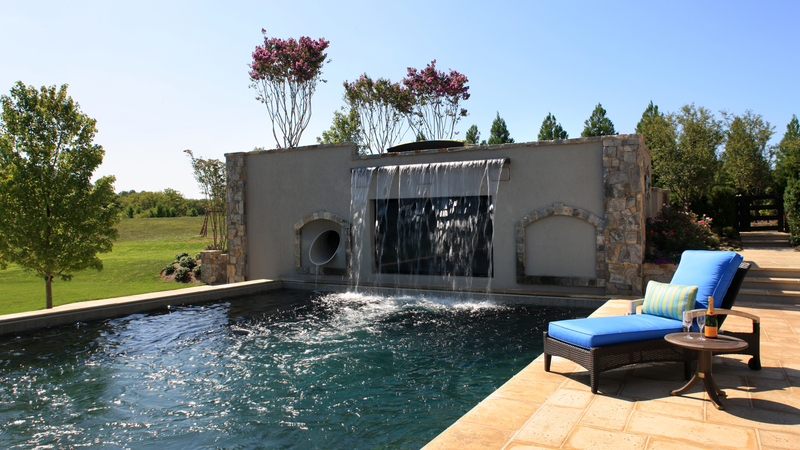 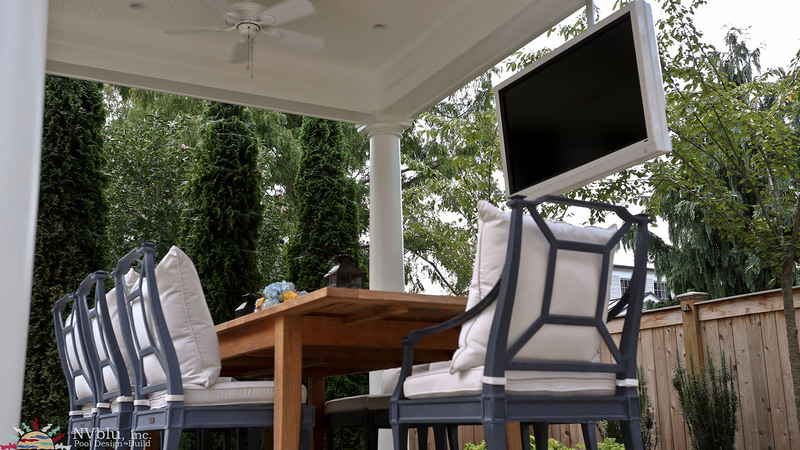 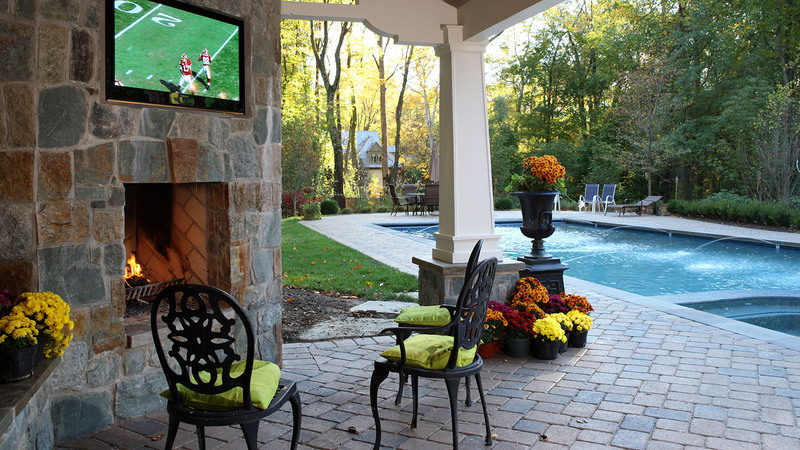 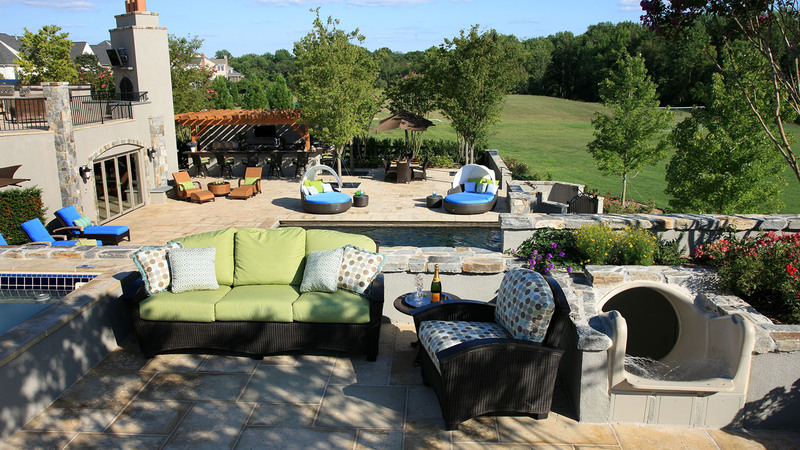 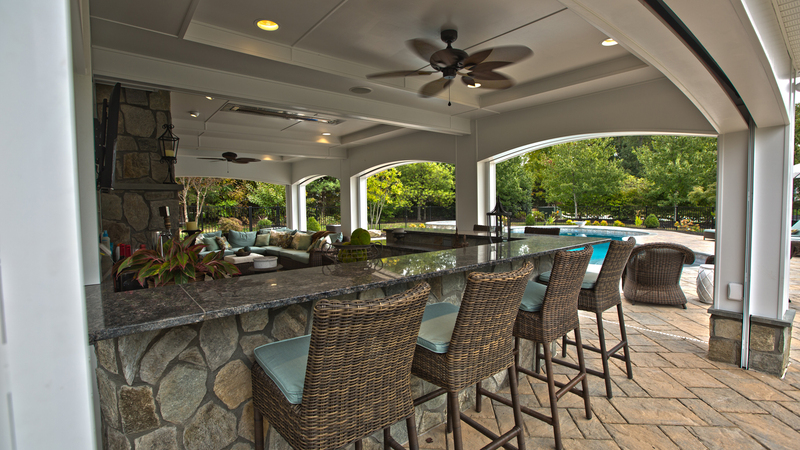 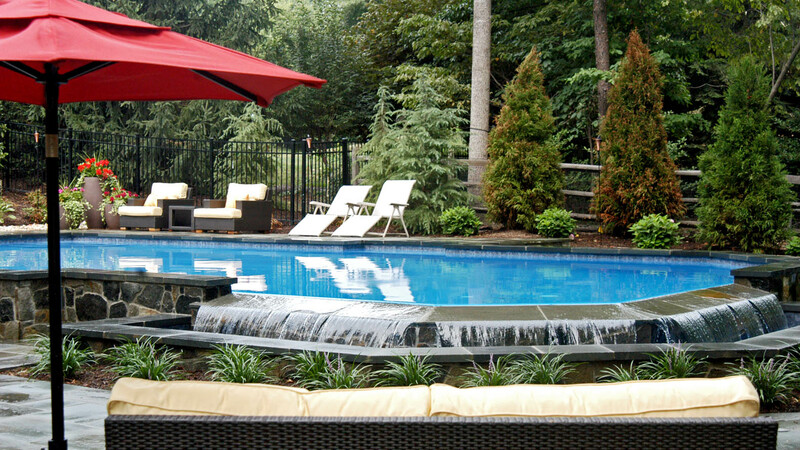 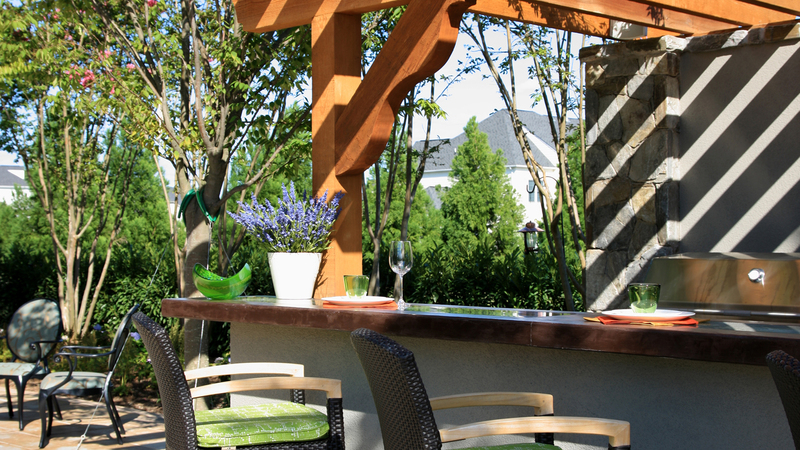 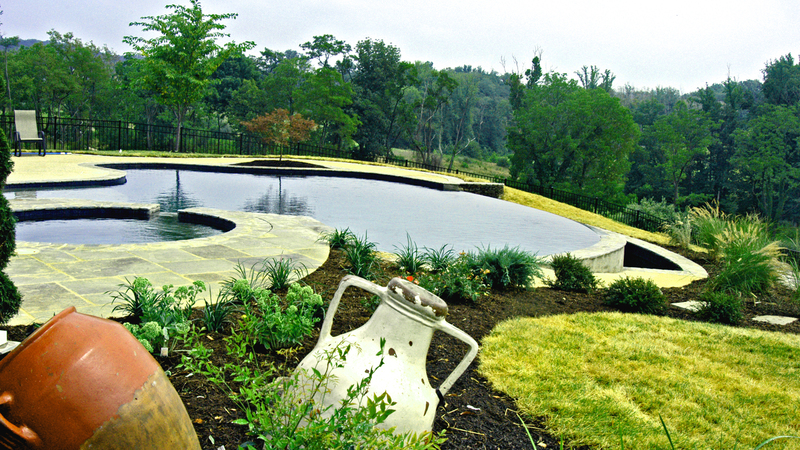 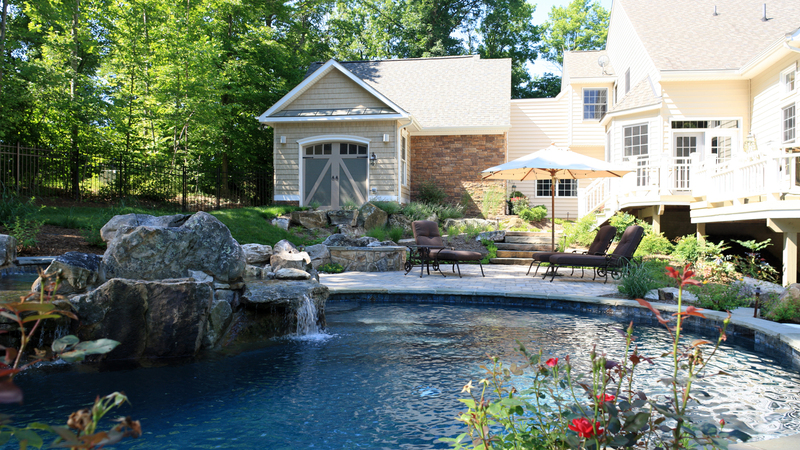 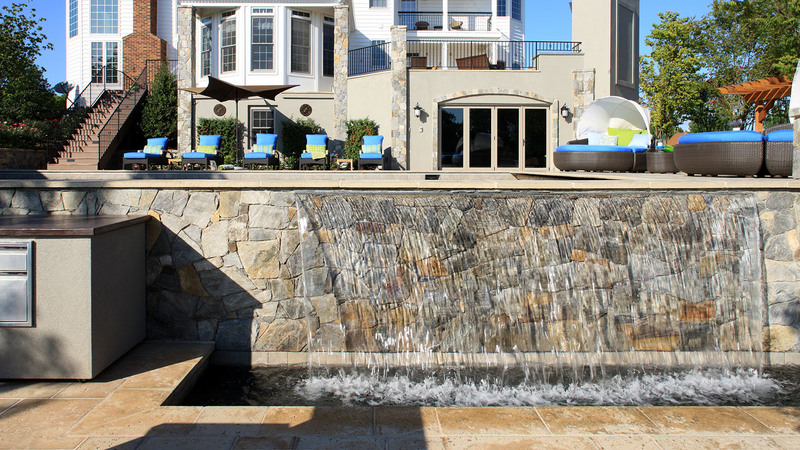 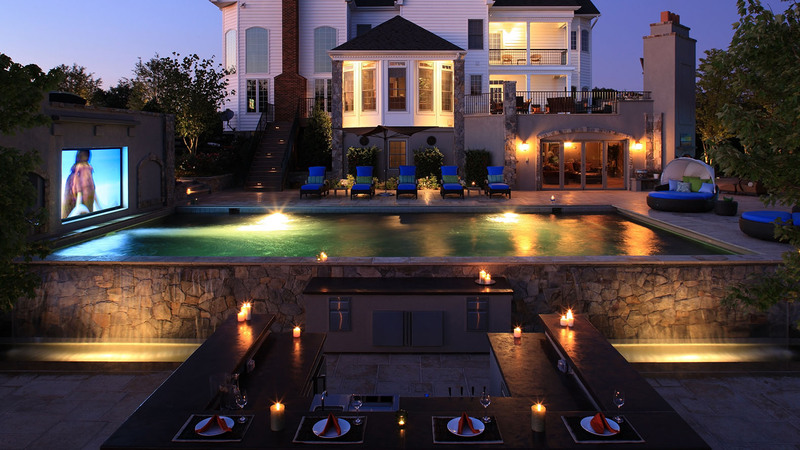 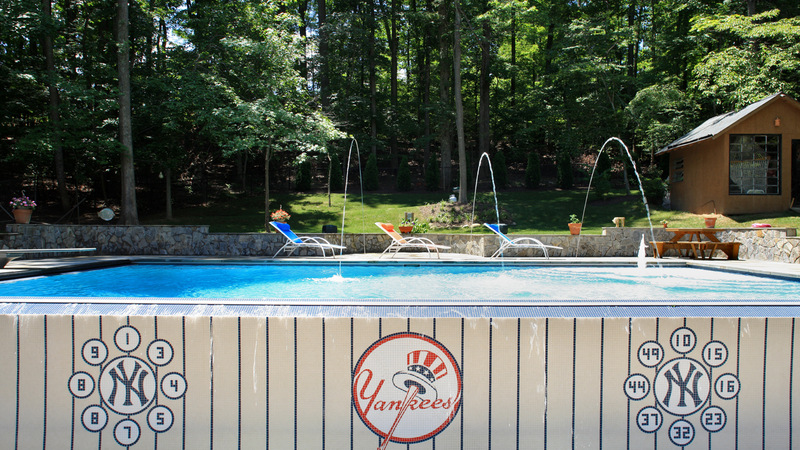 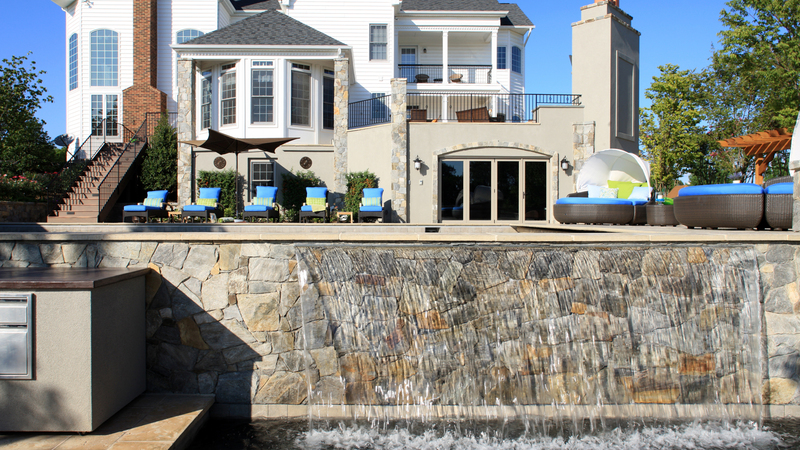 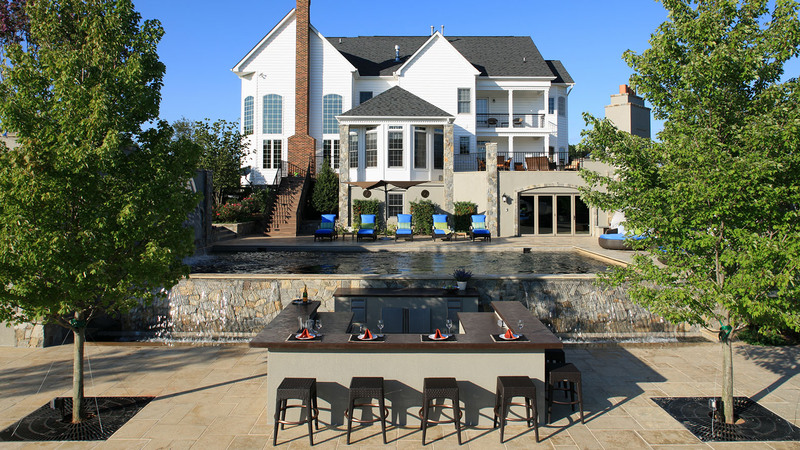 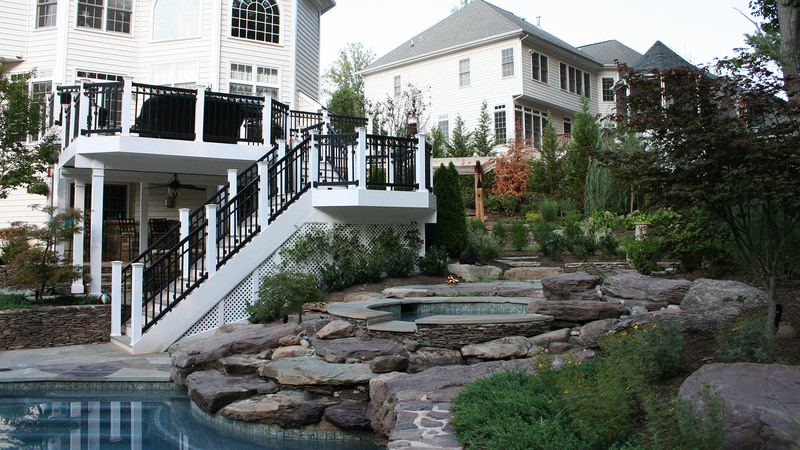 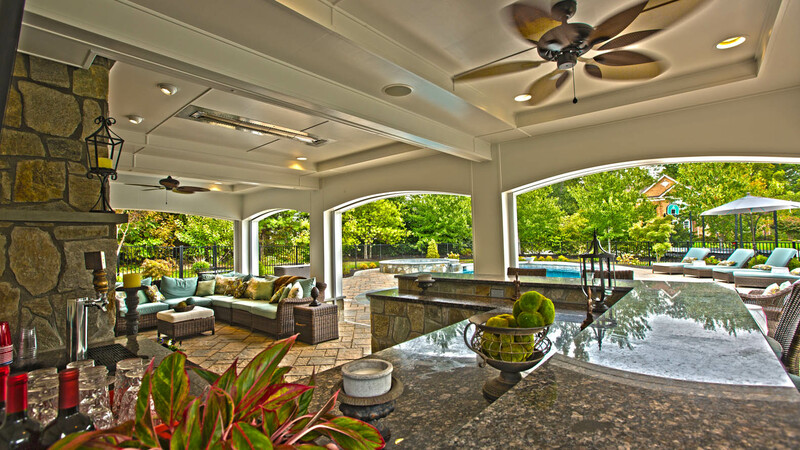 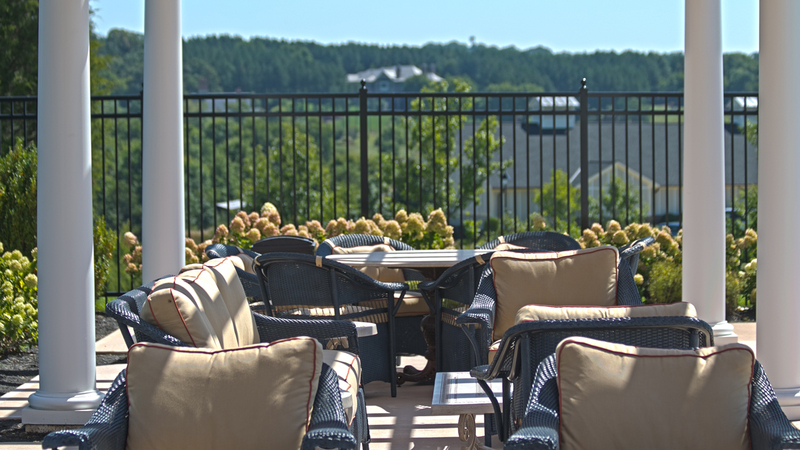 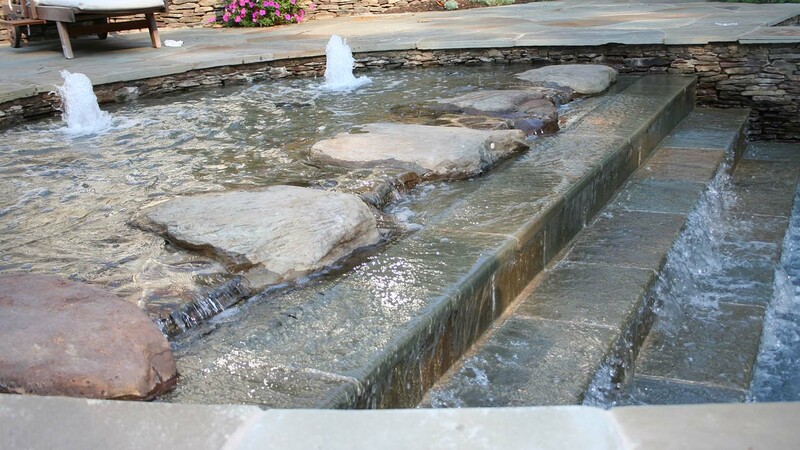 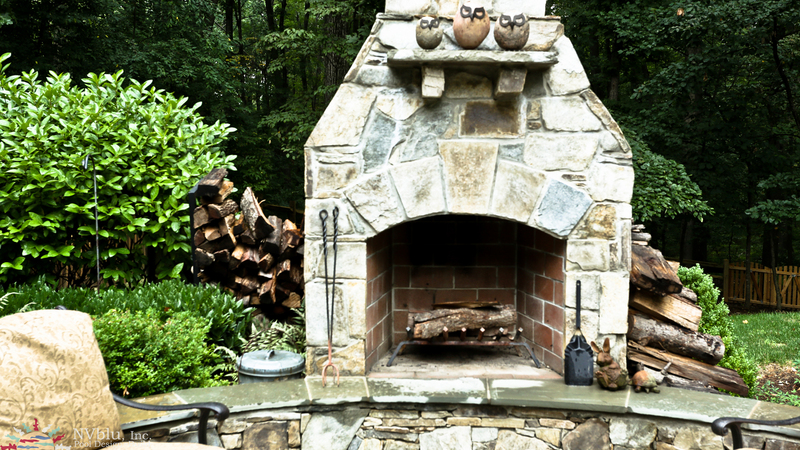 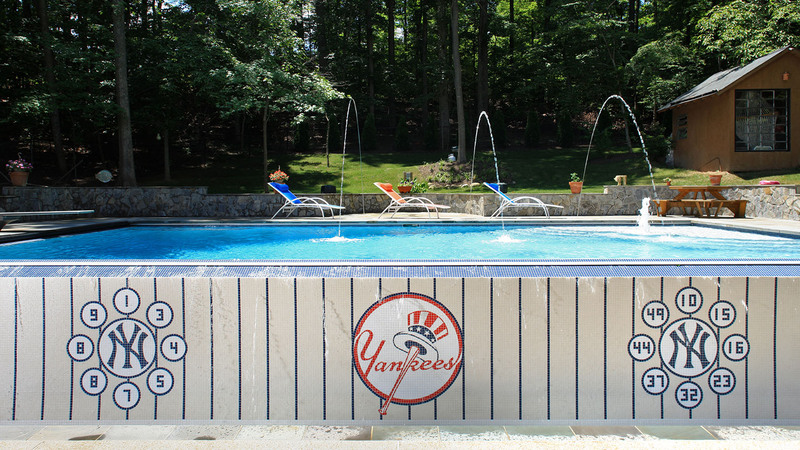 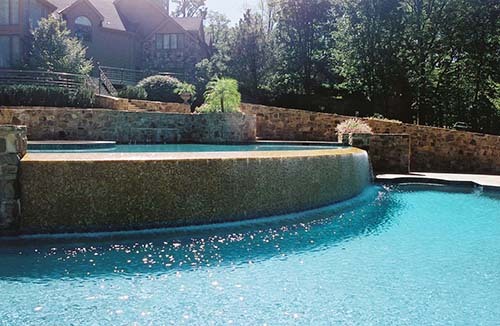 A lifelong resident of Northern Virginia With over 35 years 0f experience in design, construction project management, Alan has uses his diverse background to construct and renovate all types and sizes of commercial and residential pools and outdoor living elements. 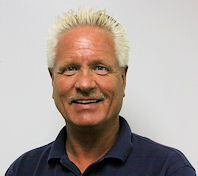 He leads NVblu's residential teams in marketing, design, sales, project management and quality control. 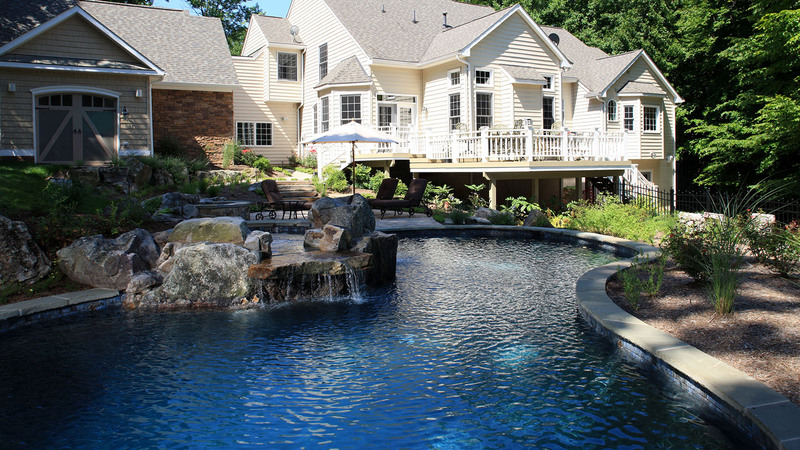 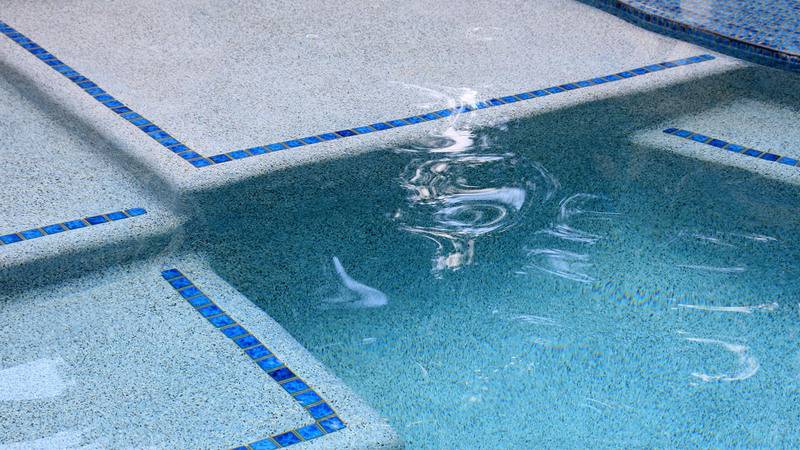 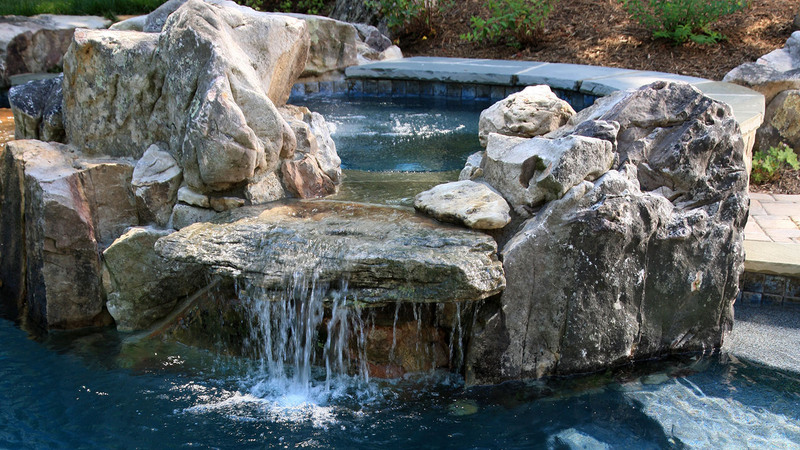 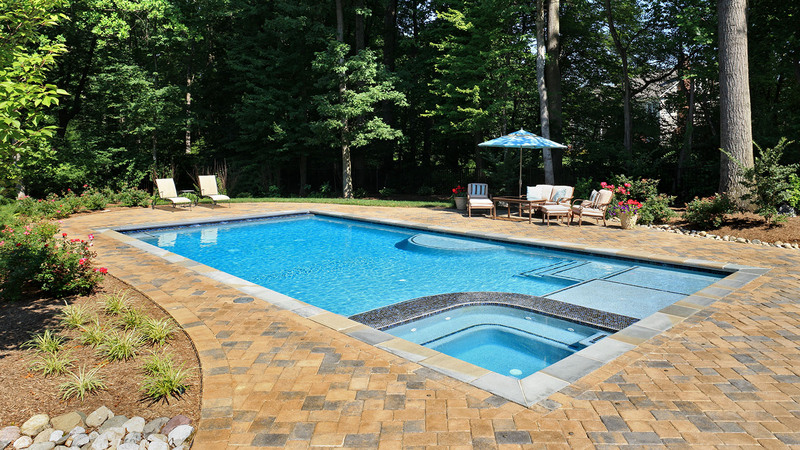 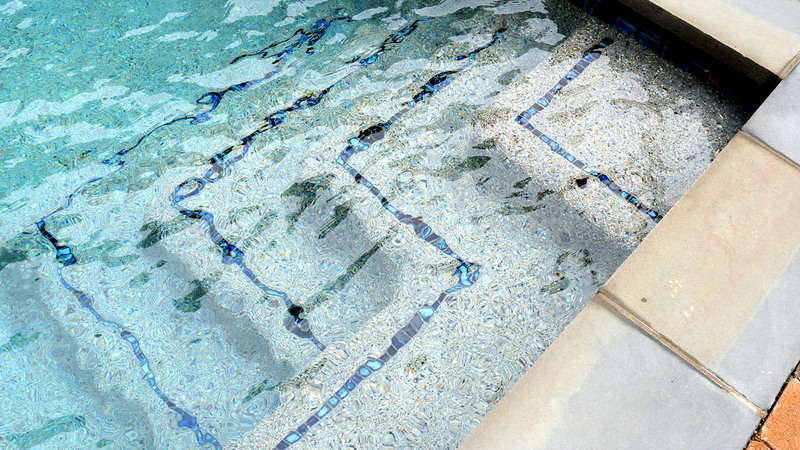 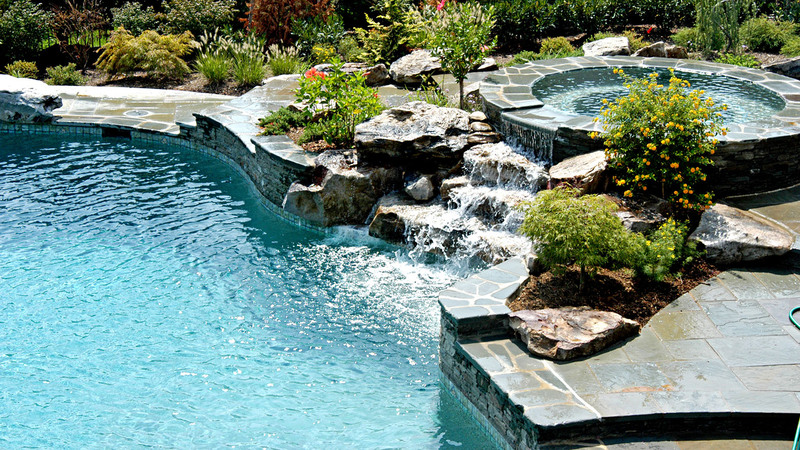 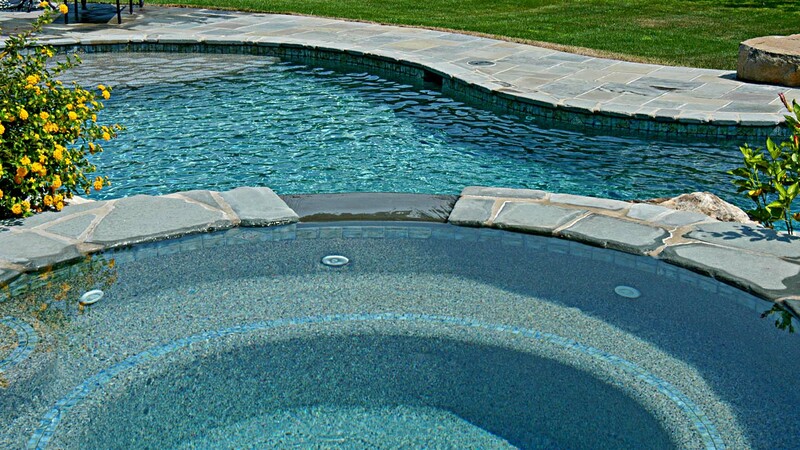 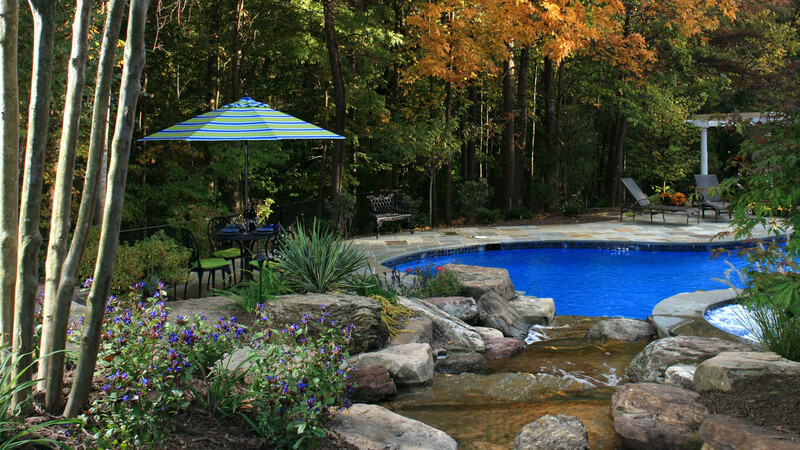 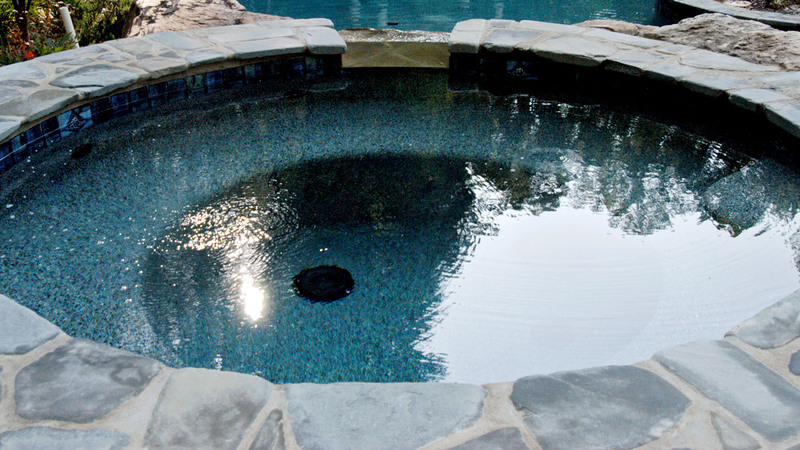 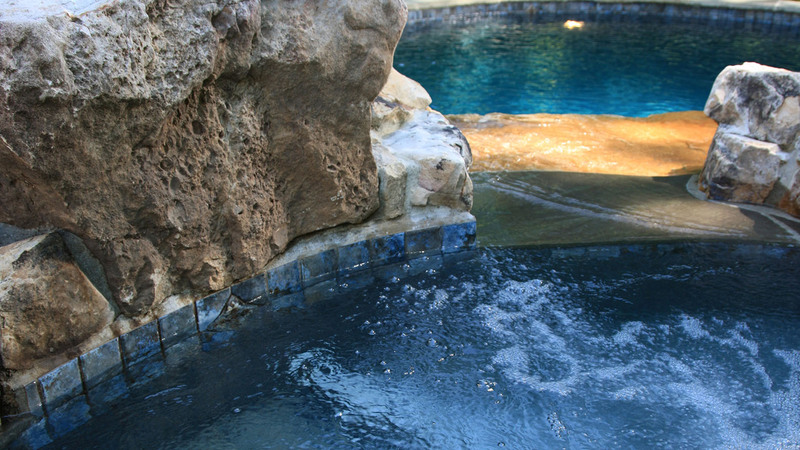 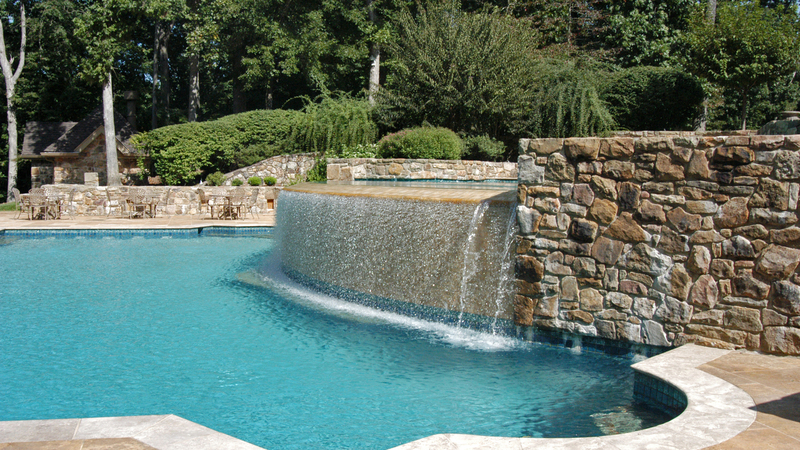 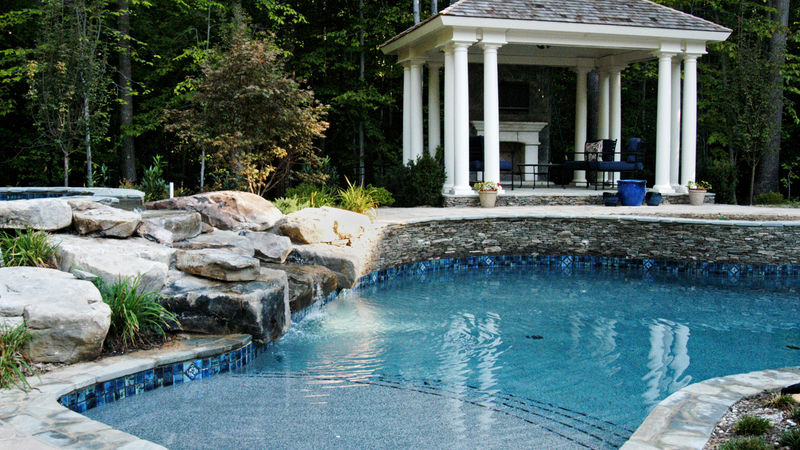 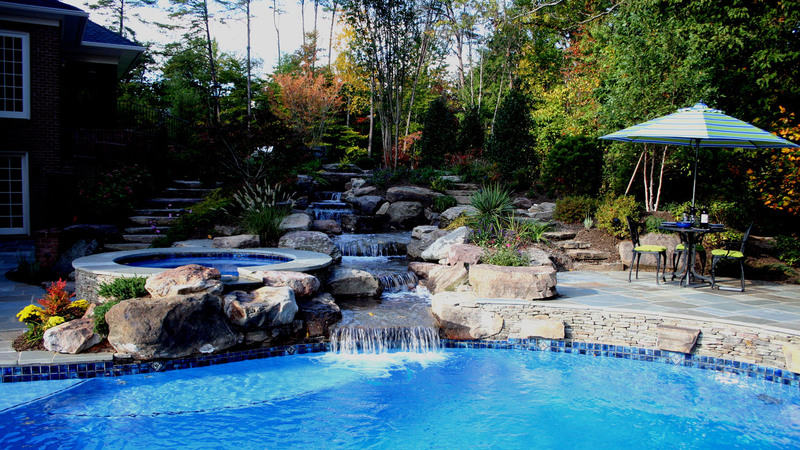 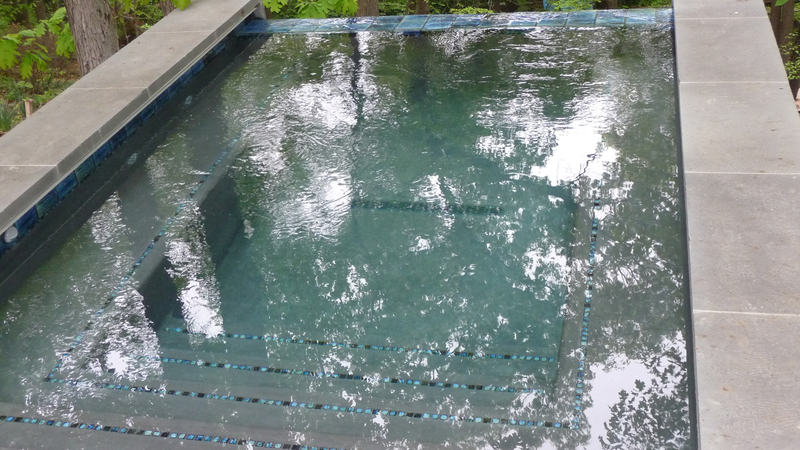 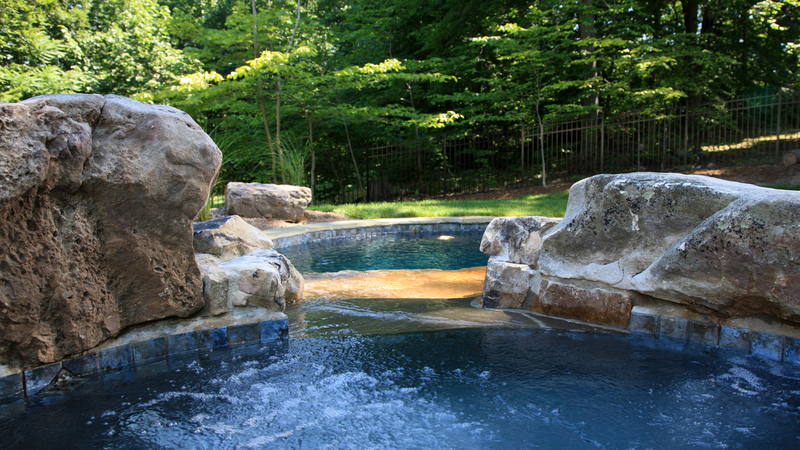 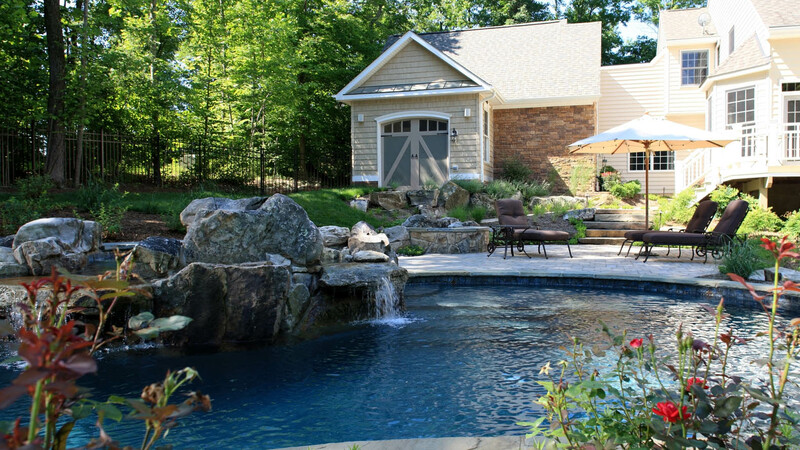 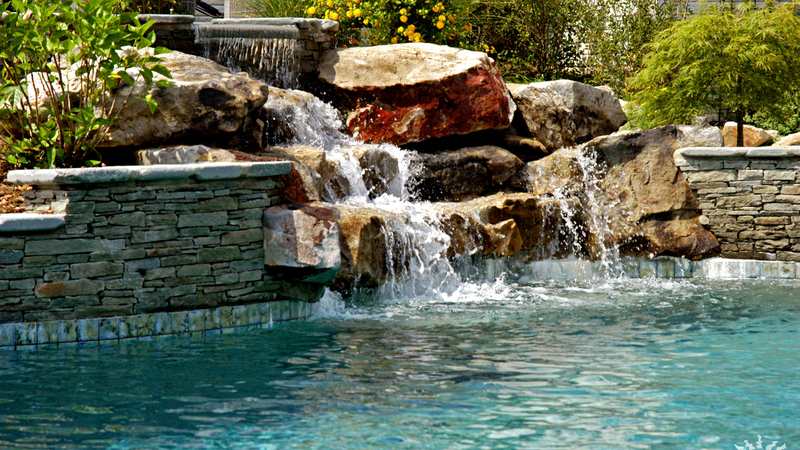 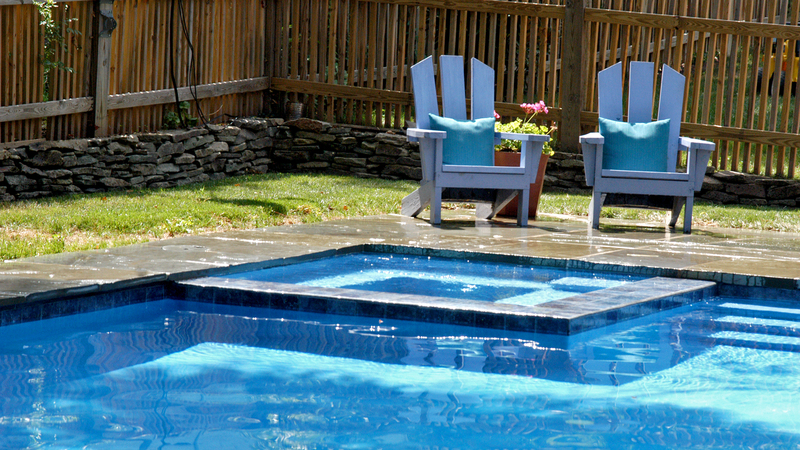 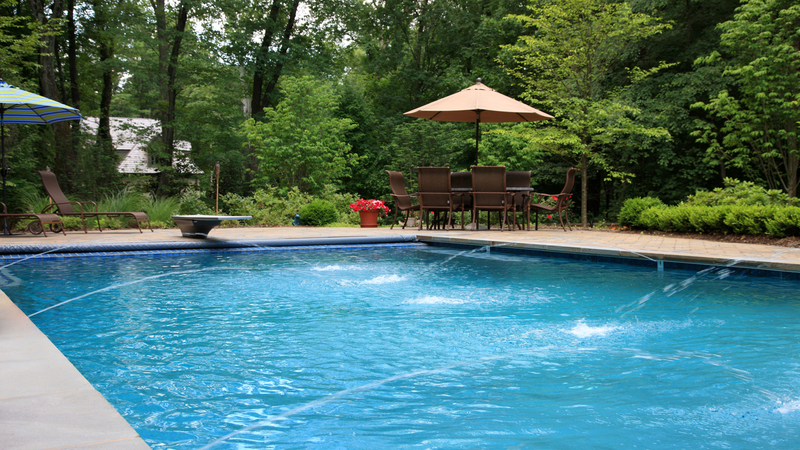 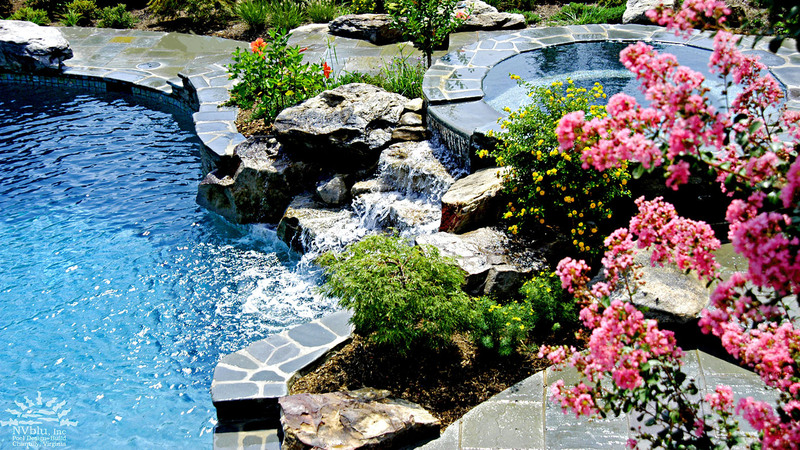 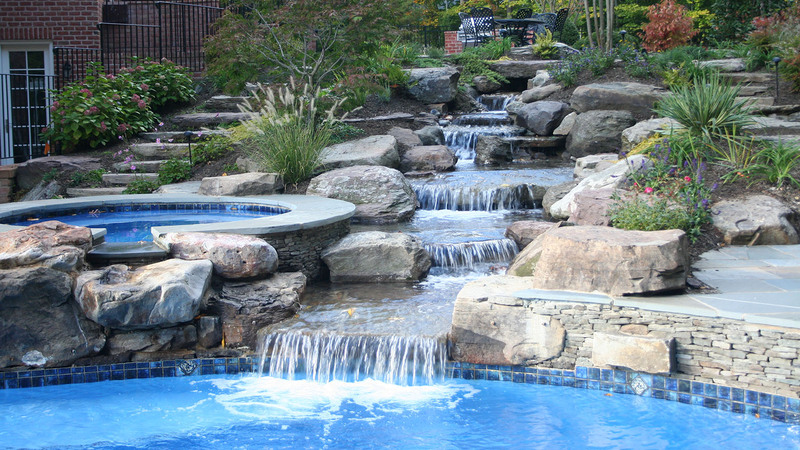 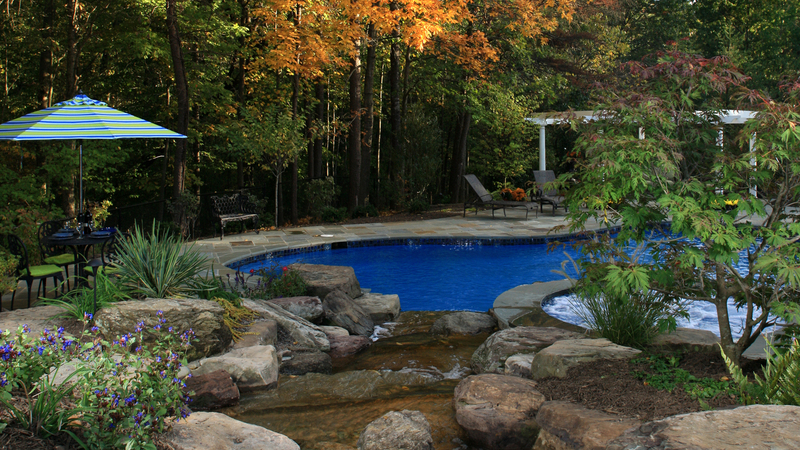 Robert has extensive experience in pool construction, service and repair. 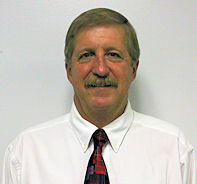 He has been with NVblu since 1994 in increasingly progressively responsible positions. 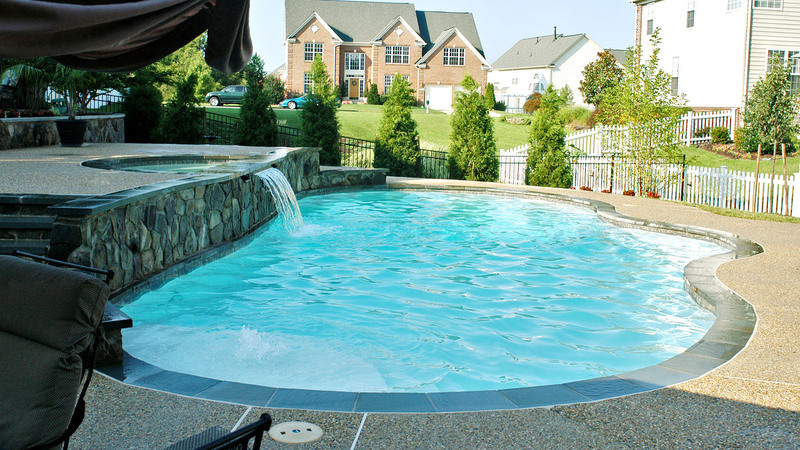 He is a recognized expert on pool electronics, saline systems, and filtration, as well as an authority on pool construction methods and approaches. 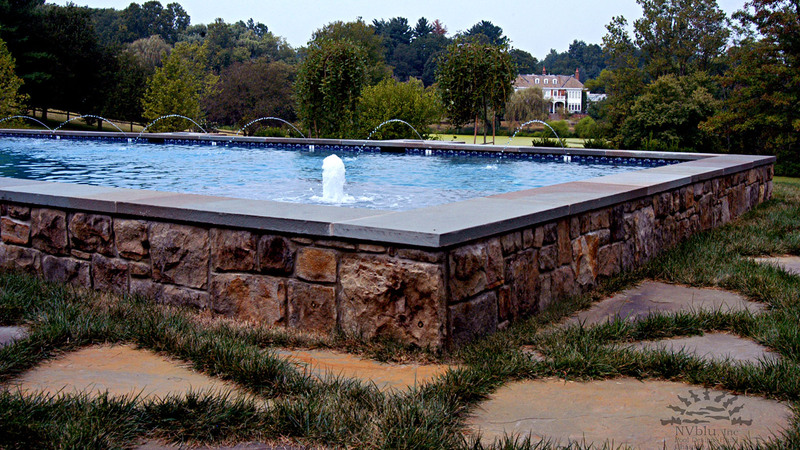 Robert has received significant training from the Genesis 3 Design School, employing many of their approaches, methods, and techniques to the company's many projects. 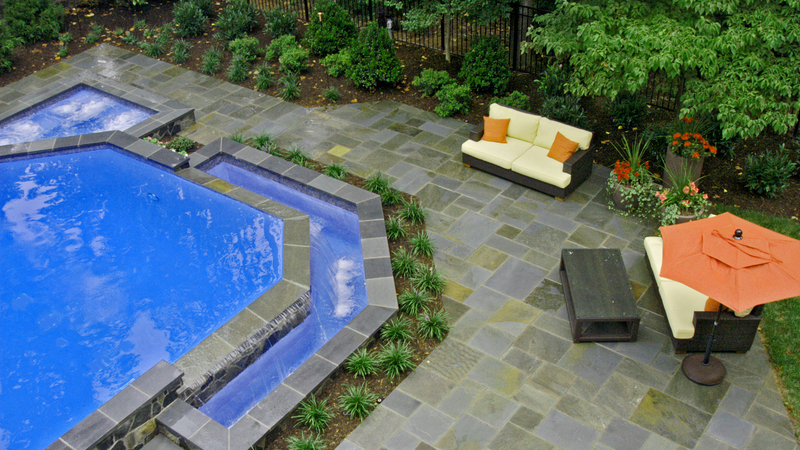 Unique designs tailored to your exact vision. 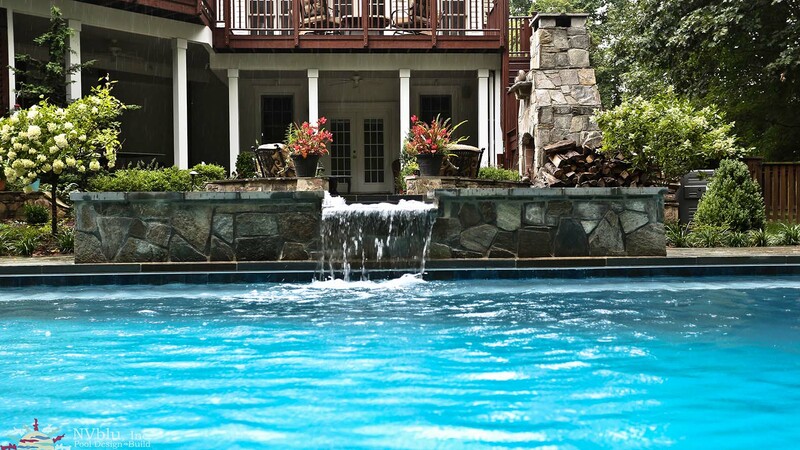 A pool is an extension of your home: A place to escape, a place to entertain, a place to find serenity and joy. 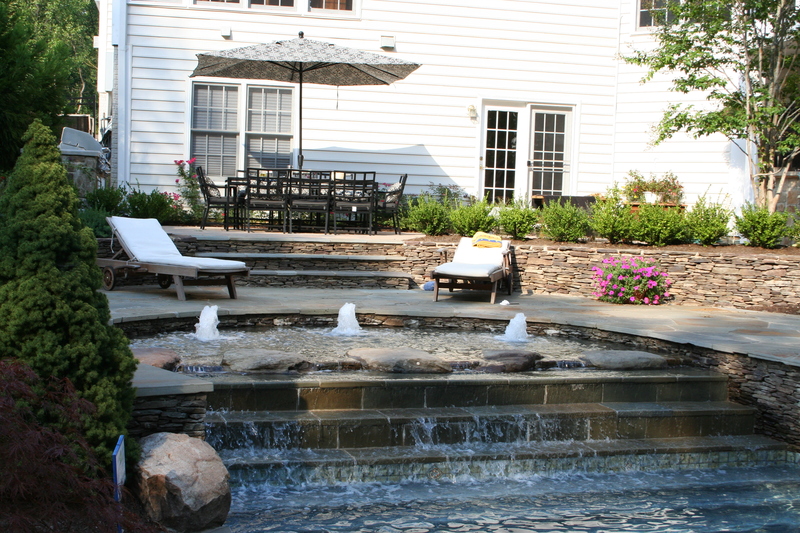 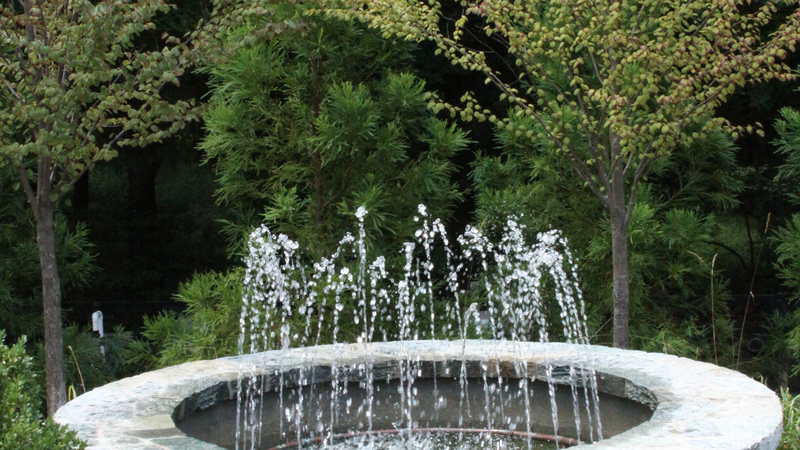 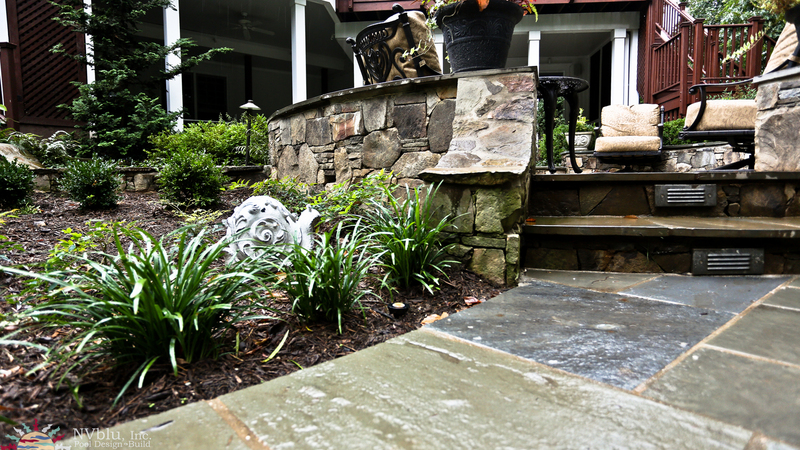 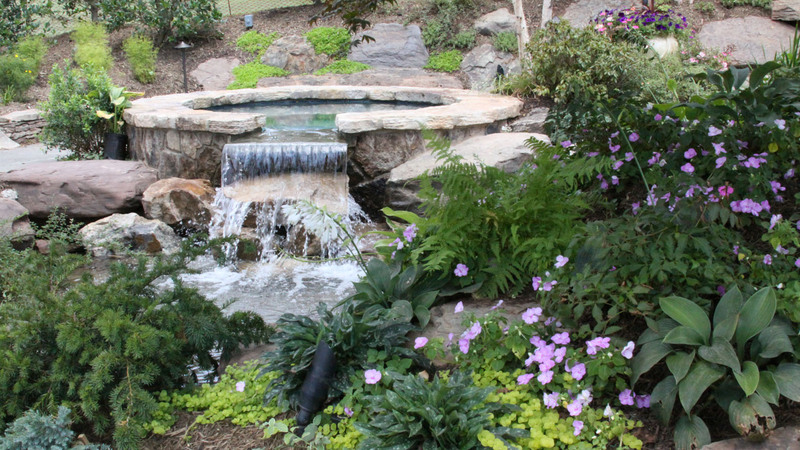 Our goal is to create a new and exciting living space where the design, landscaping and water elements all integrate seamlessly with your home and harmonize with the natural surroundings. 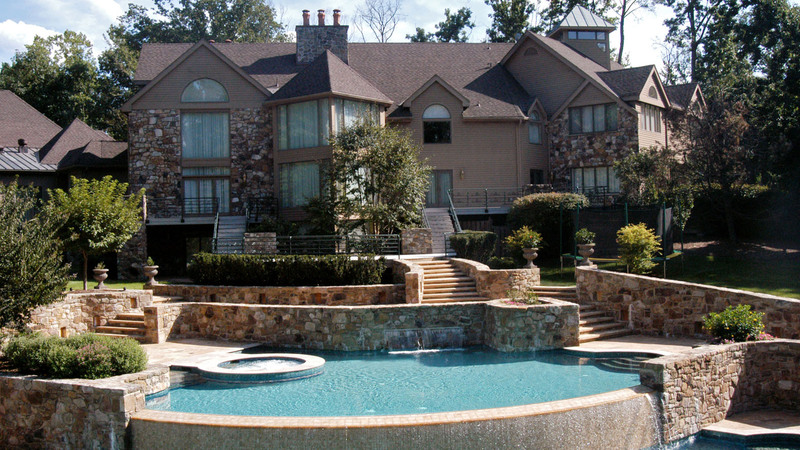 With you, we will prepare a unique plan tailored to reflect your vision and your lifestyle. 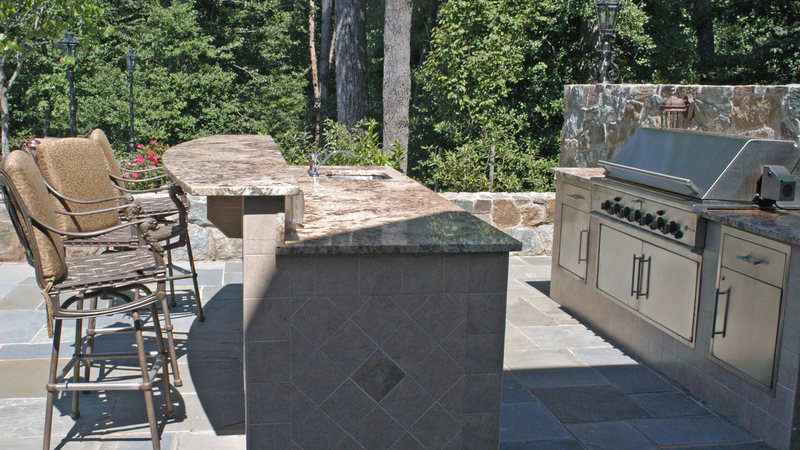 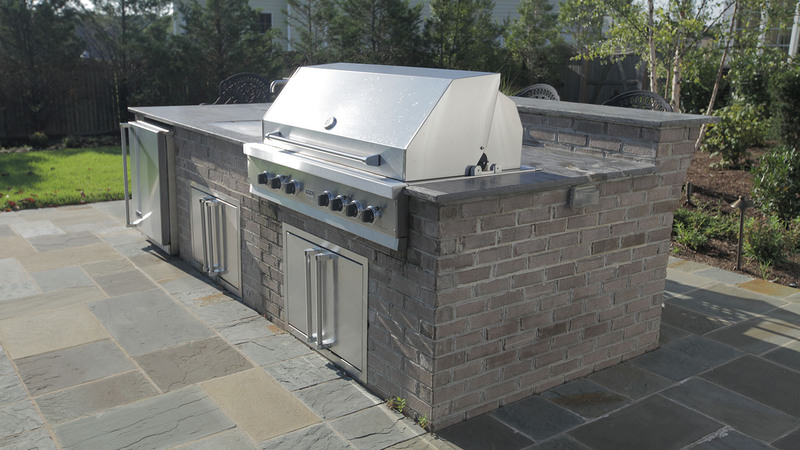 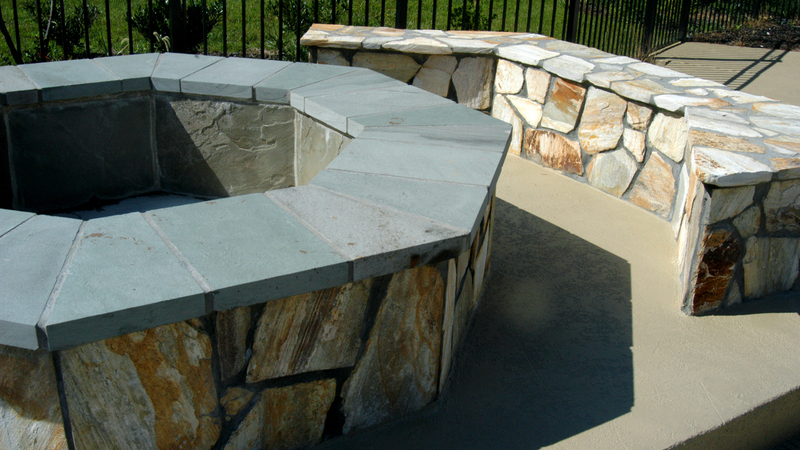 It all starts with a great design, brought to life through quality materials and superior construction. 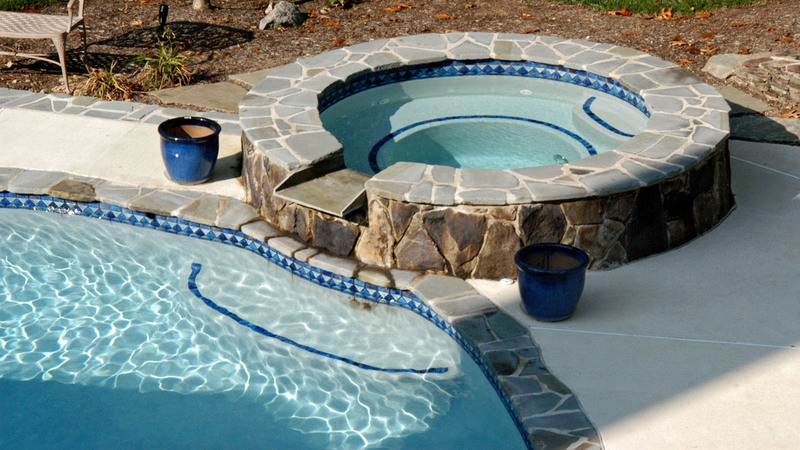 Unlike most pool builders who rely on subcontractors to do virtually all of their work, we build the heart of your pool ourselves. 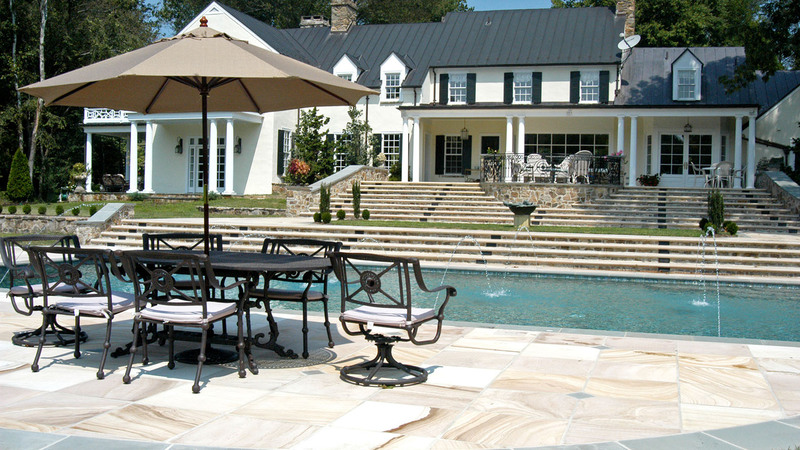 This approach ensures that the overall quality of construction is under our control. 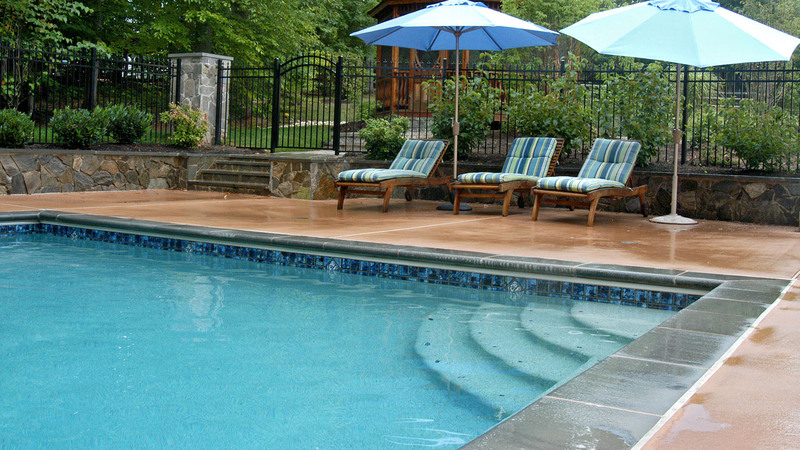 You can relax, knowing that our highly trained NVblu professionals will be on site to maintain our high standards. 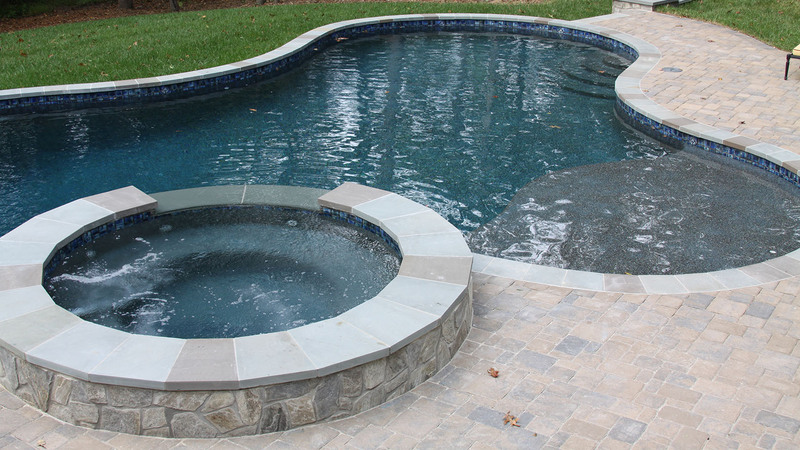 Our process is the result of over 30 years of experience. 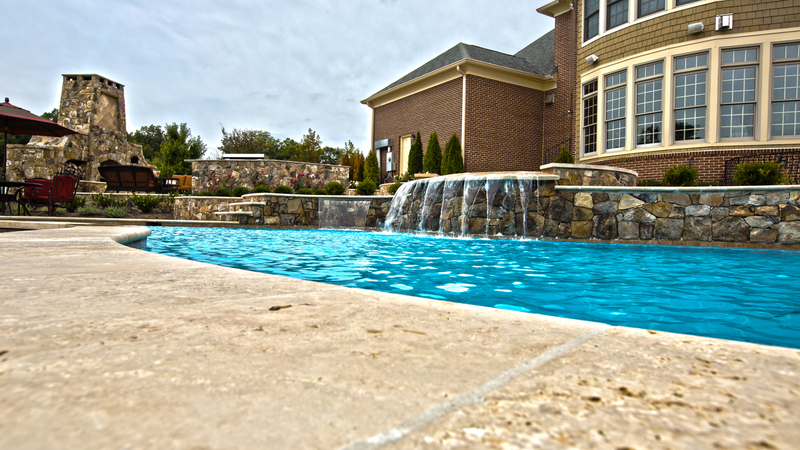 We've helped countless families successfully achieve their dream of pool ownership through listening and understanding. 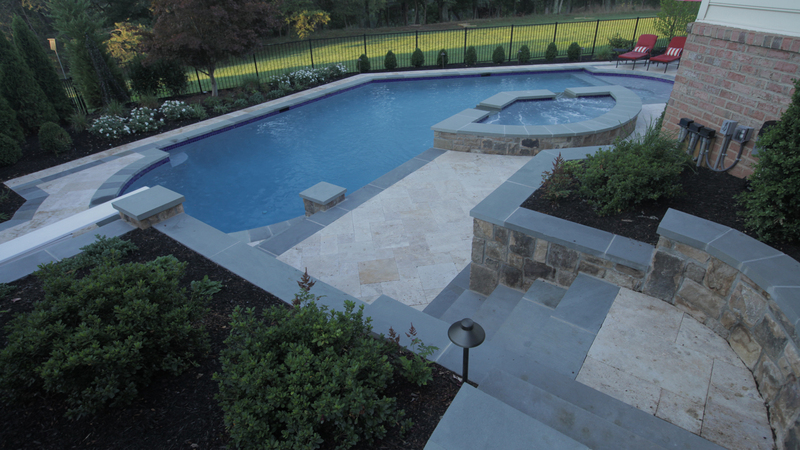 At NVblu, the first step to a satisfied customer is understanding our customers' dreams, desires and vision. 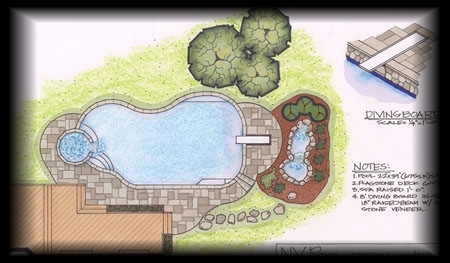 Every client receives a hand drawn unique design before we begin construction. 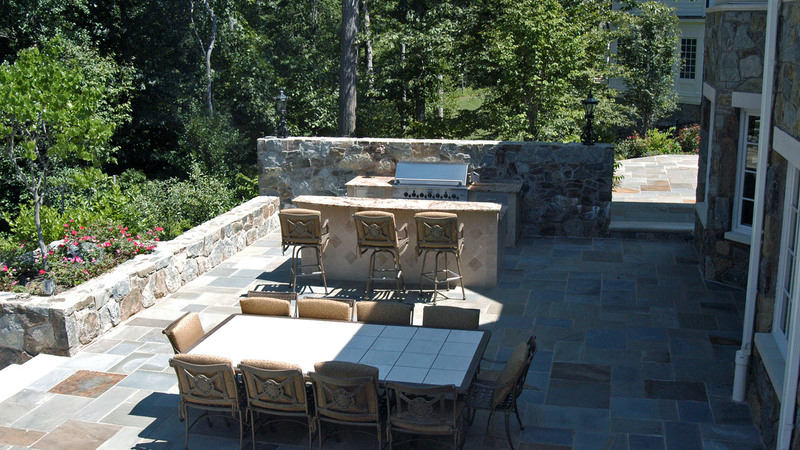 This allows for our clients to make revisions and improvements as is seen necessary. 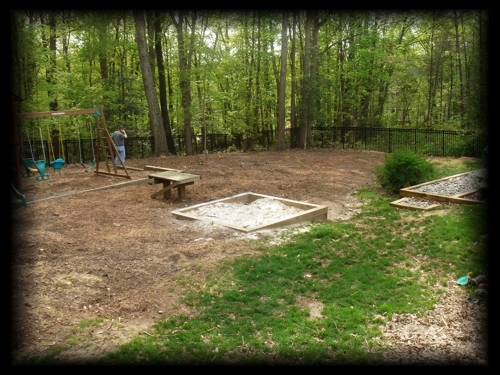 Once agreed upon we begin the layout. 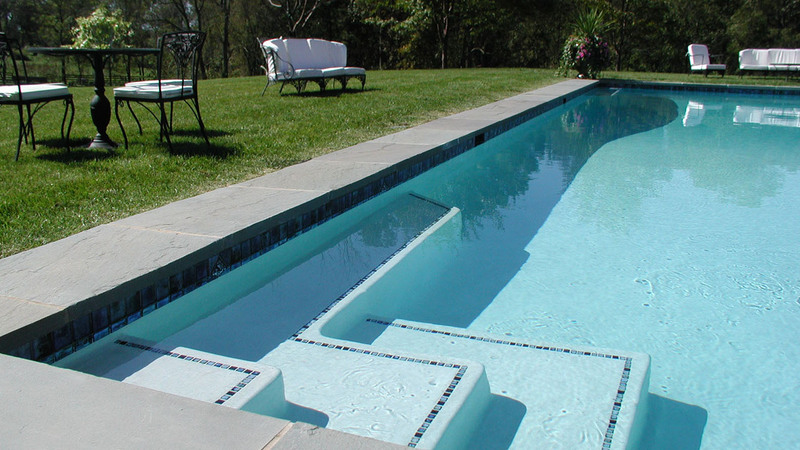 This is an exercise in marking the dimensions of the pool onto the proposed site area. 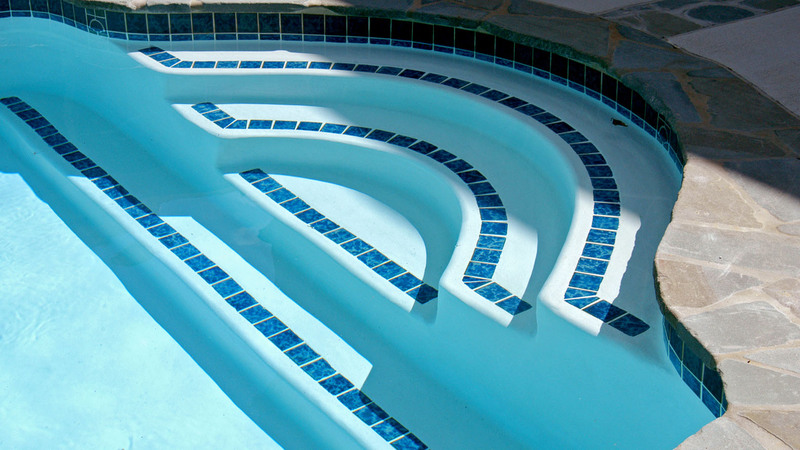 This is a great way to see the outlines of the actual size and shape of the pool. 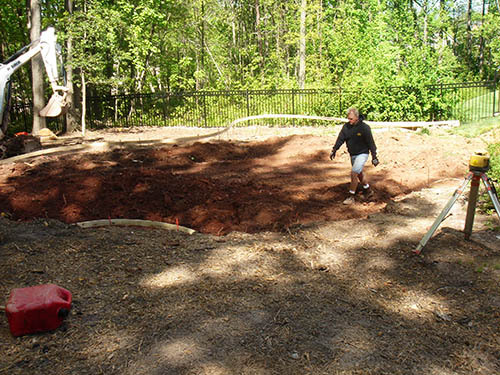 Further, a final opportunity to adjust sizes and exact pool location before we actually break ground with excavation. 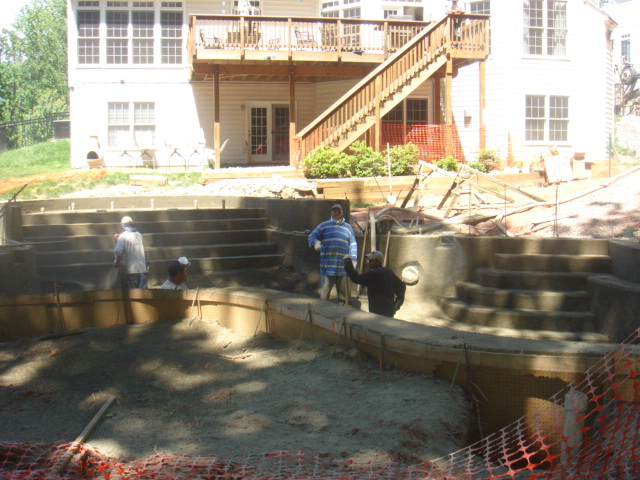 This is an exciting process of removing the earth and preparing the site for the pool construction. 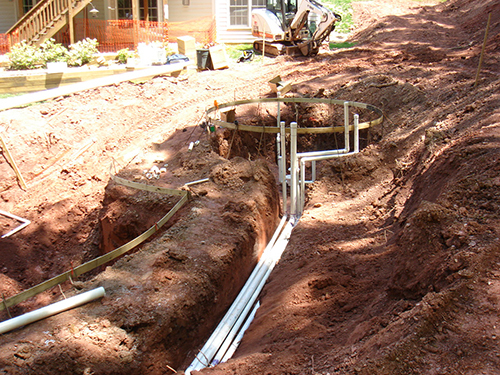 This part is always a bit uneasy for the homeowner, because it is visually rough - steel beams and wood are put in place to prepare for the pouring of the concrete or gunite. 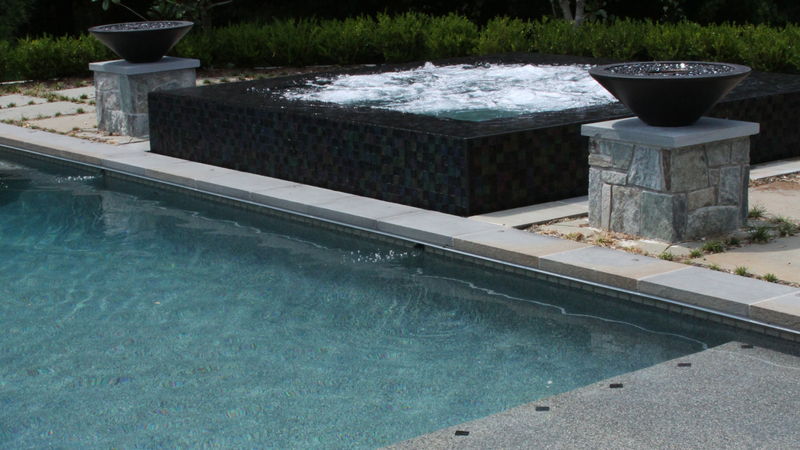 Before the gunite is shot into the pool, we install all the plumbing and electrical; insuring that all plumbing is pressure tested and that the electrical is up to code. 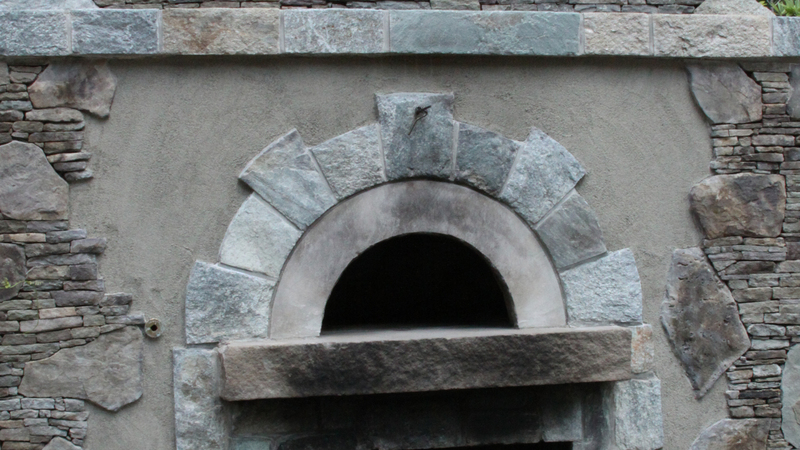 This is very exciting to see. 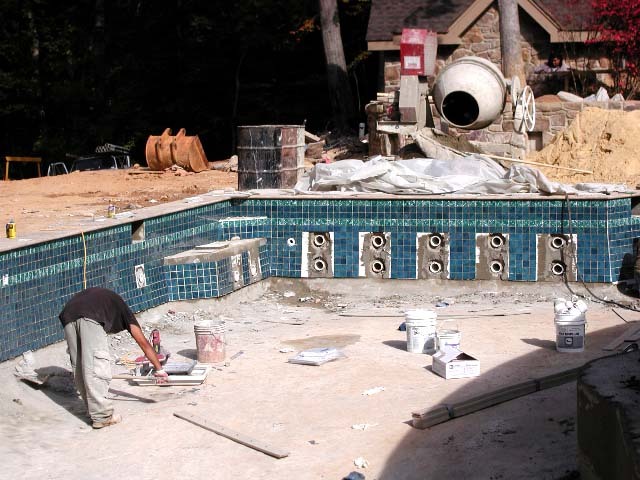 Usually this involves a large team of men that work diligently to create the tough inner shell of your new pool. 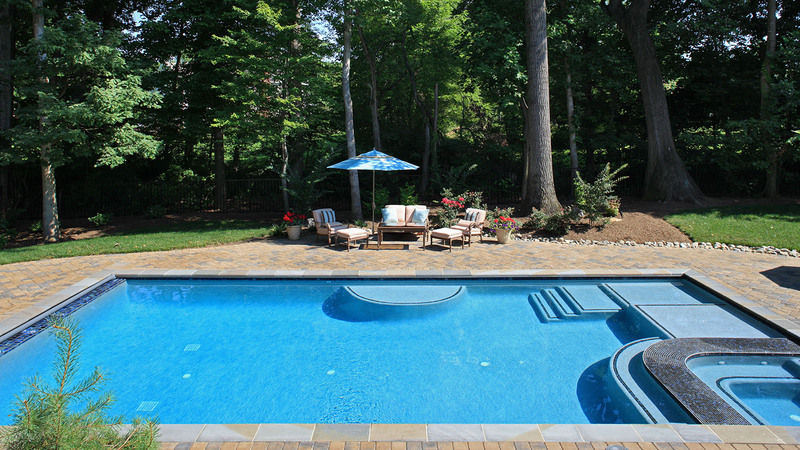 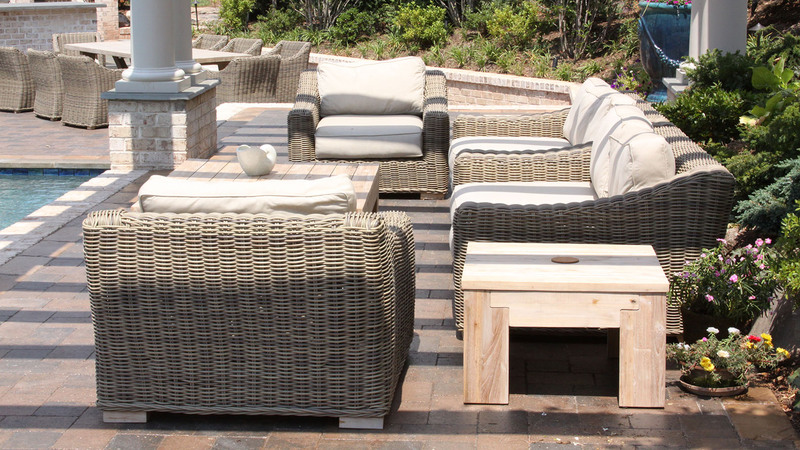 The decking is the area surrounding your pool. 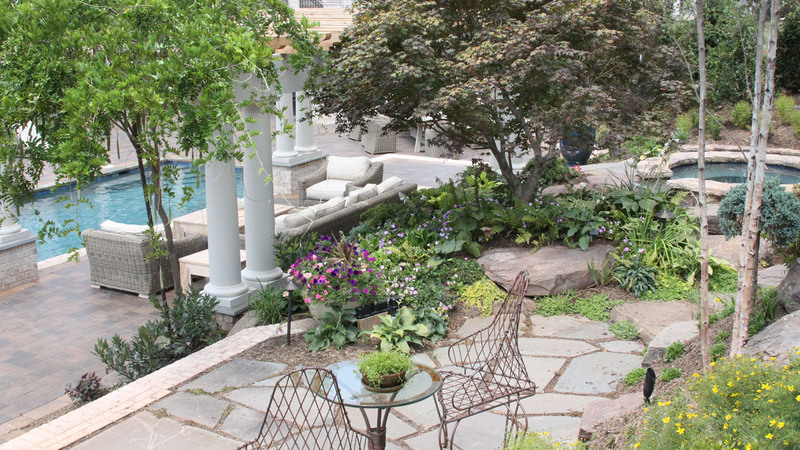 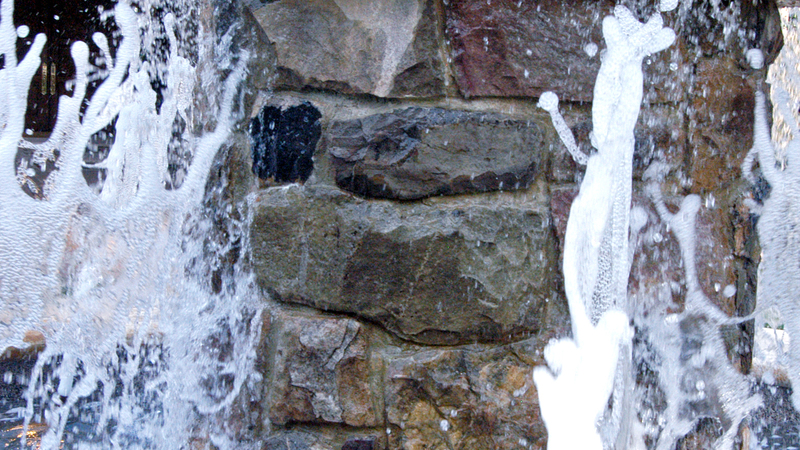 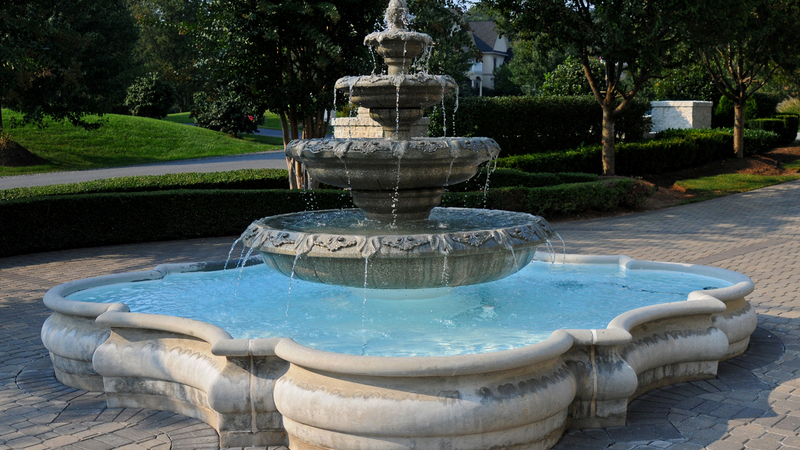 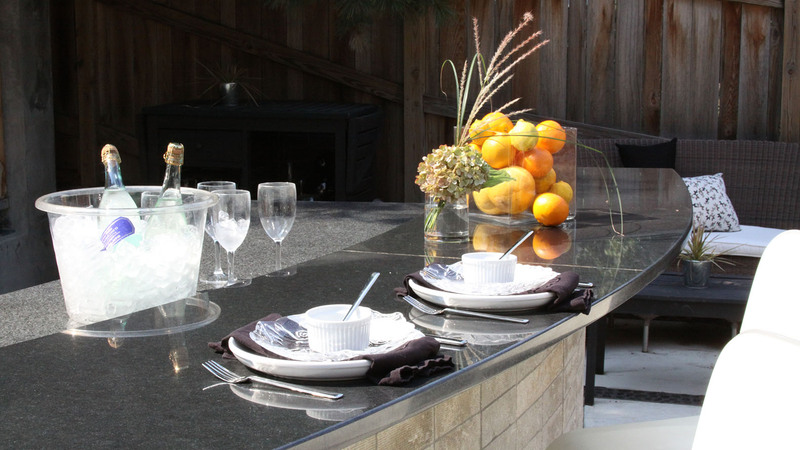 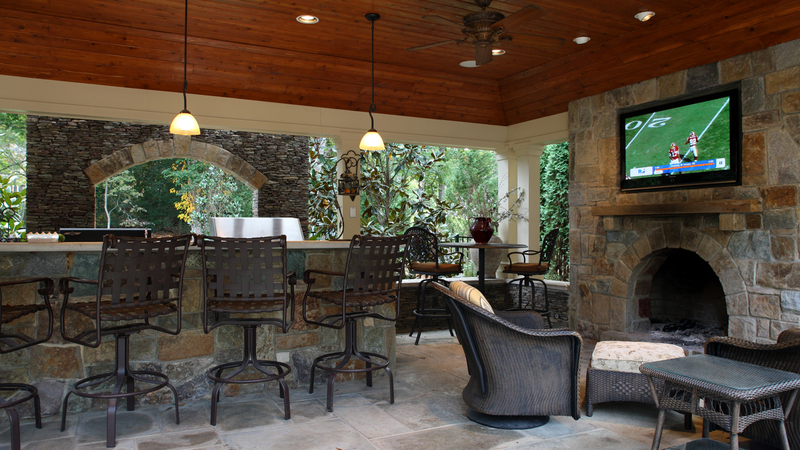 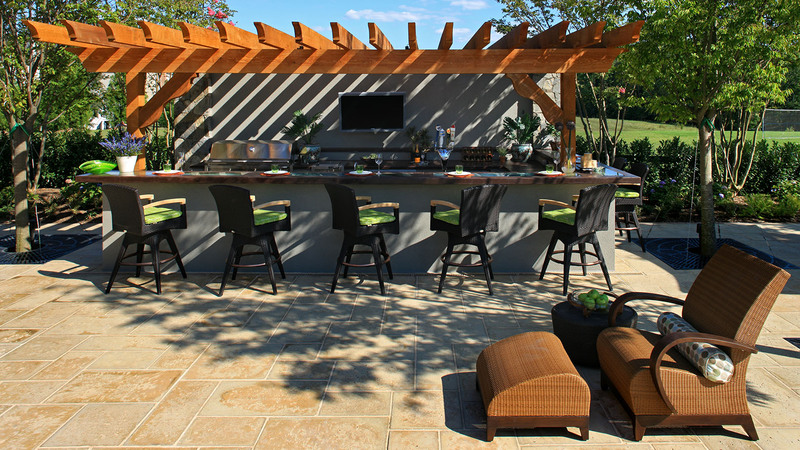 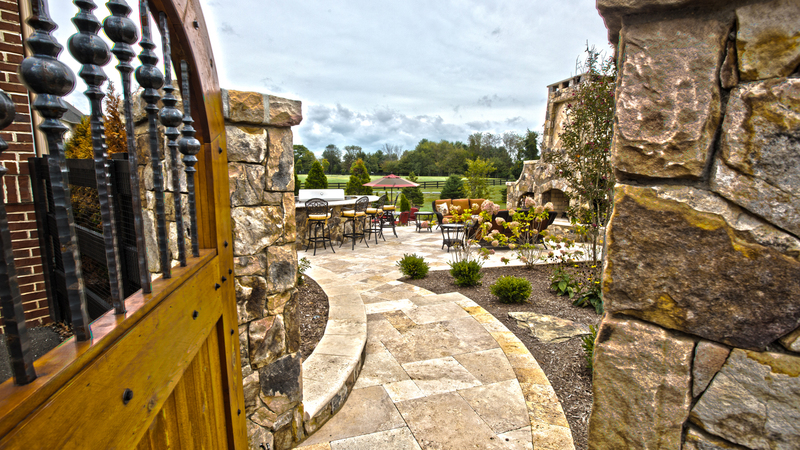 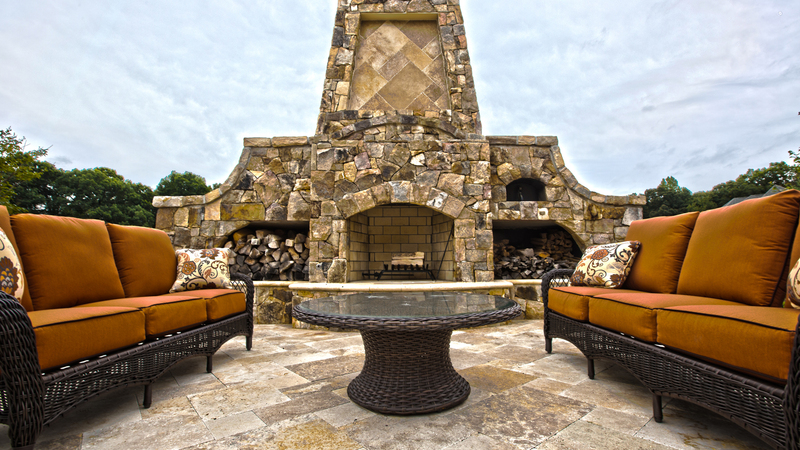 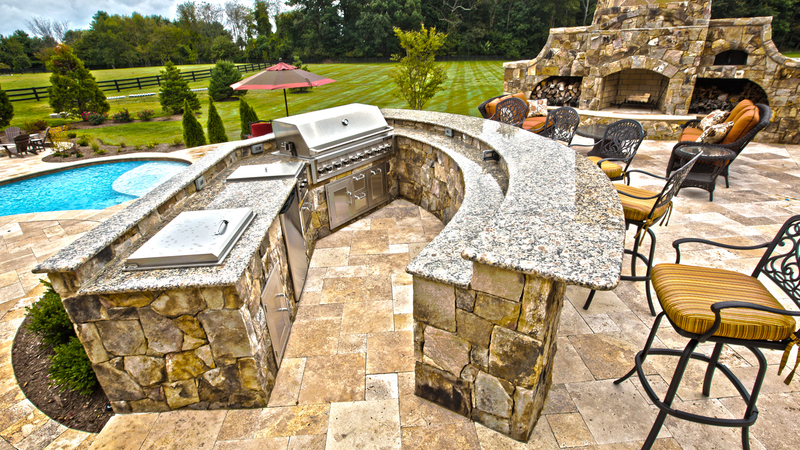 This can involve elaborate architectural features, such as outdoor fireplaces, covered patios, natural stone seating areas, fountains and water features. 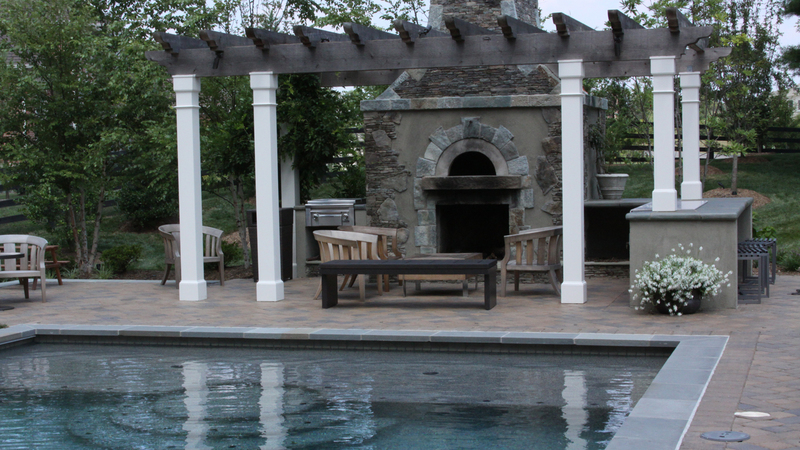 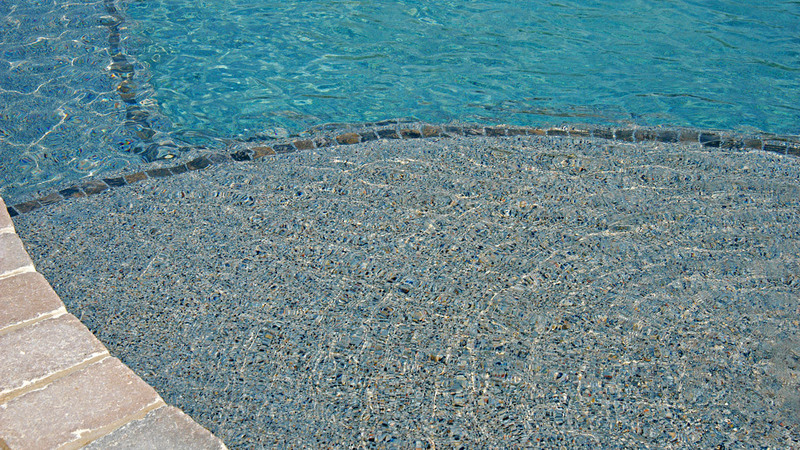 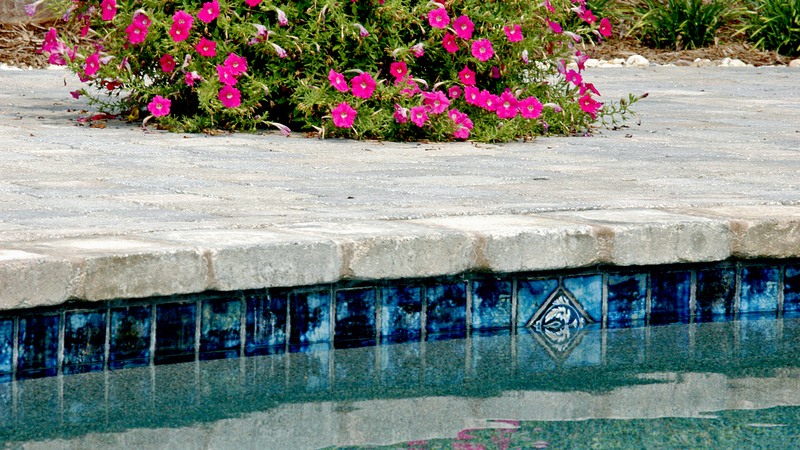 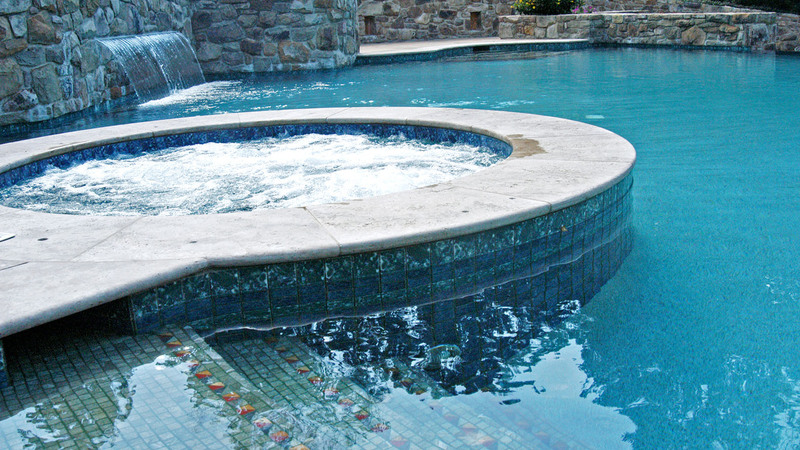 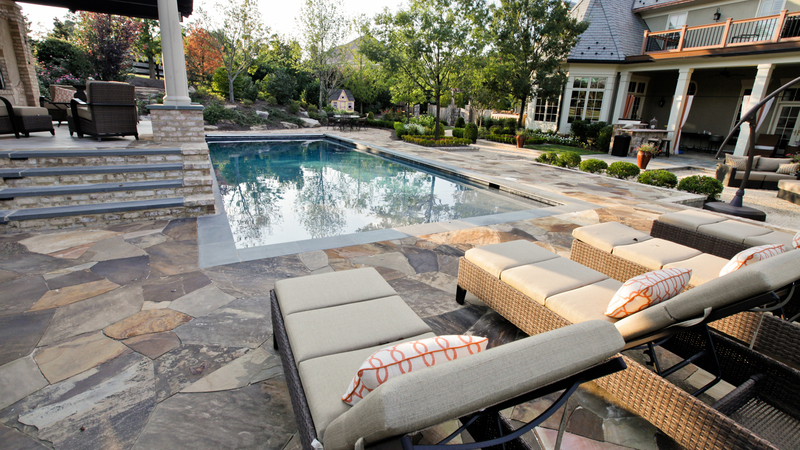 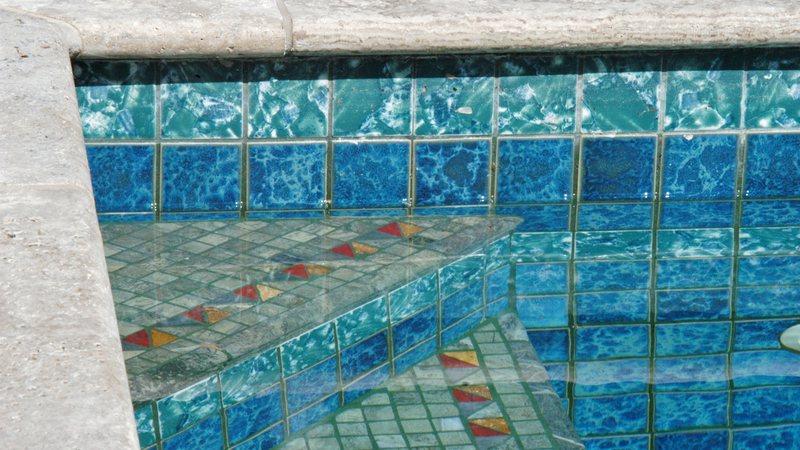 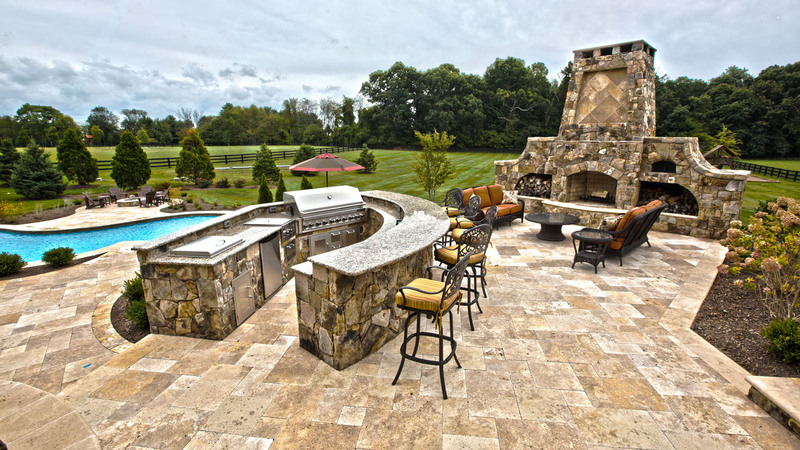 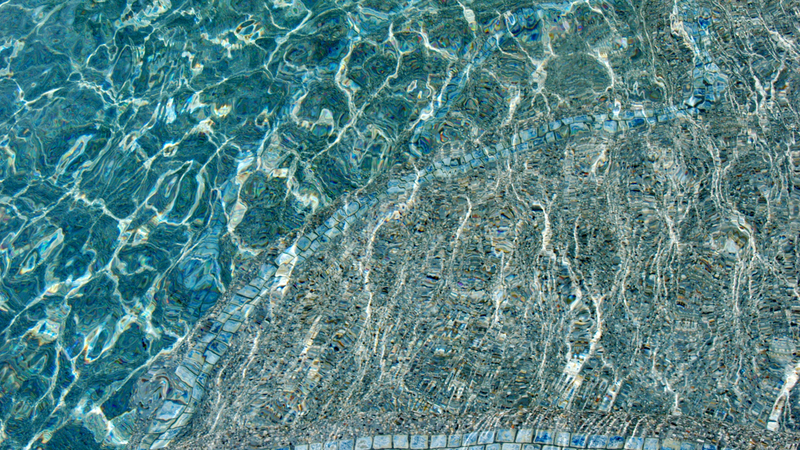 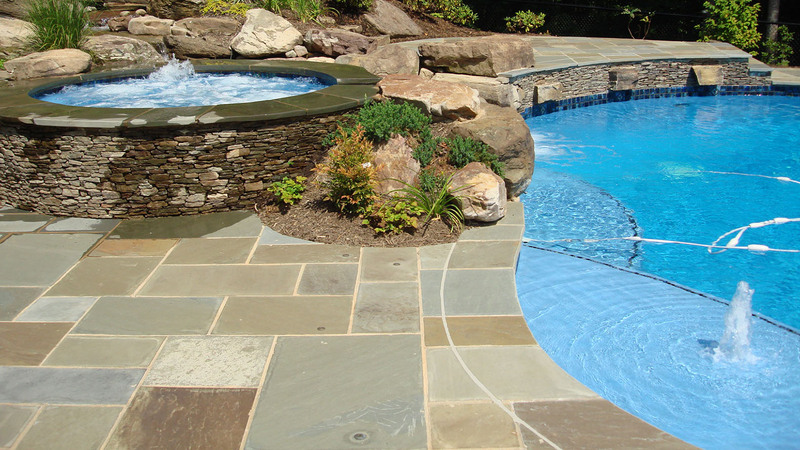 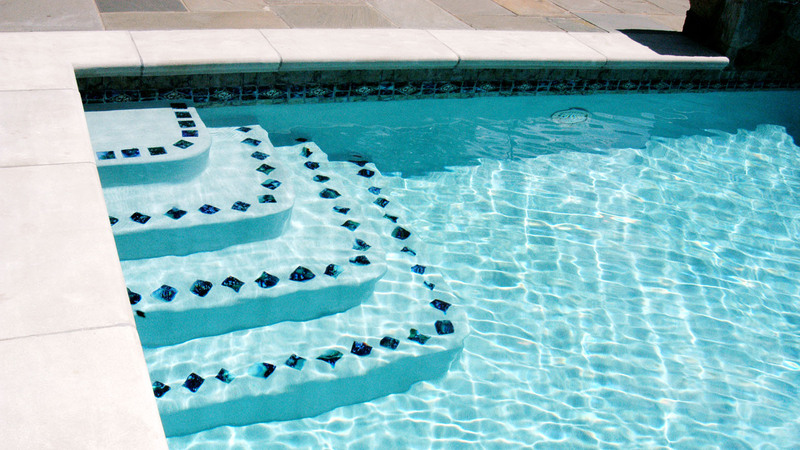 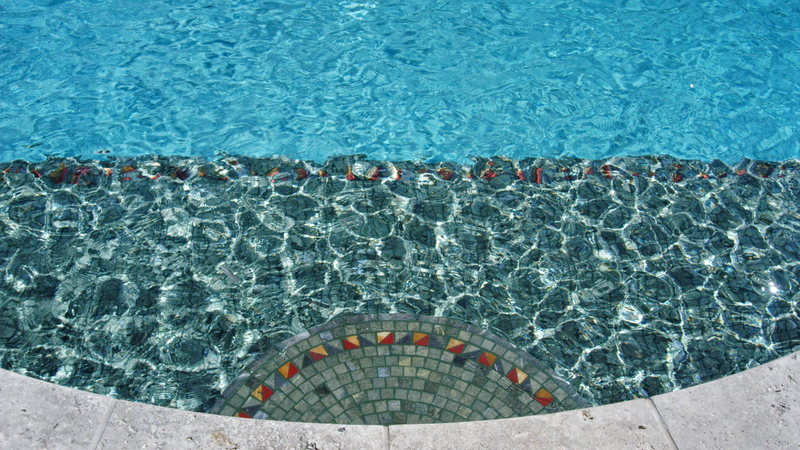 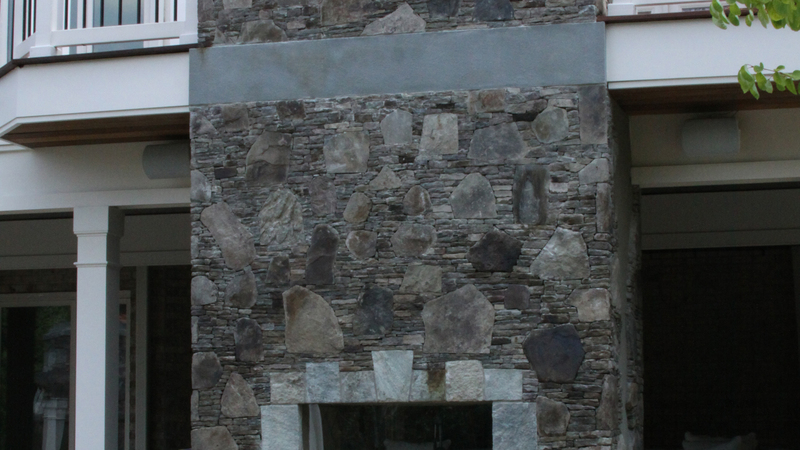 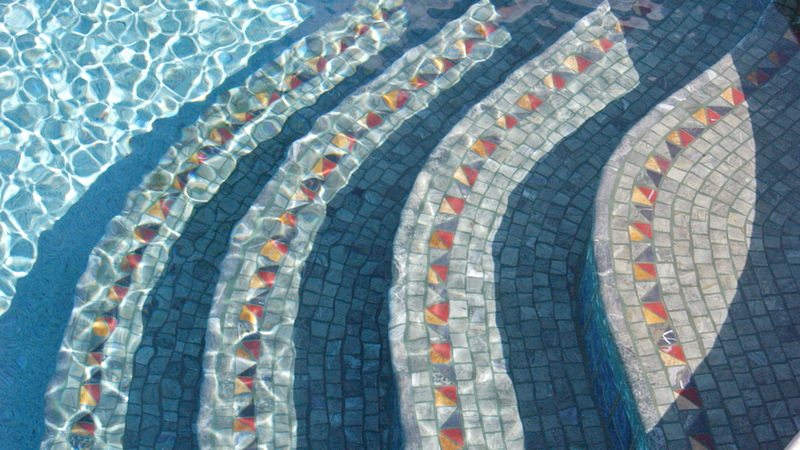 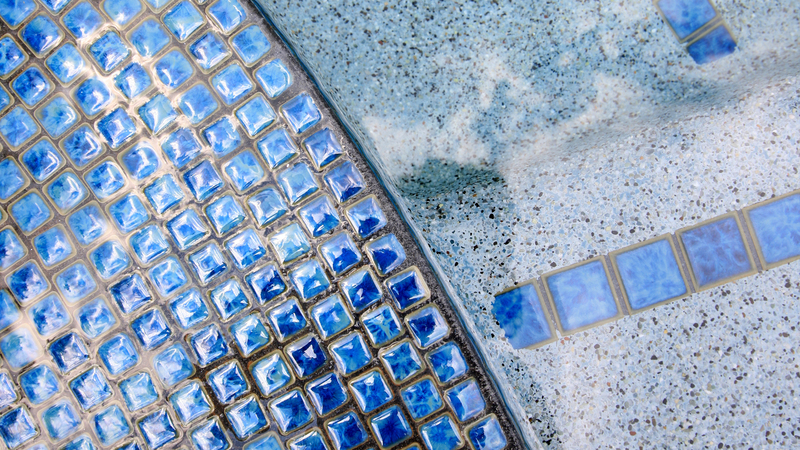 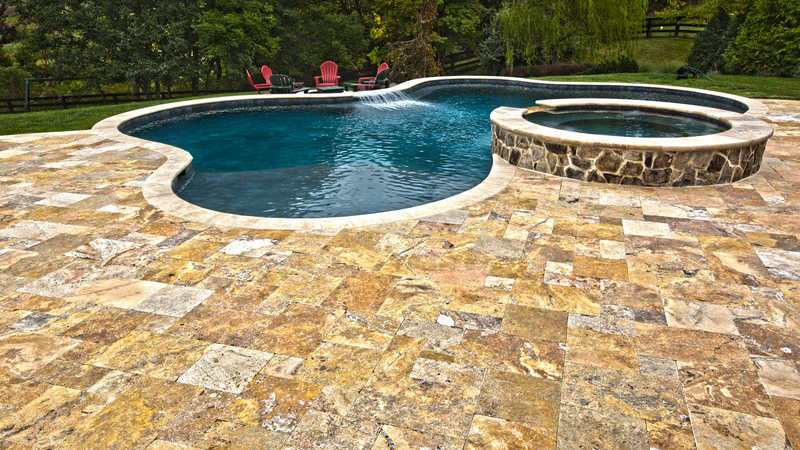 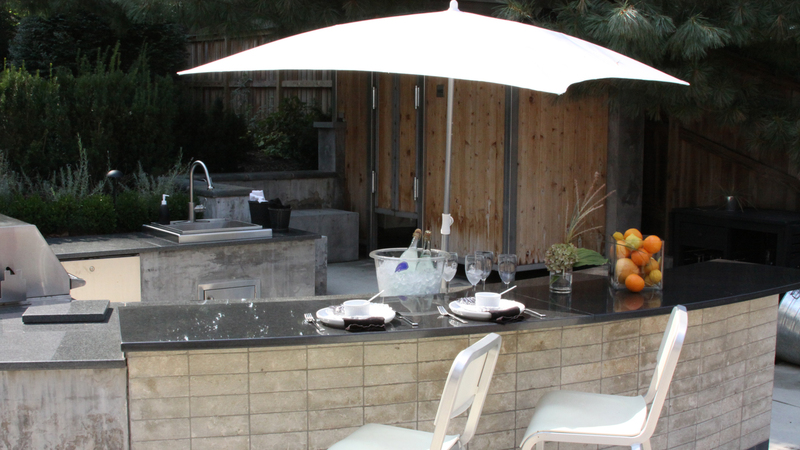 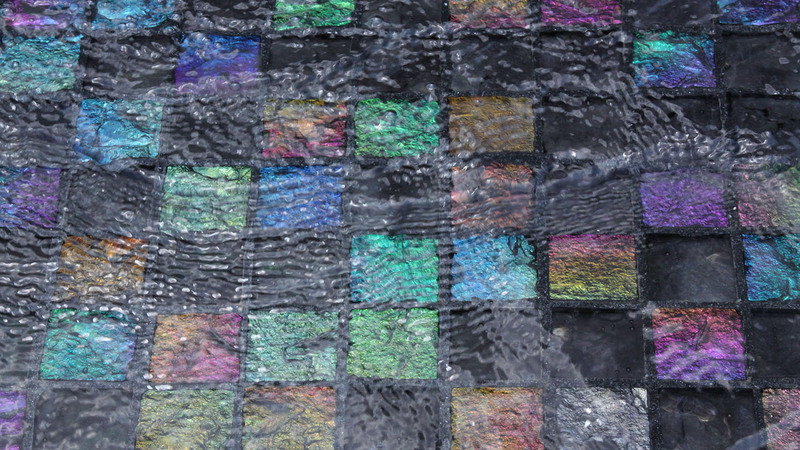 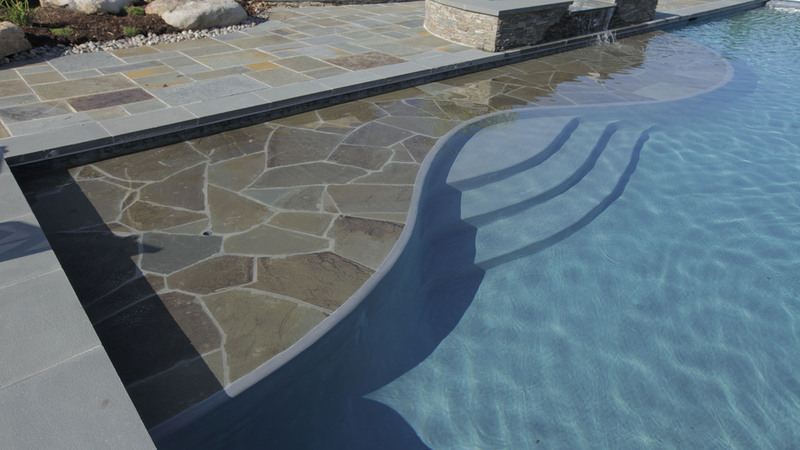 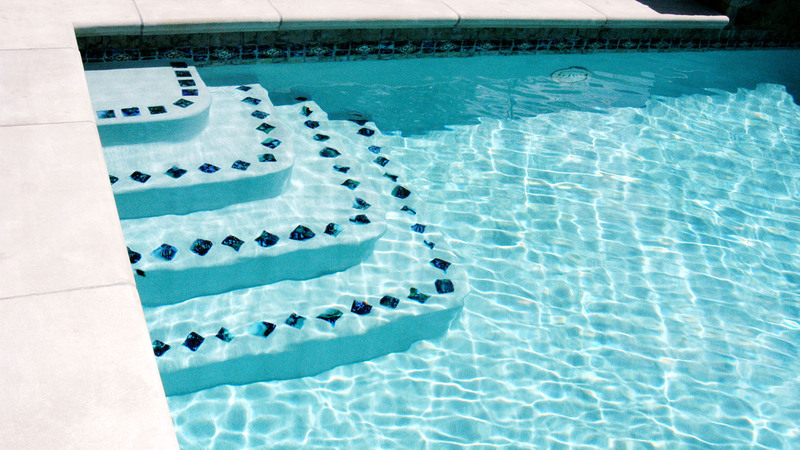 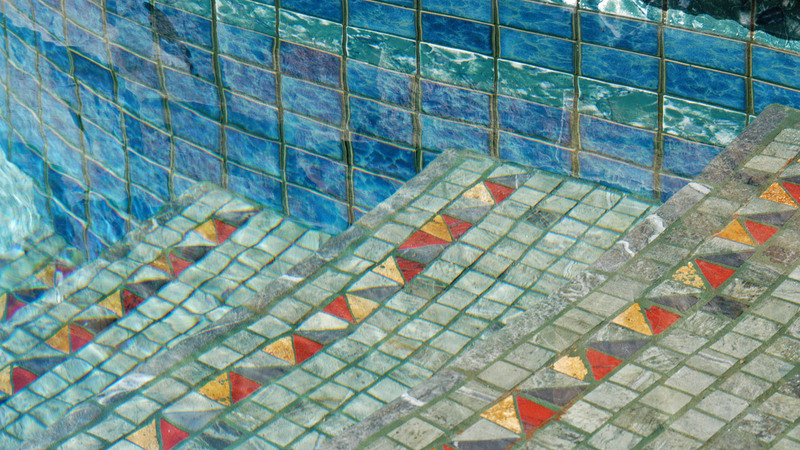 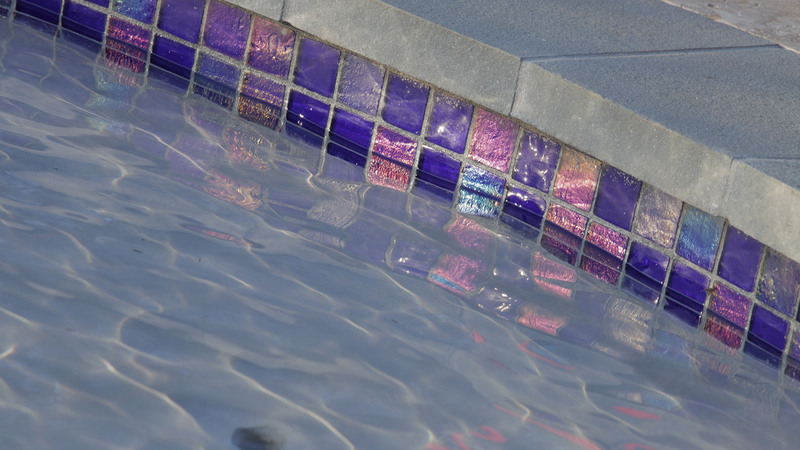 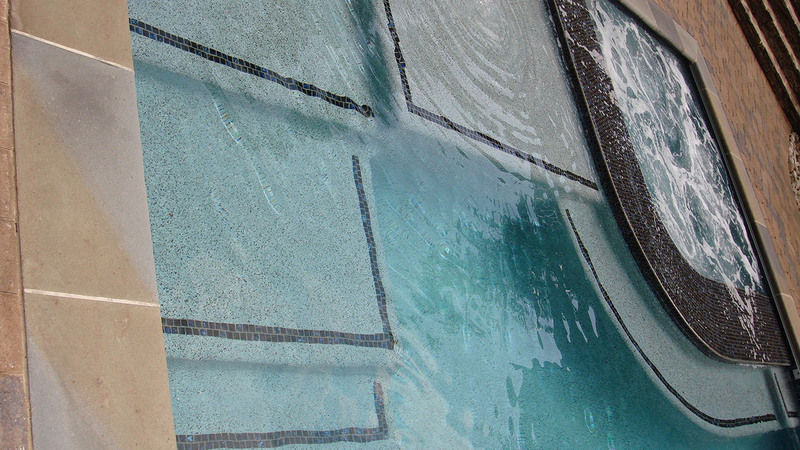 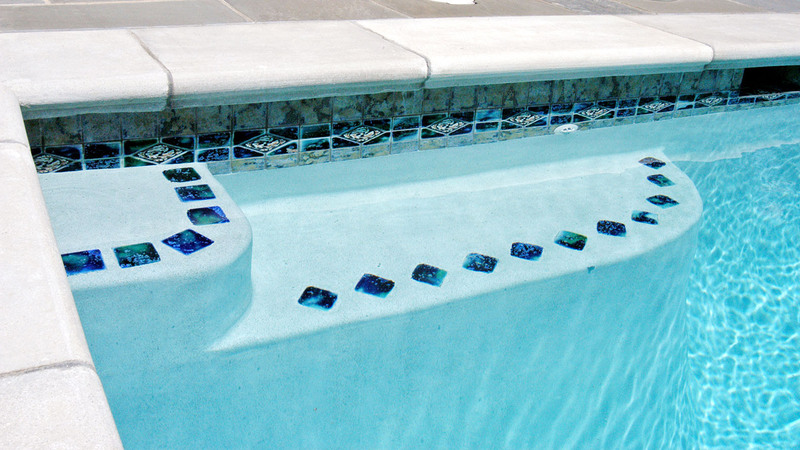 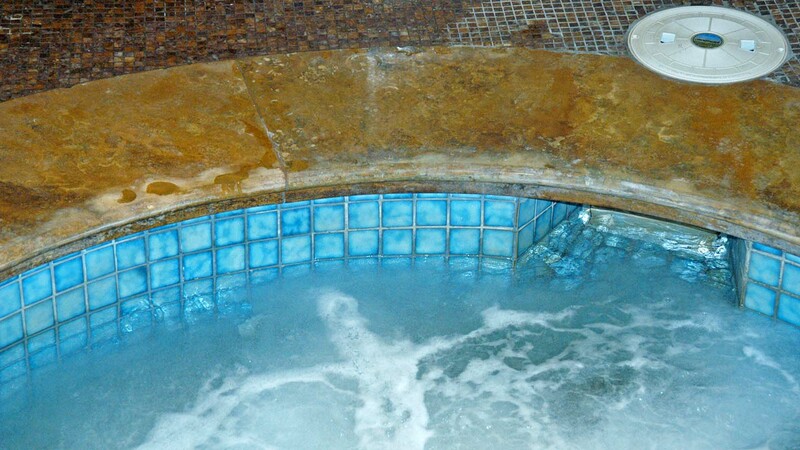 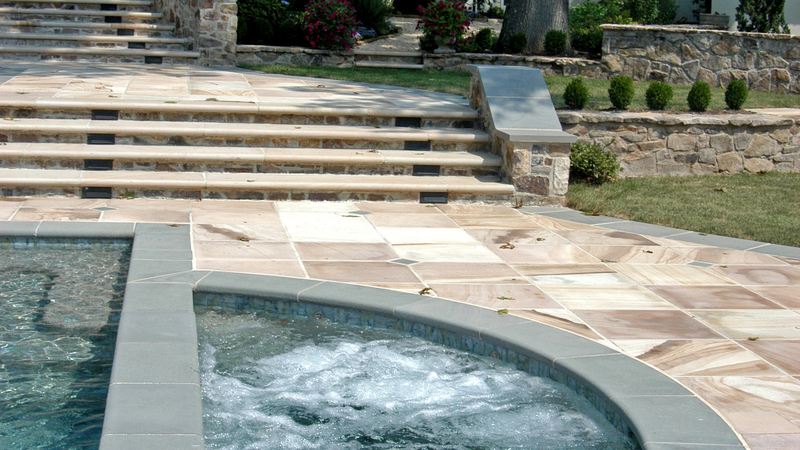 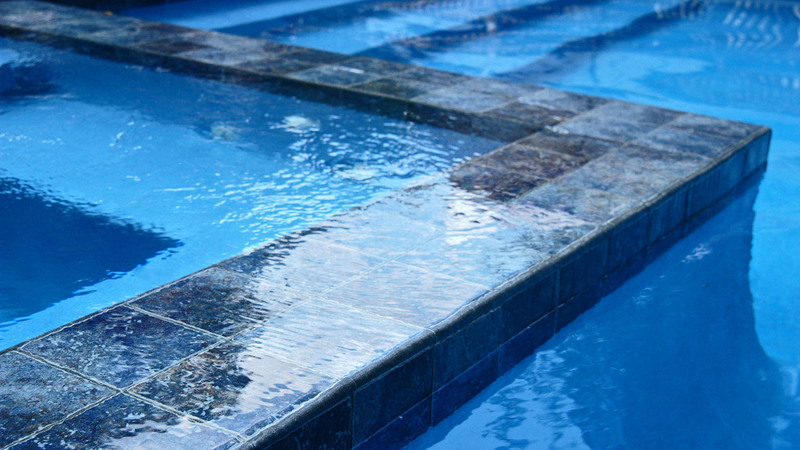 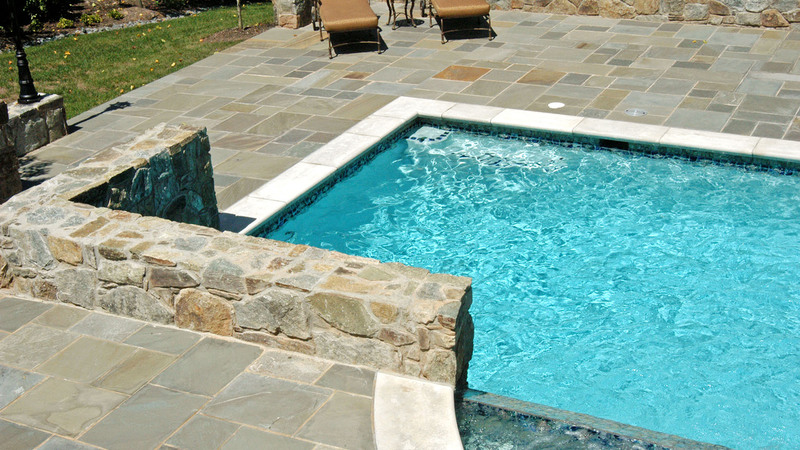 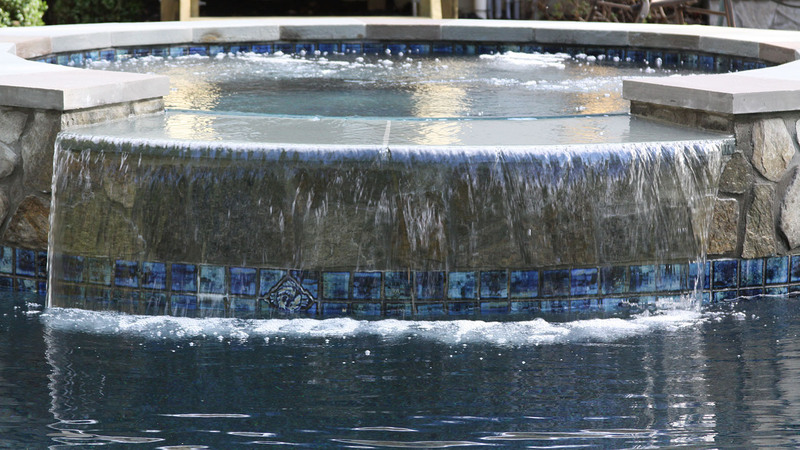 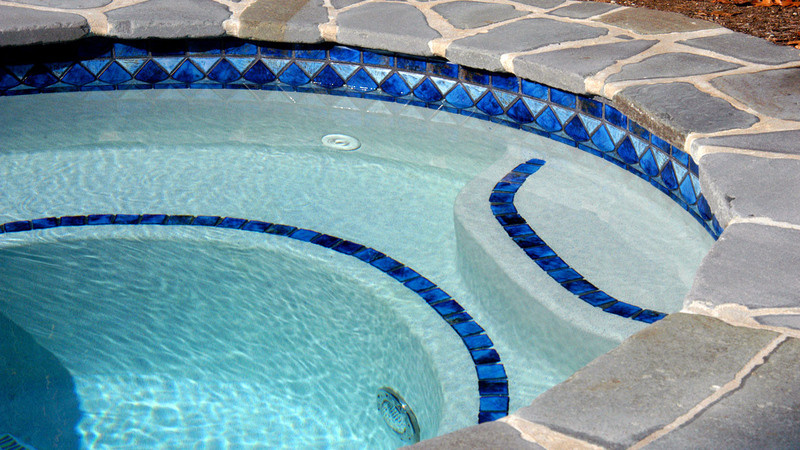 Today pool construction has a tremendous selection of natural stone tiles, slates, ceramics, and mosaics. 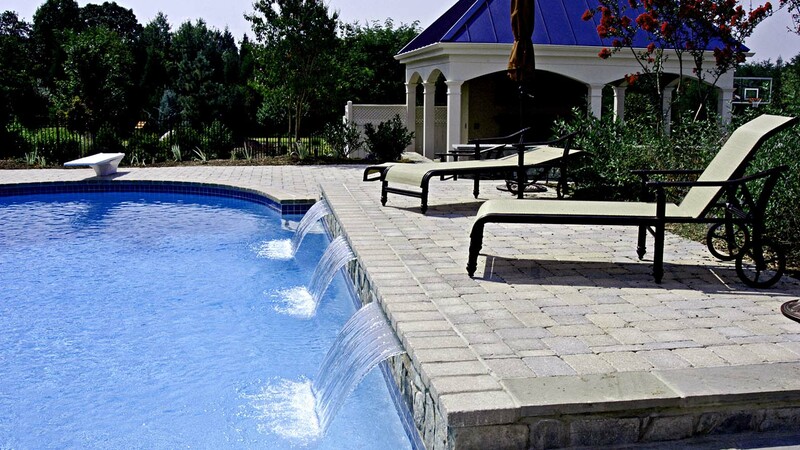 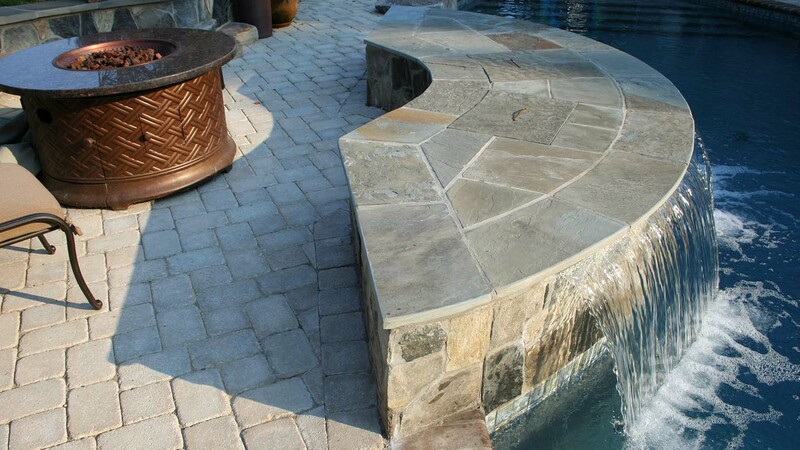 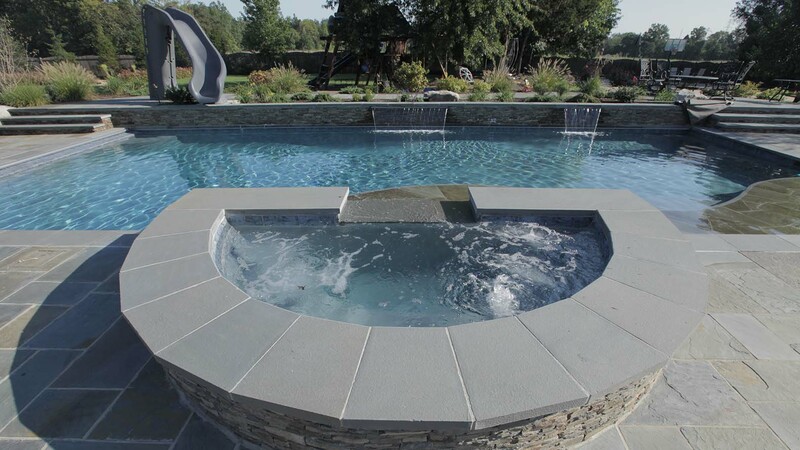 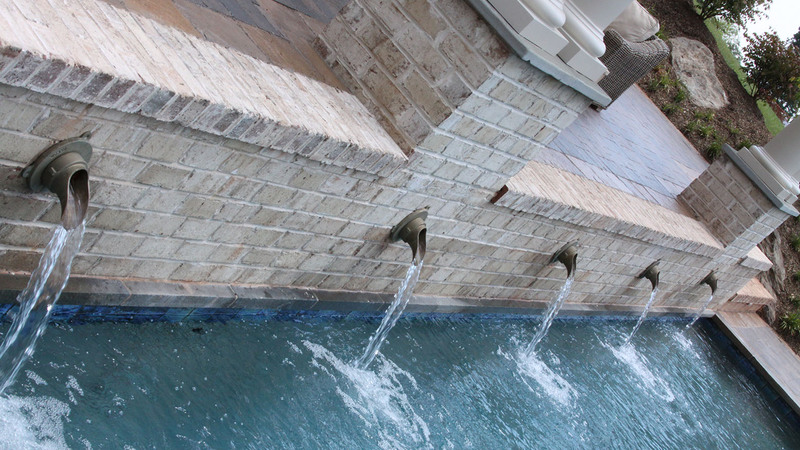 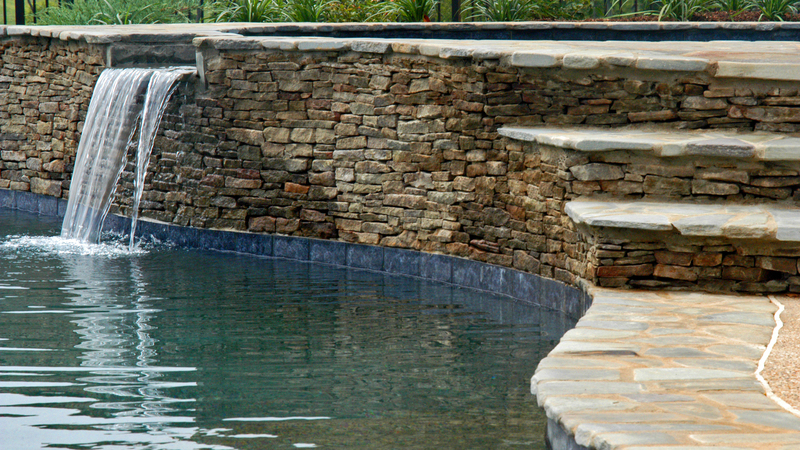 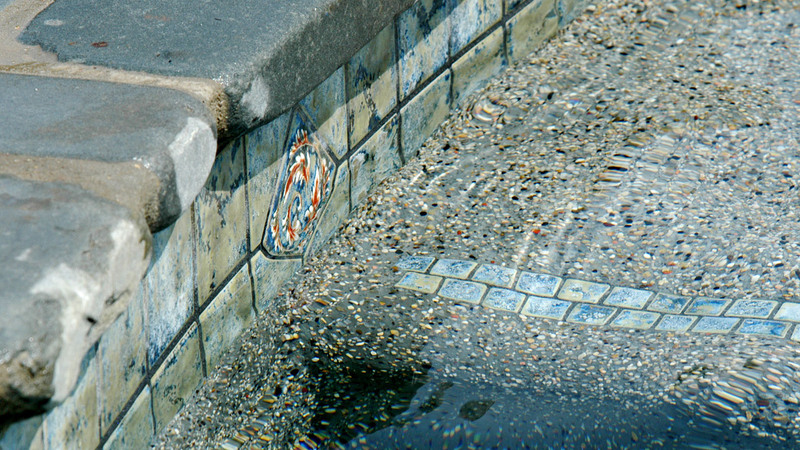 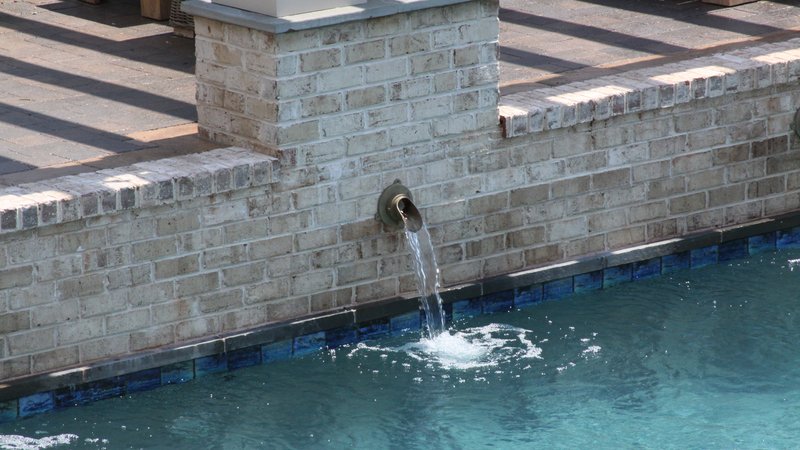 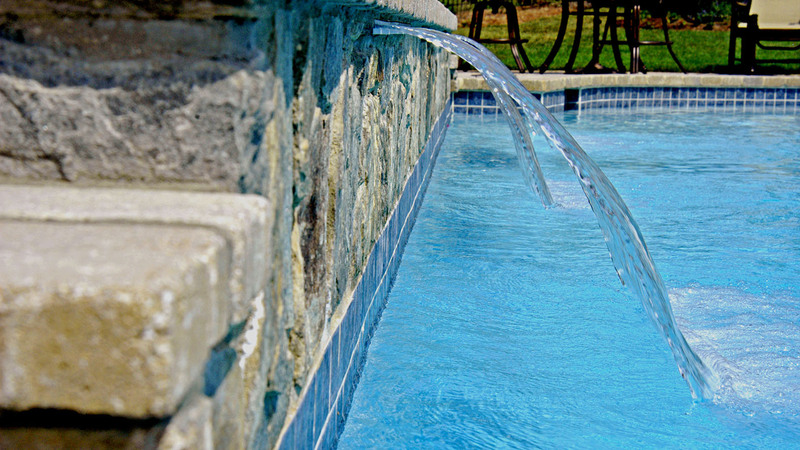 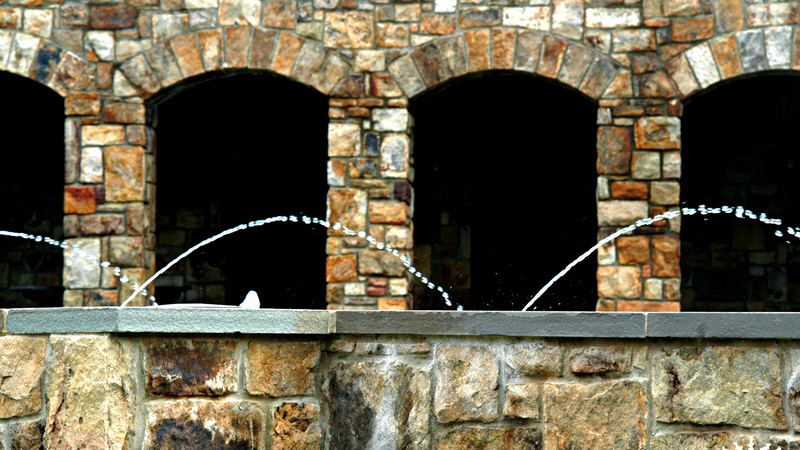 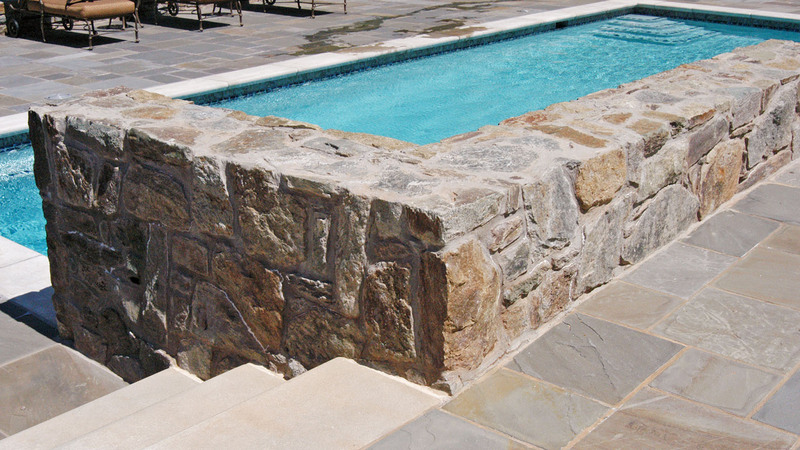 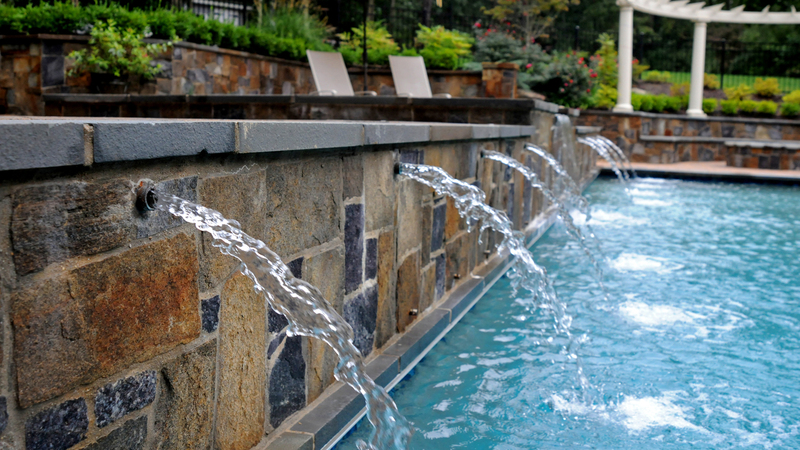 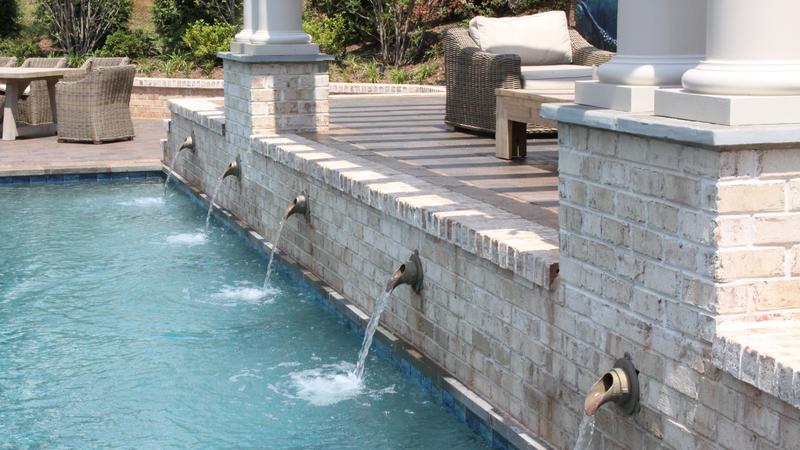 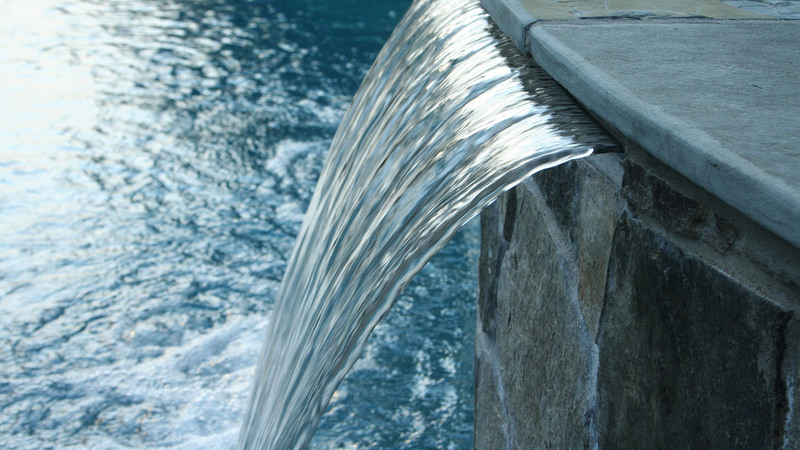 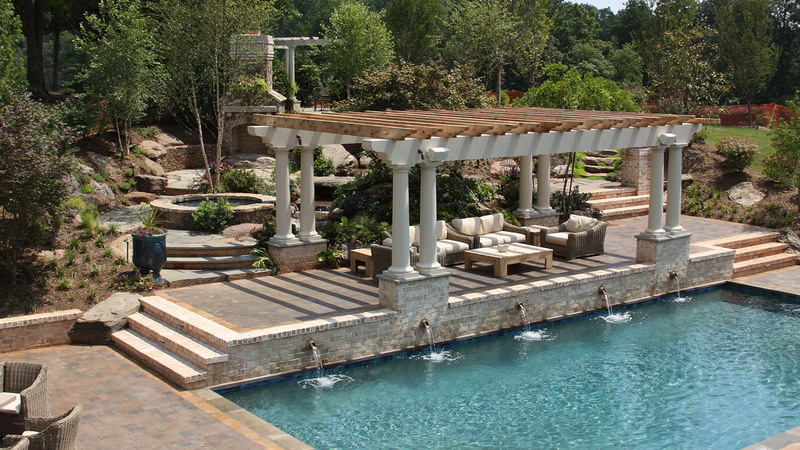 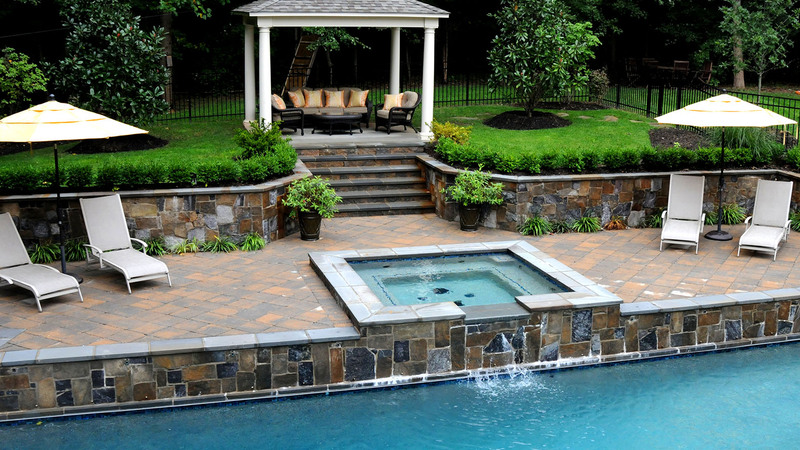 The pool coping (pool edge material) is usually crafted from natural limestone, but can be crafted from brick, cement, or an assortment of other materials. 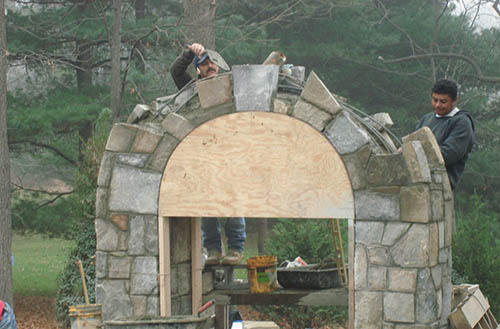 Our masons are very hard working and proud of their craft. 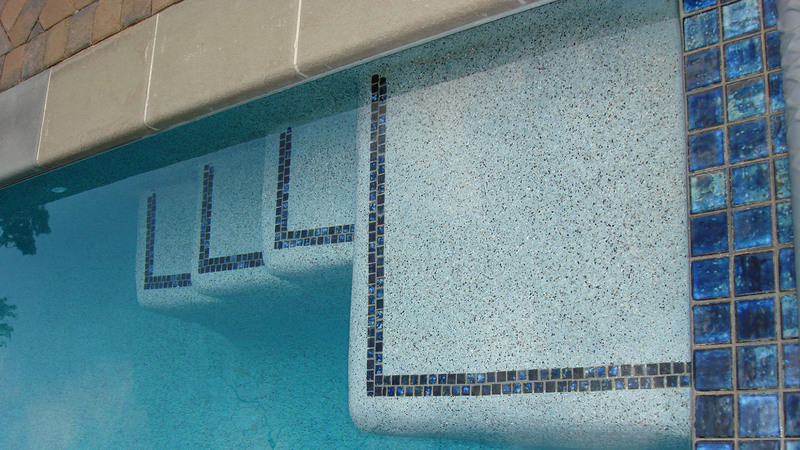 We take great measures to monitor quality control during the installation process to assure it is built to last. 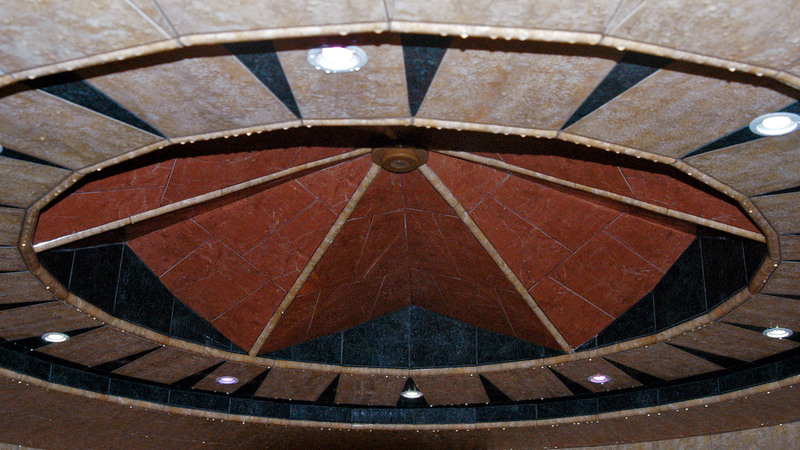 Plaster is a very difficult and fast process. 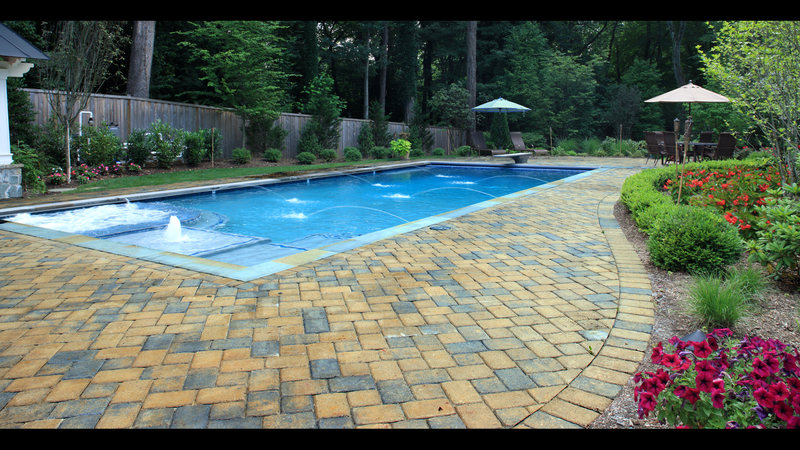 It is blown onto the gunite and requires a very quick and hard working crew to smooth the surface to assure a beautiful finish. 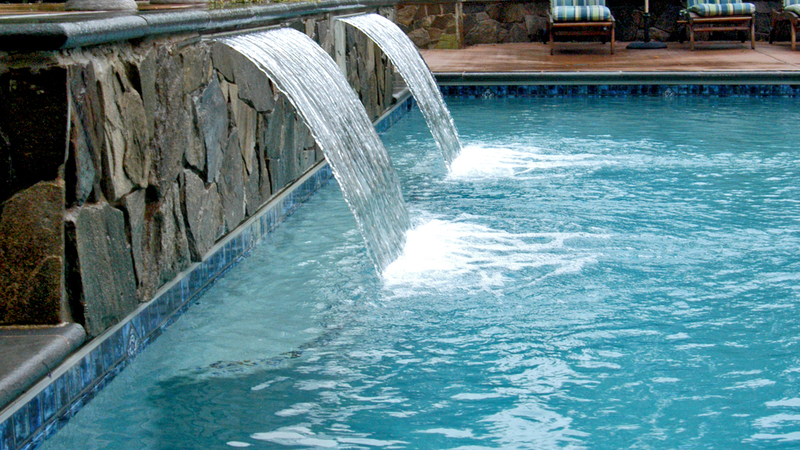 The pool is then filled with water immediately. 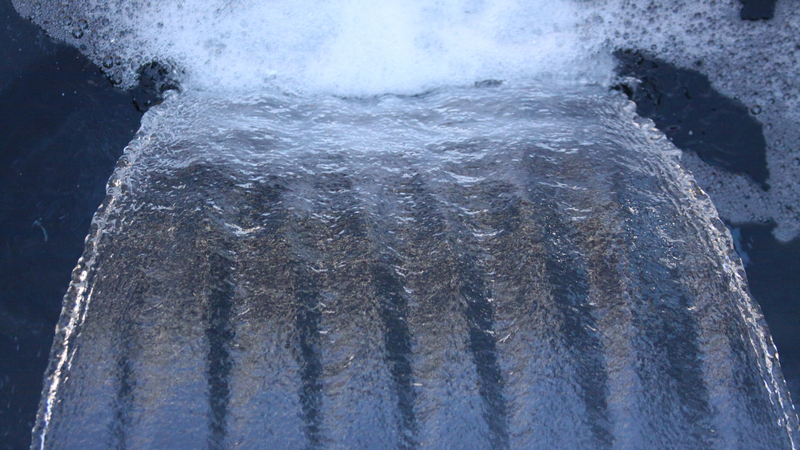 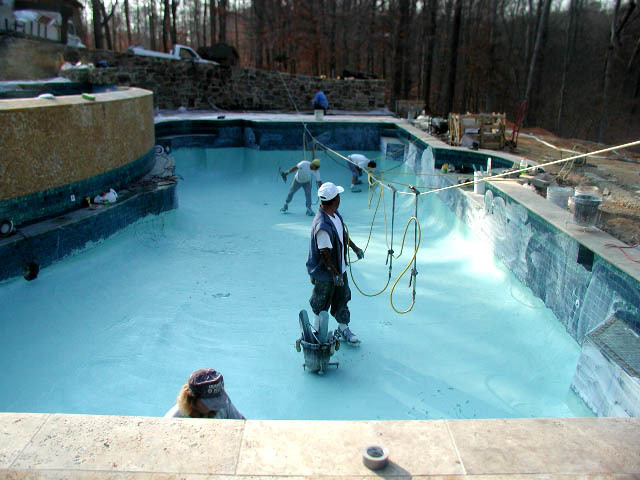 The next week requires the homeowners to diligently brush the pool to ensure the smoothest surface possible. 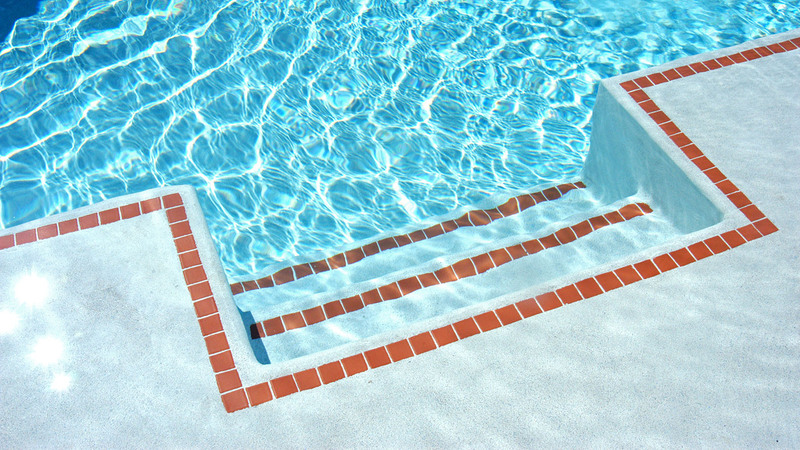 This step is critical and can t be avoided. 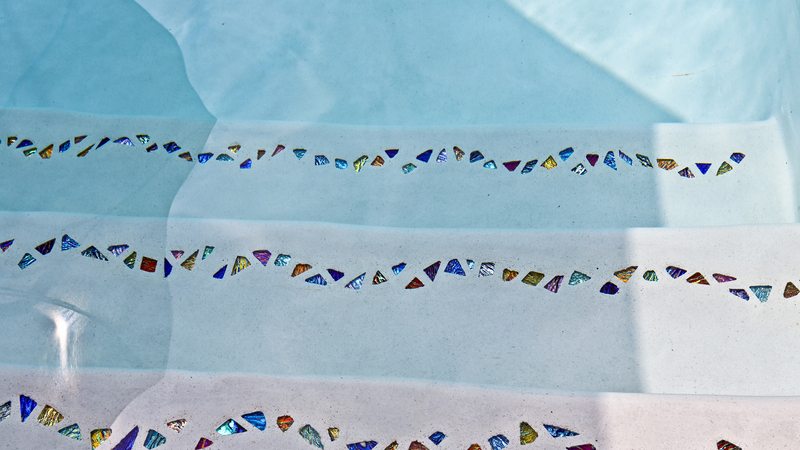 Please notify NVblu if you are unable to participate in this step of the process. 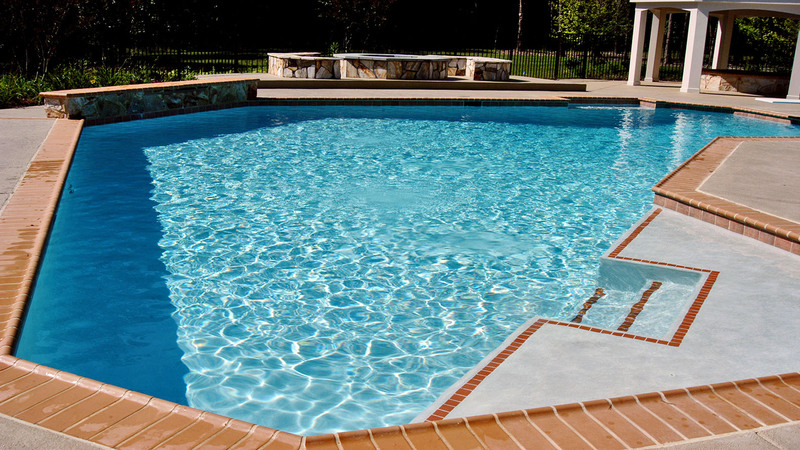 It is very common for the first time pool owner to feel overwhelmed by the initial start-up and maintenance of the pool. 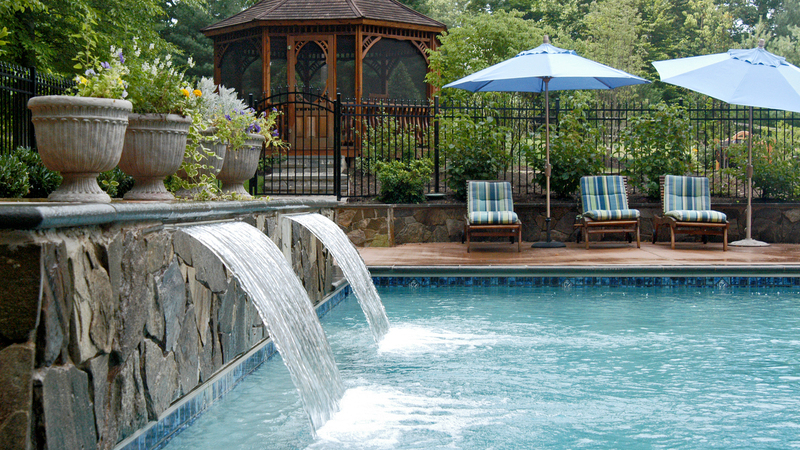 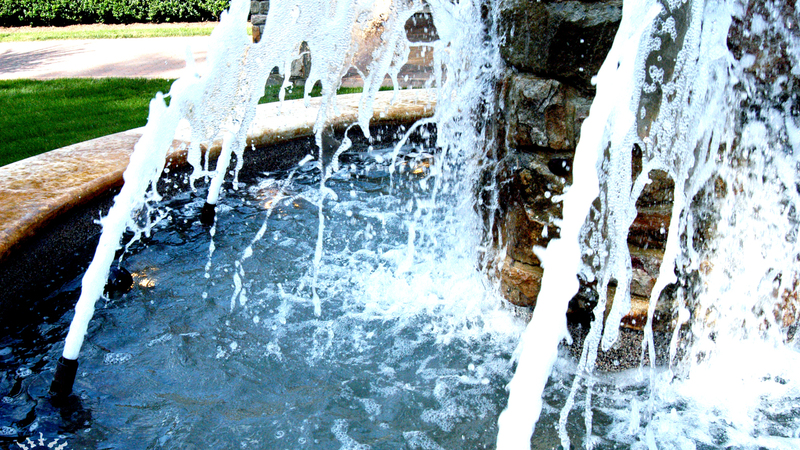 We provide every homeowner a complimentary Care Manual that explains in great detail how to easily care for the pool. 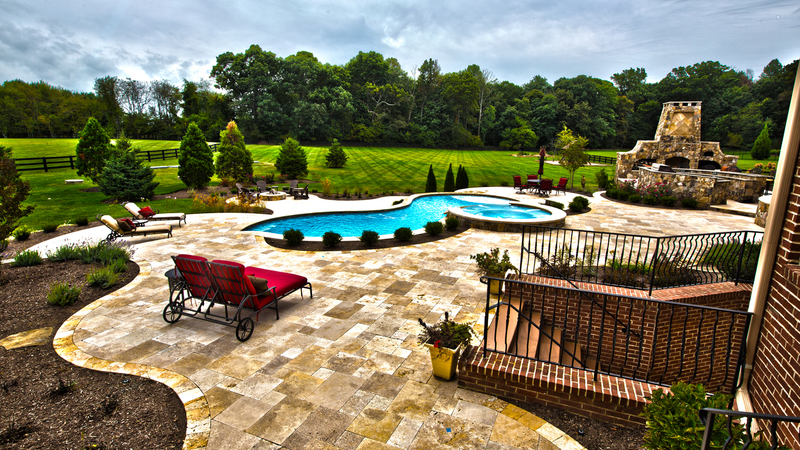 We understand that no two people or backyards are alike. 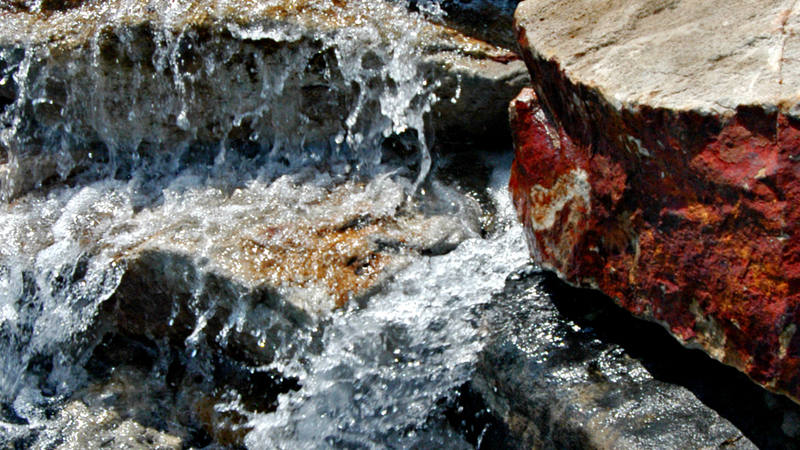 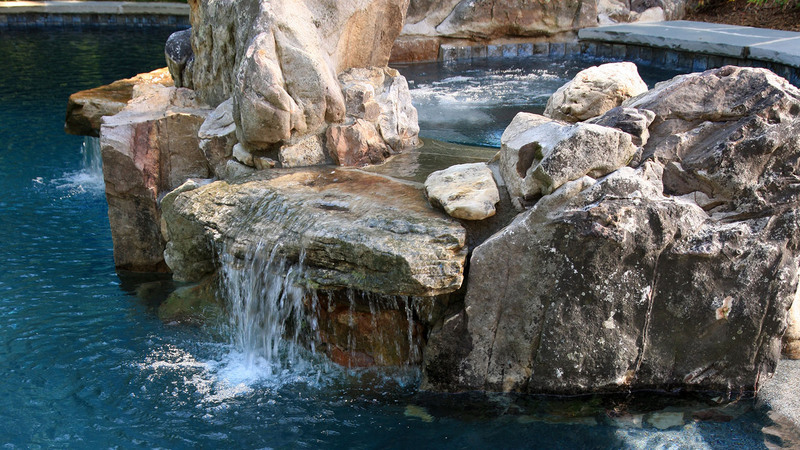 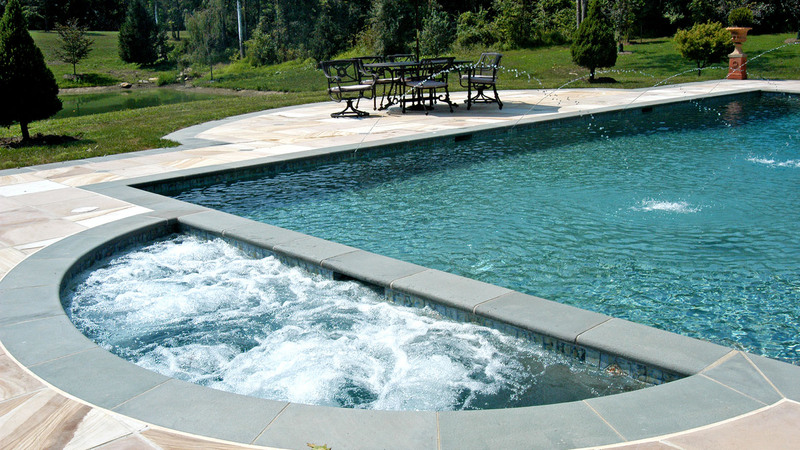 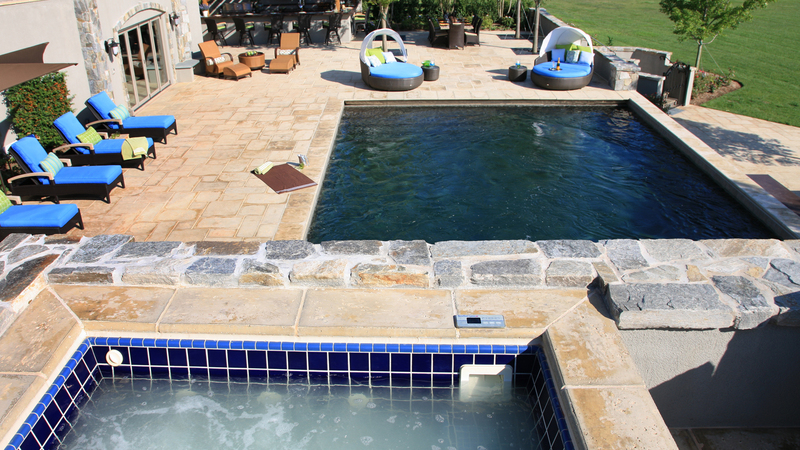 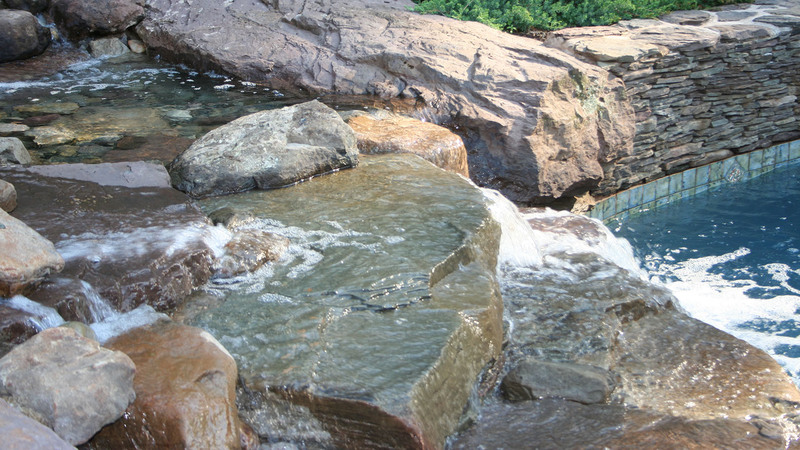 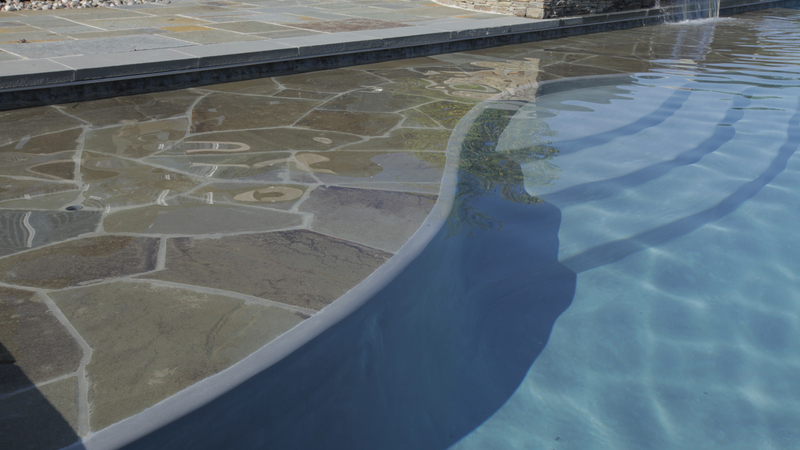 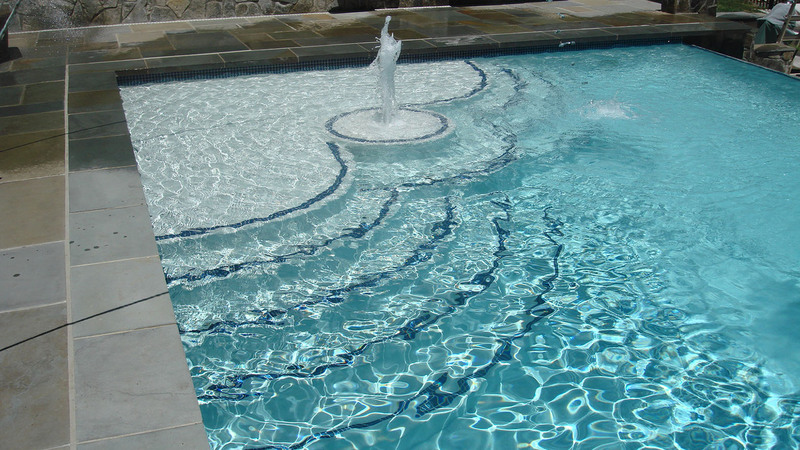 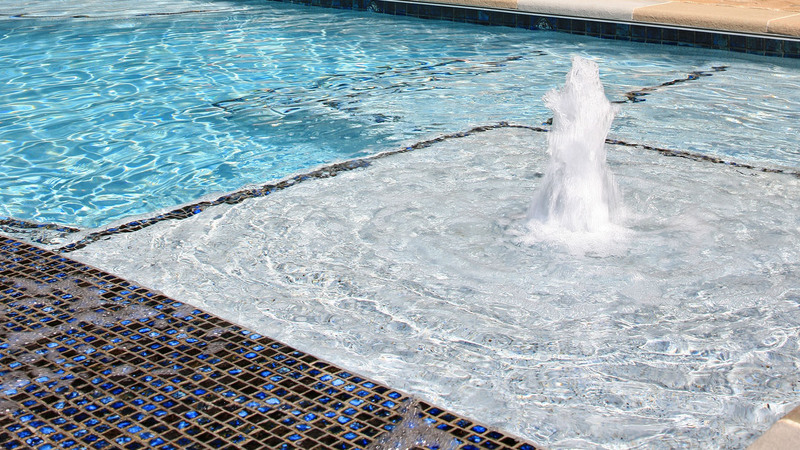 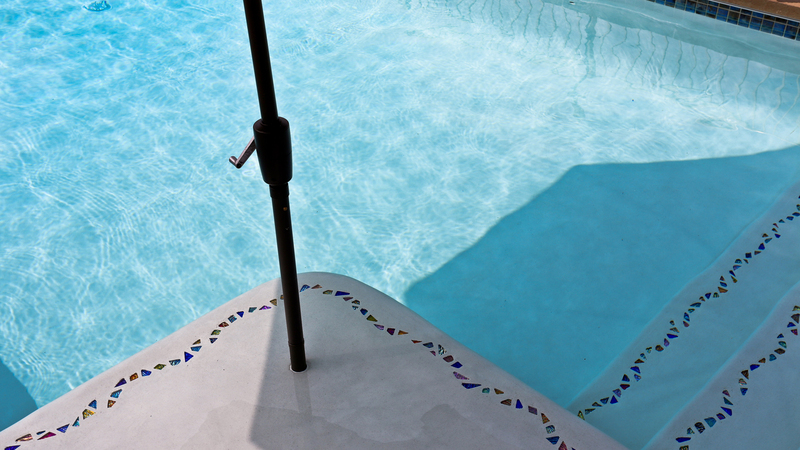 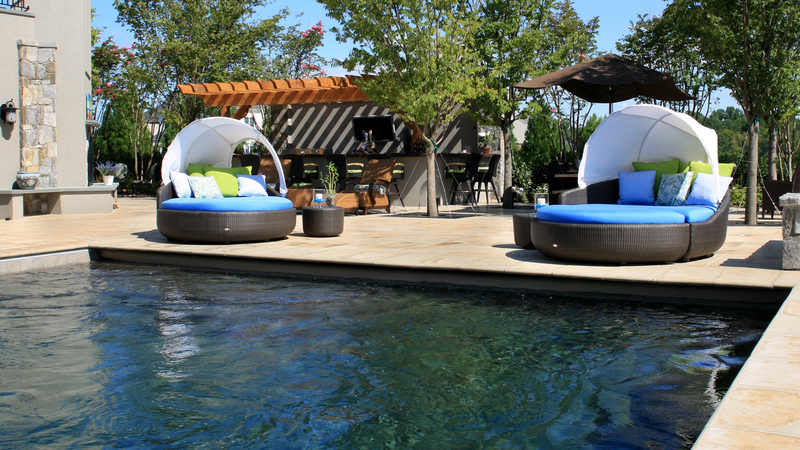 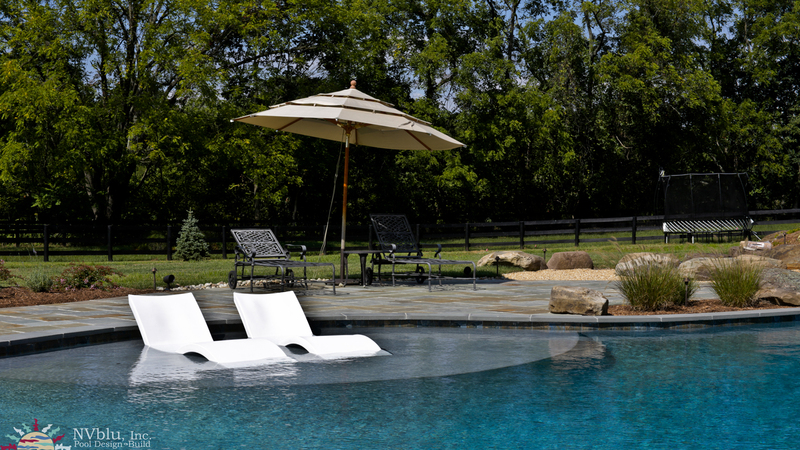 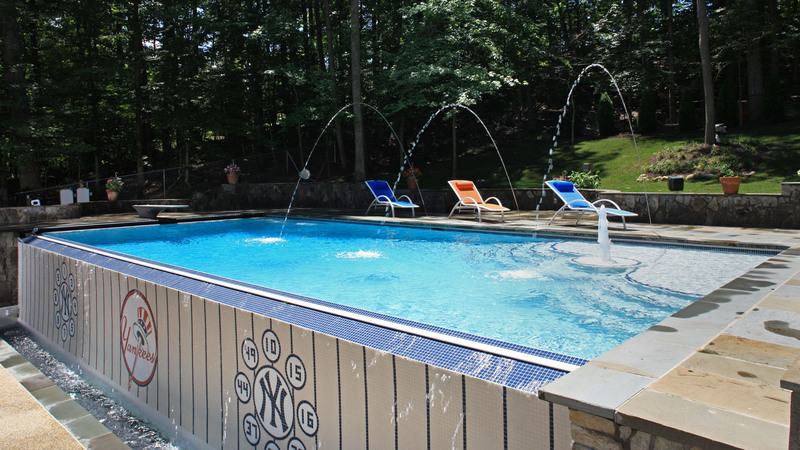 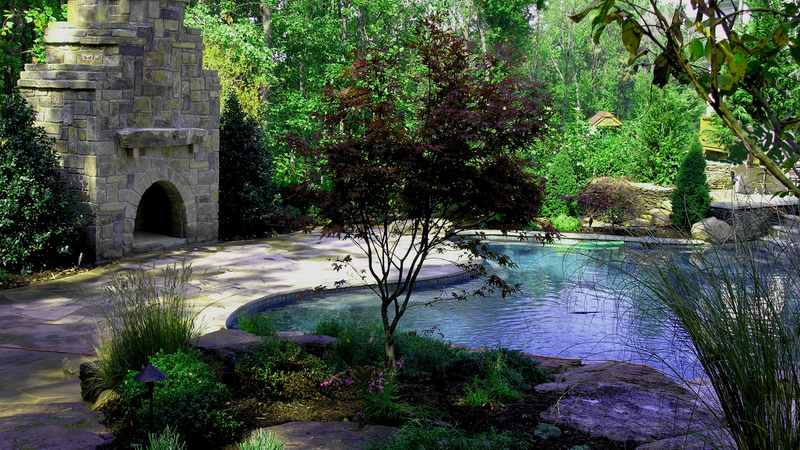 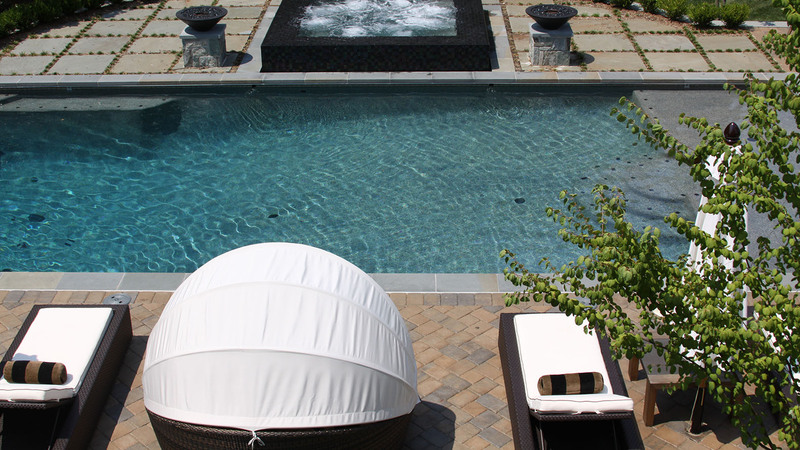 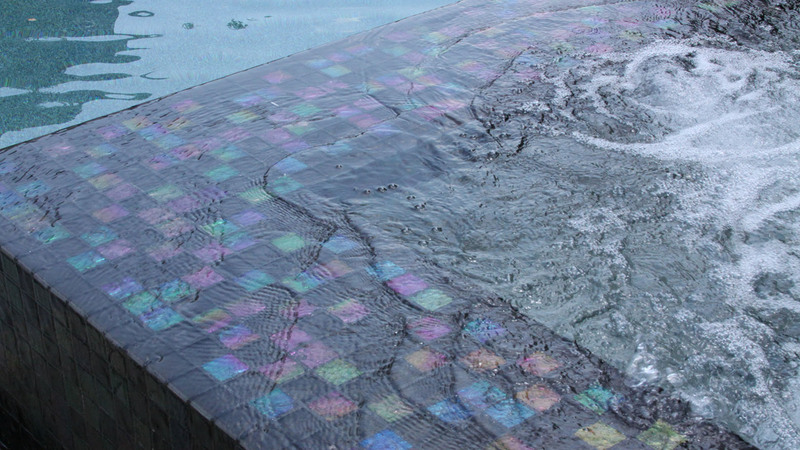 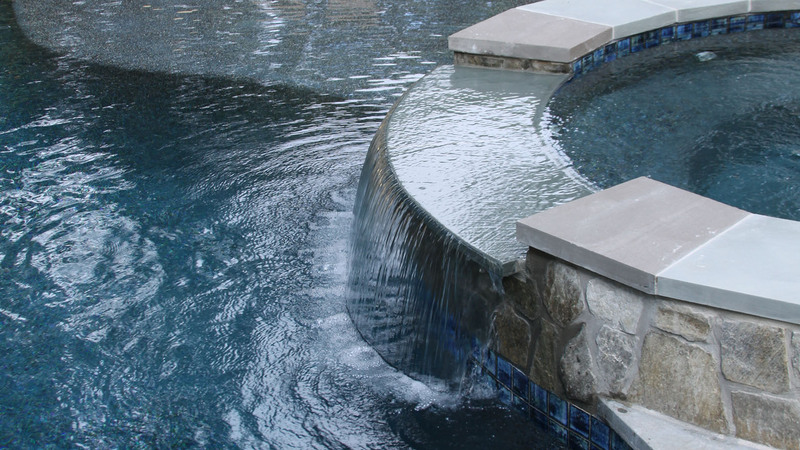 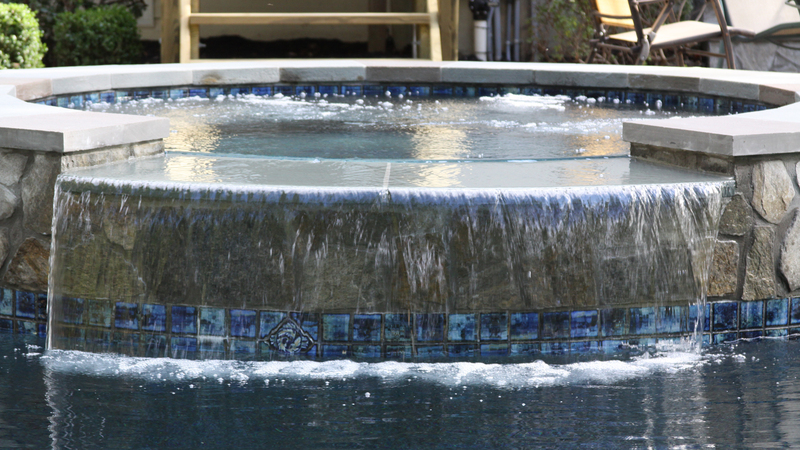 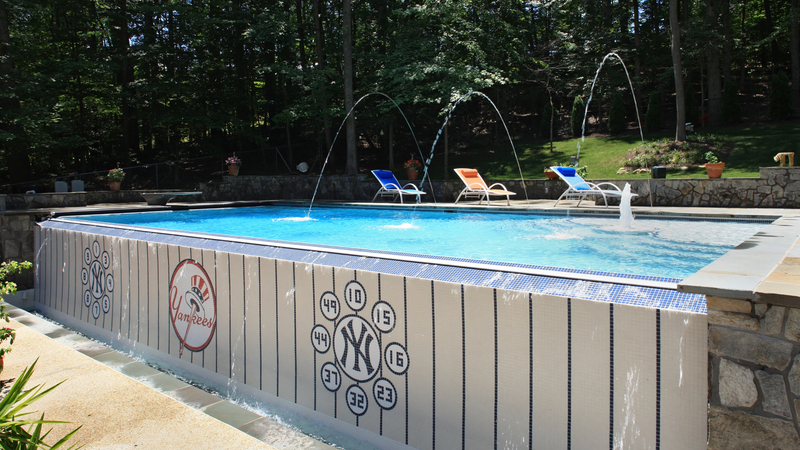 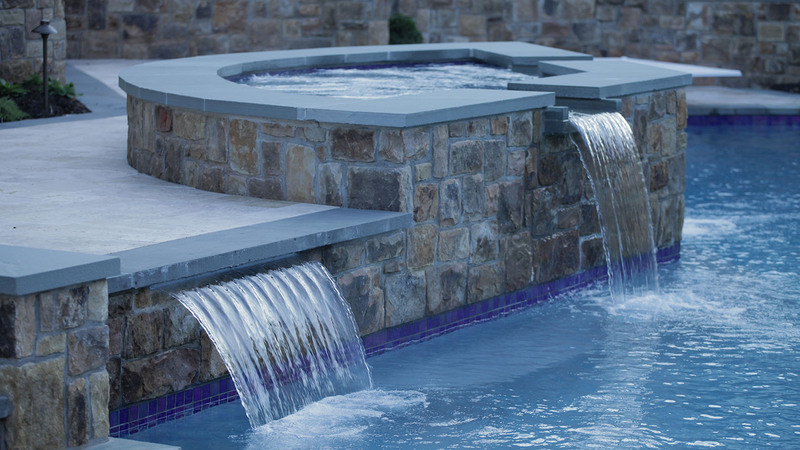 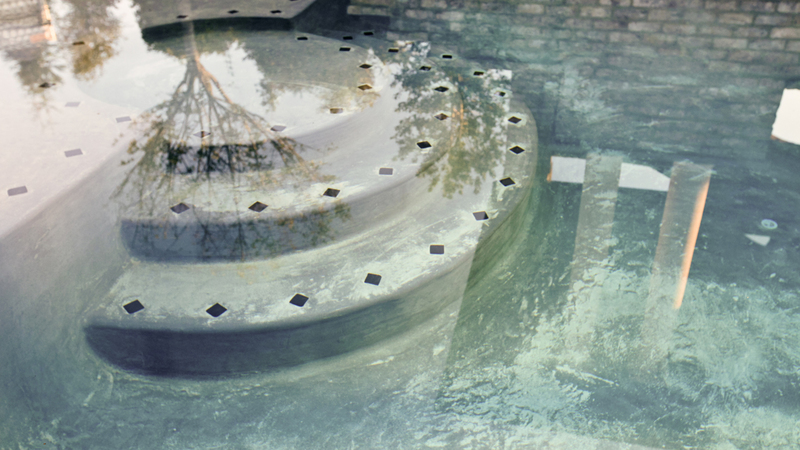 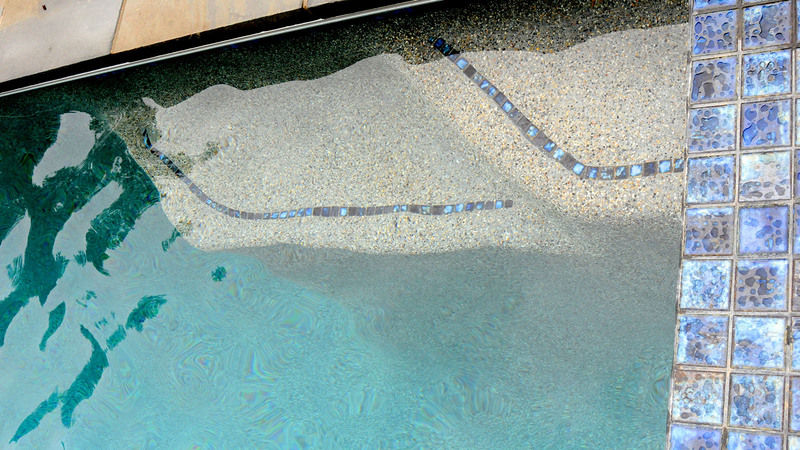 At NVblu, we create innovative pools that reflect your own personality and desires. 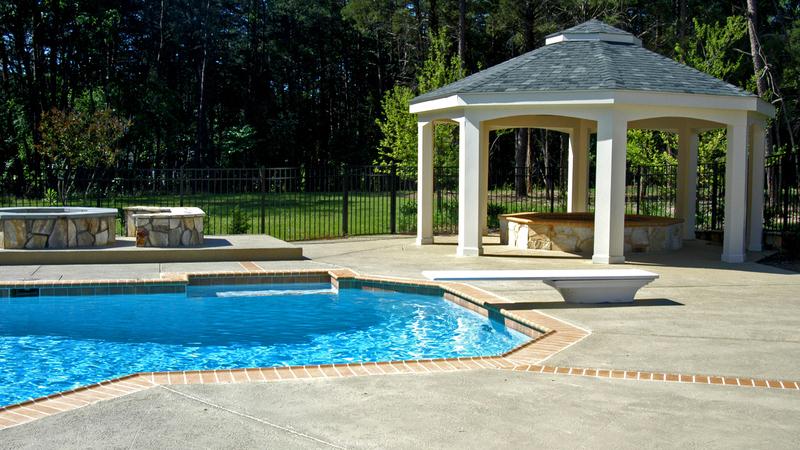 We know that building a pool can be an intimidating project, but we can make it an enjoyable experience. 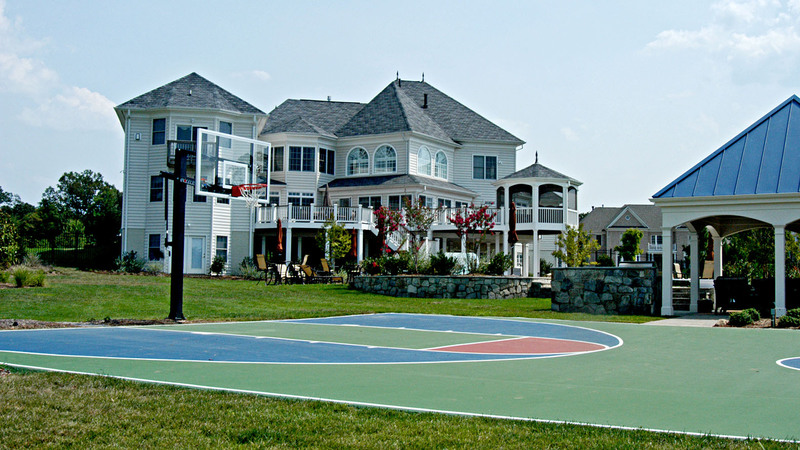 Everyone's lifestyle is unique! 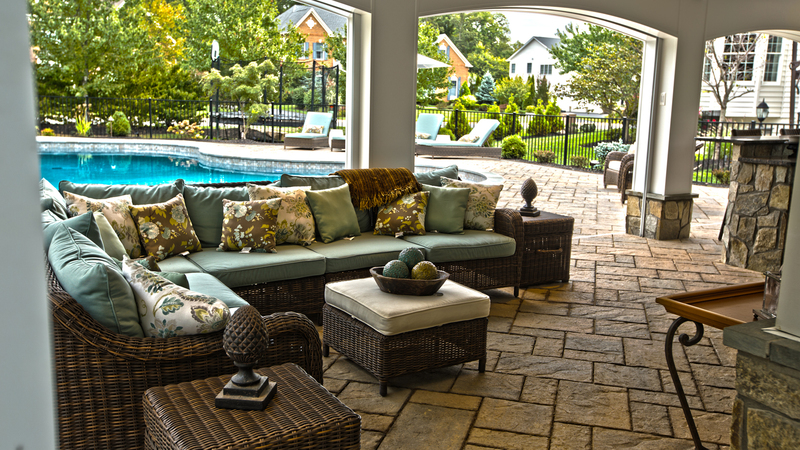 We understand that no two people or backyards are alike. 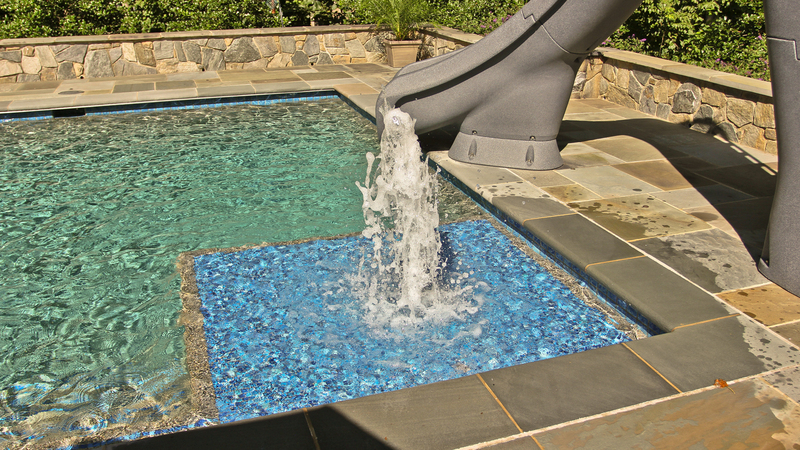 At NVblu, we create innovative pools that reflect your own personality and desires. 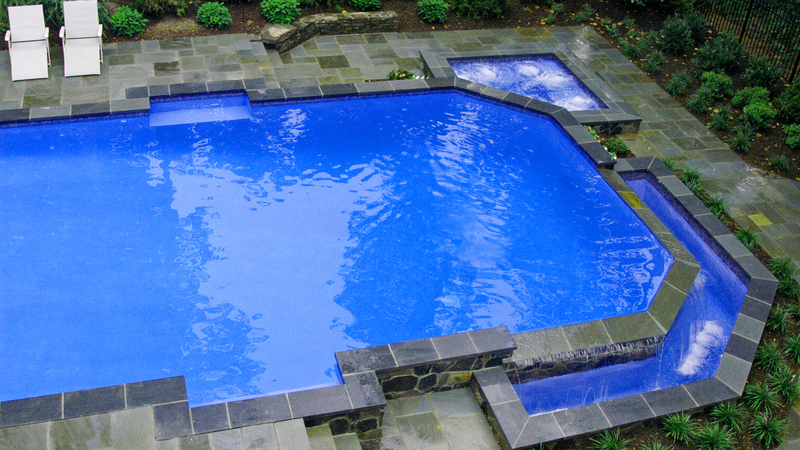 We know that building a pool can be an intimidating project, but we can make it an enjoyable experience. 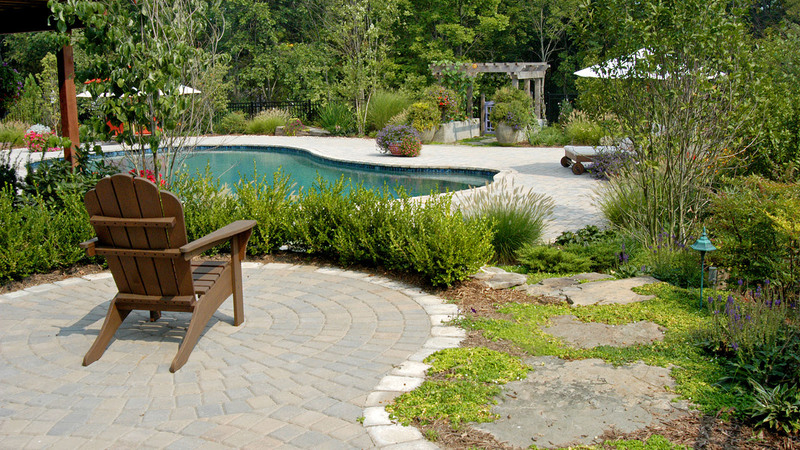 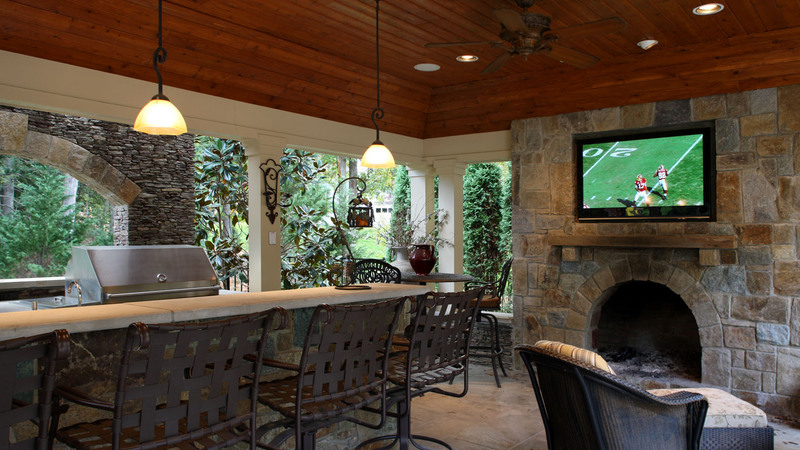 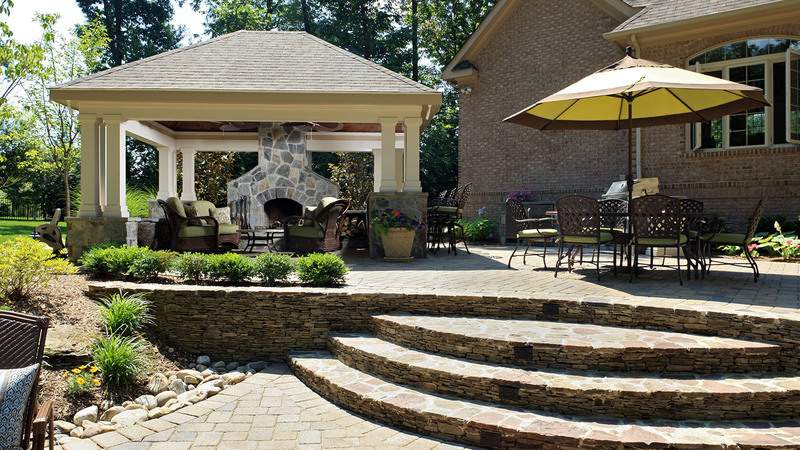 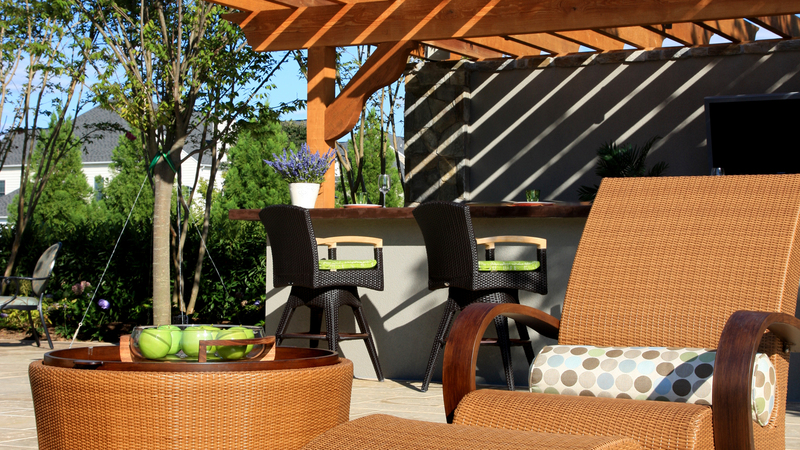 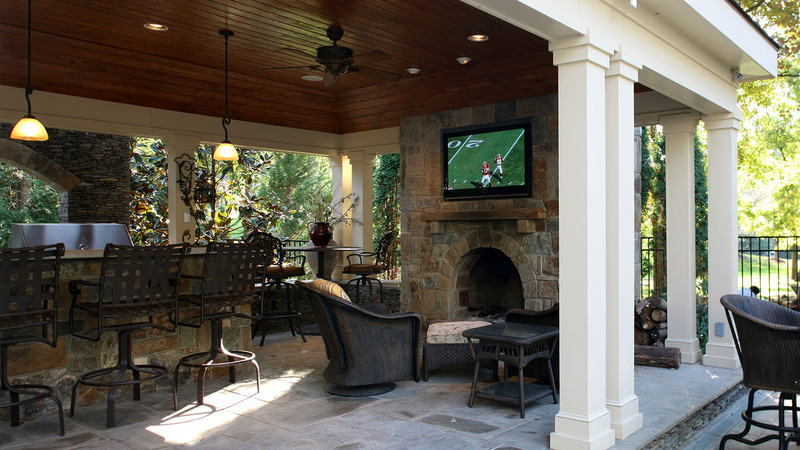 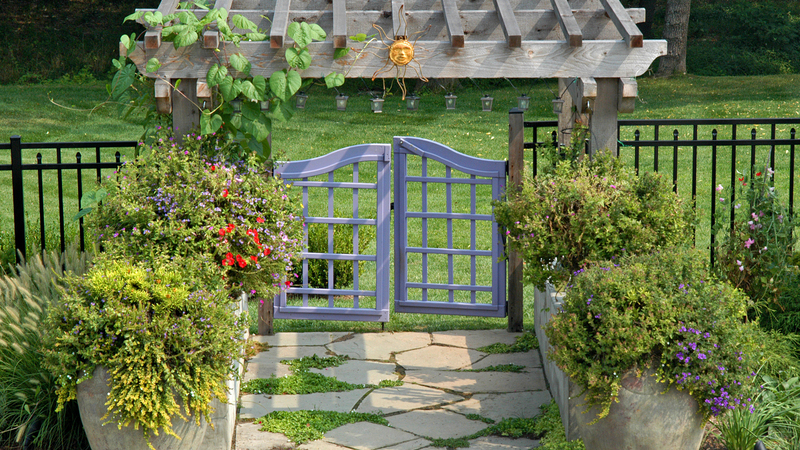 We do this by taking the time to listen to what you want in a backyard environment. 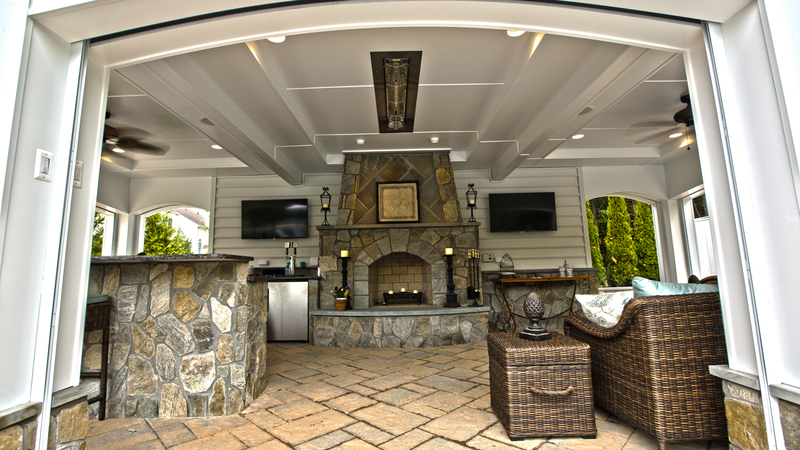 We will explain all your options to you in simple, easy to understand language and keep you informed throughout every step of the process. 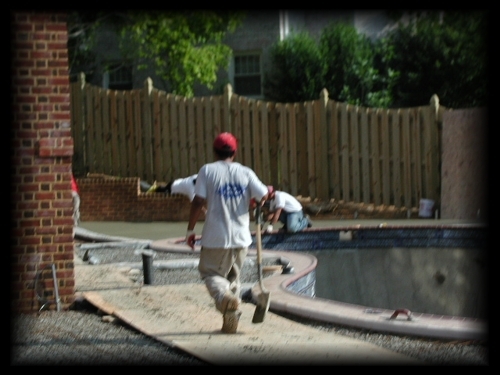 We don't stop when your pool is finished. 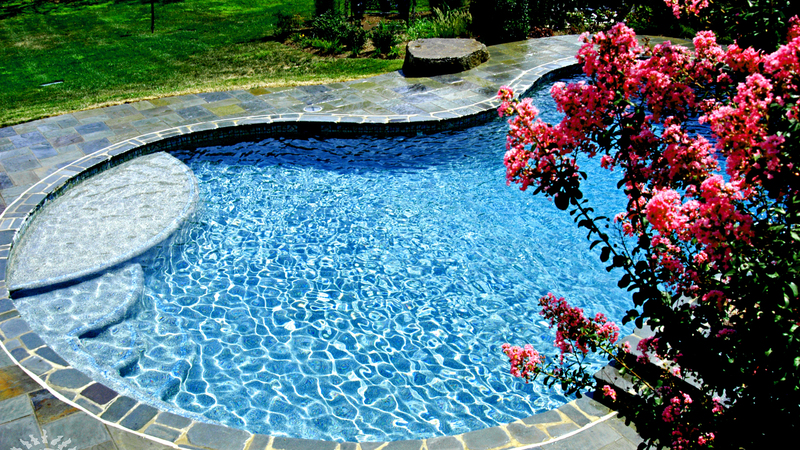 We'll be there to answer your questions and provide service for the life of your pool. 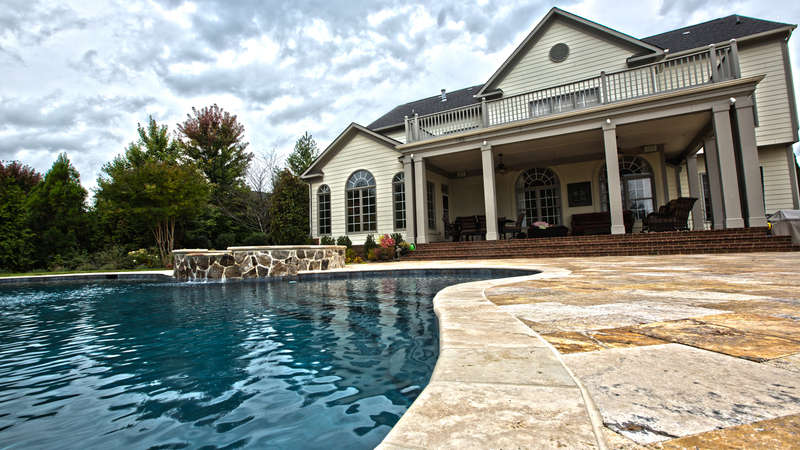 We've helped countless families successfully achieve their dream of pool ownership through listening and understanding. 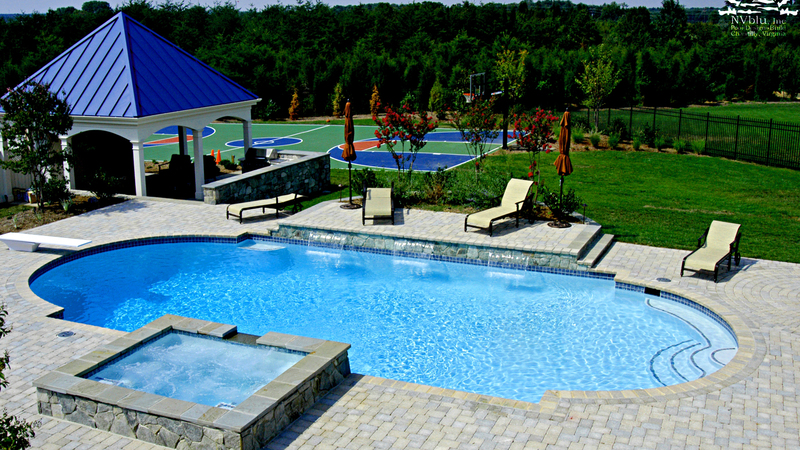 At NVblu, the first step to a satisfied customer is understanding our customers' dreams, desires and vision. 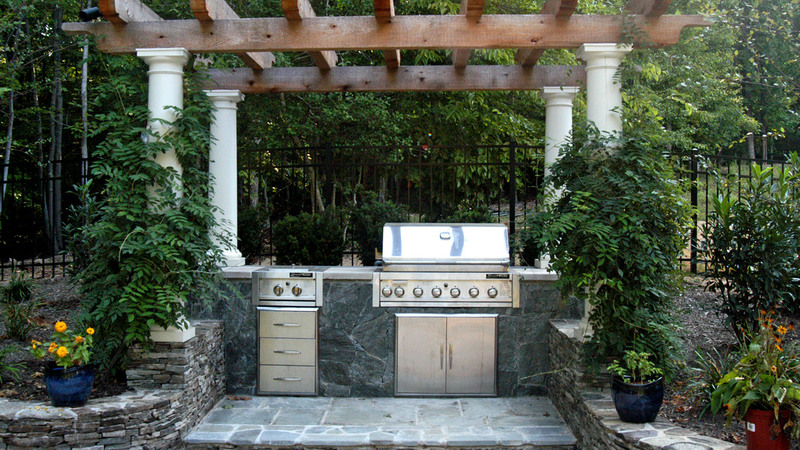 Quality service from experienced well trained technicians. 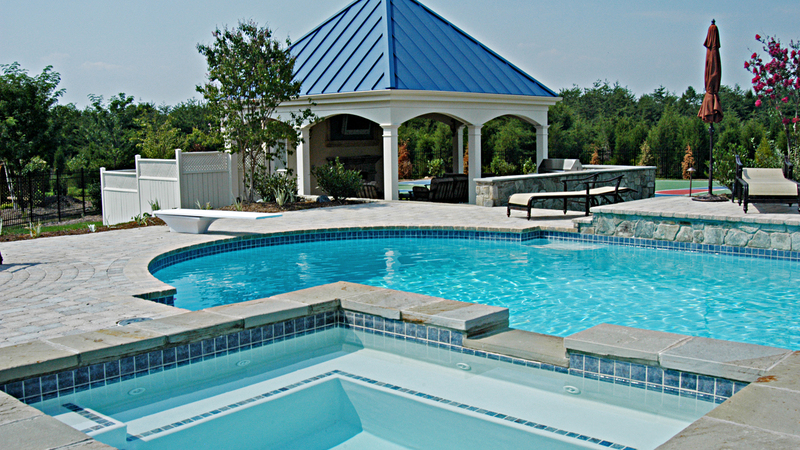 From weekly maintenance to installing a new safety cover, NVblu offers many different pool service packages. 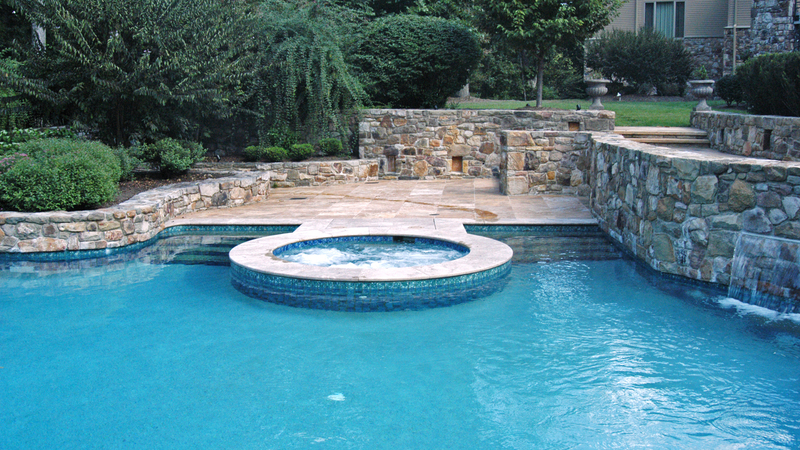 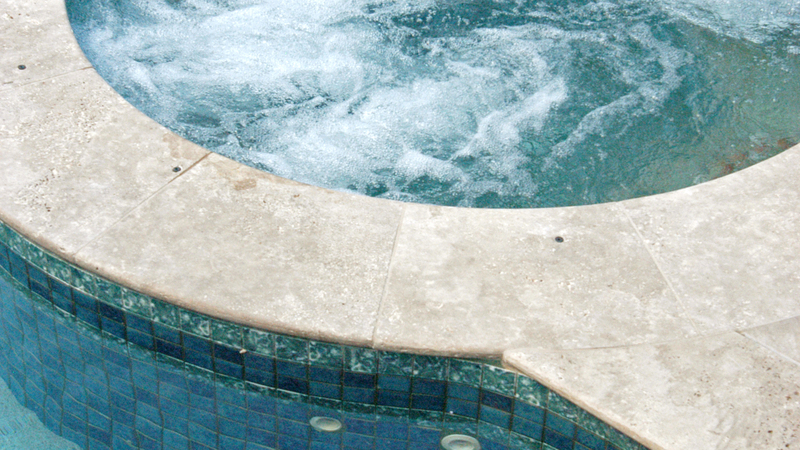 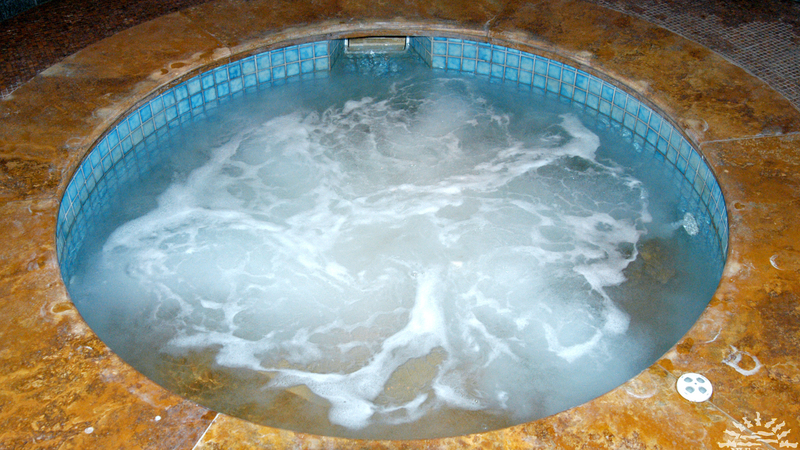 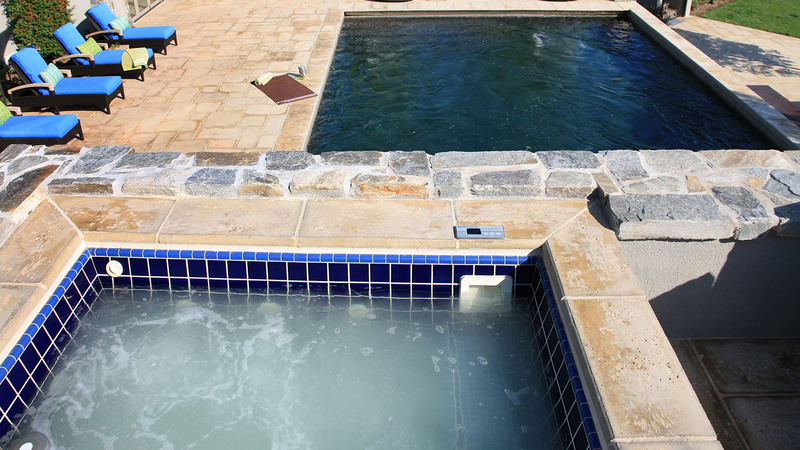 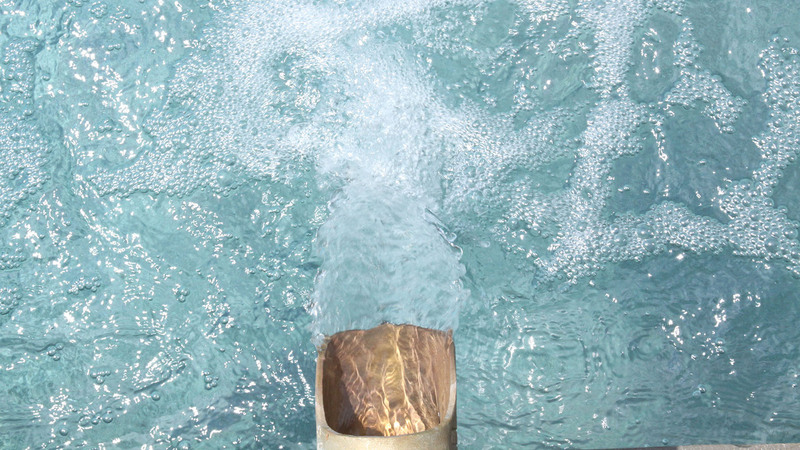 We can take care of anything you want - from opening and closing your pool to upgrading your pool to a salt generator. 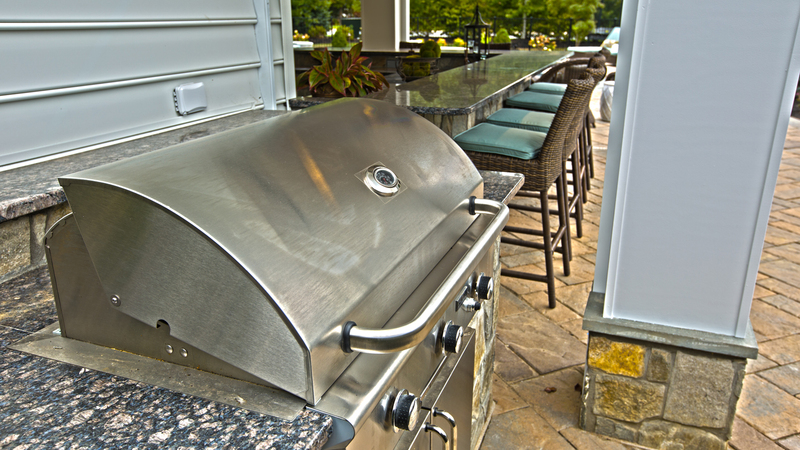 Our experienced service technicians strive to exceed our customers' expectations in every service we provide. 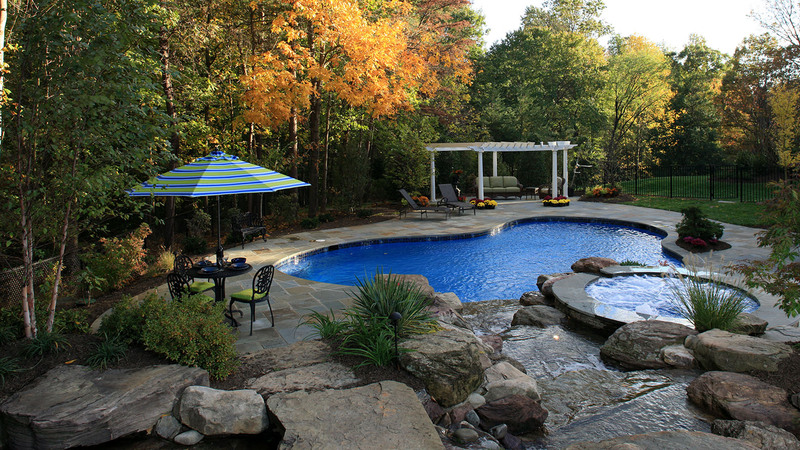 So whether you need your pool winterized or simply vacuumed, you can trust us to take care of it. 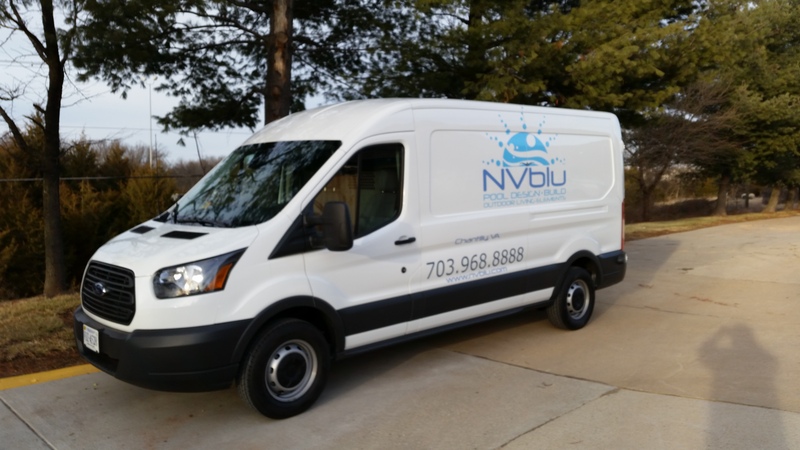 How did you find out about NVblu? 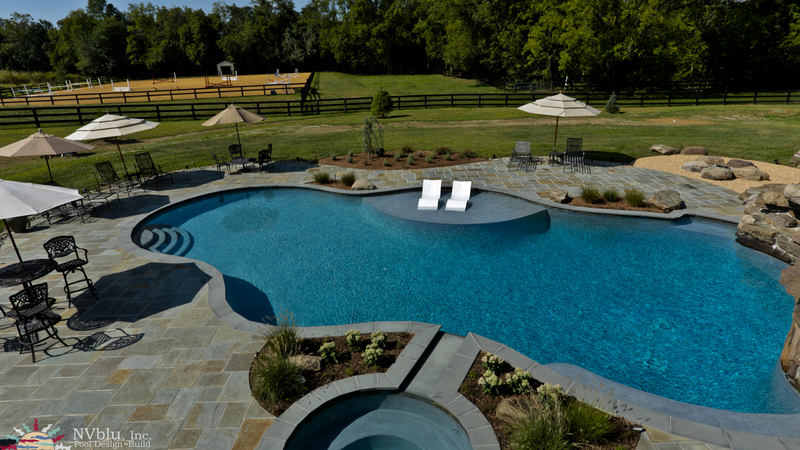 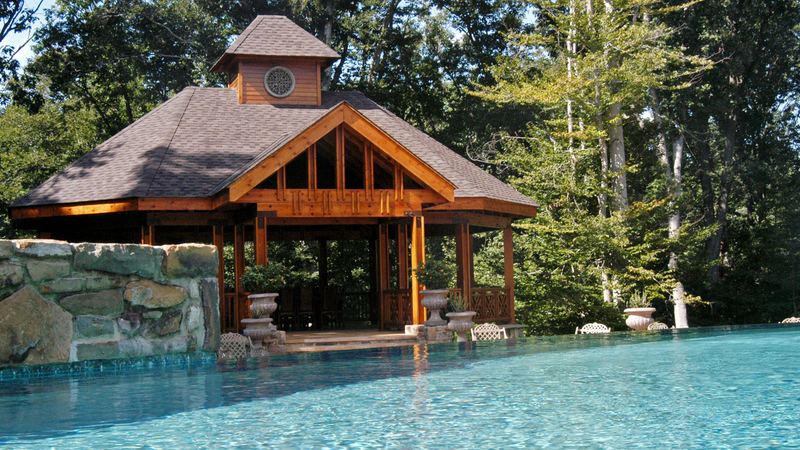 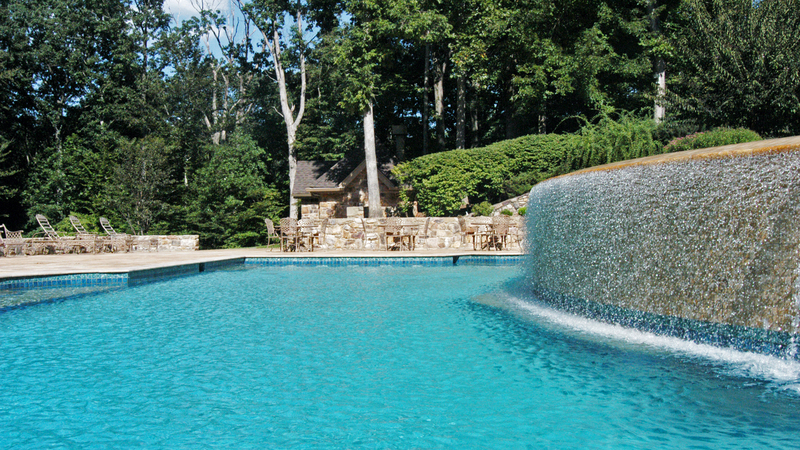 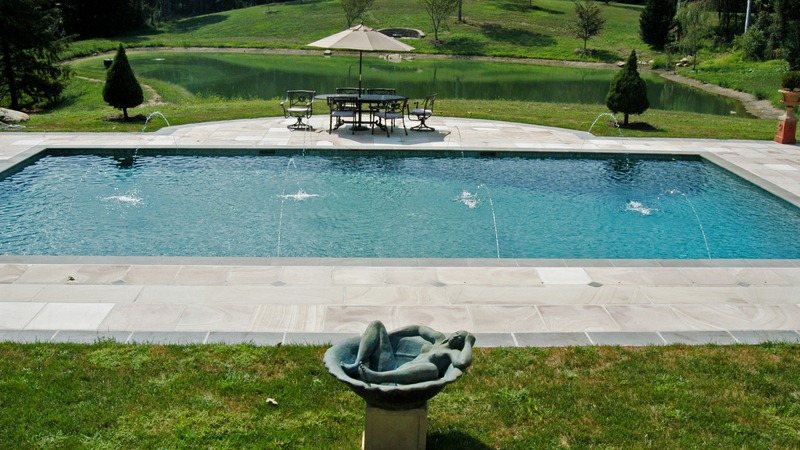 a free, no-obligation, in-home estimate & custom designed pool plan. 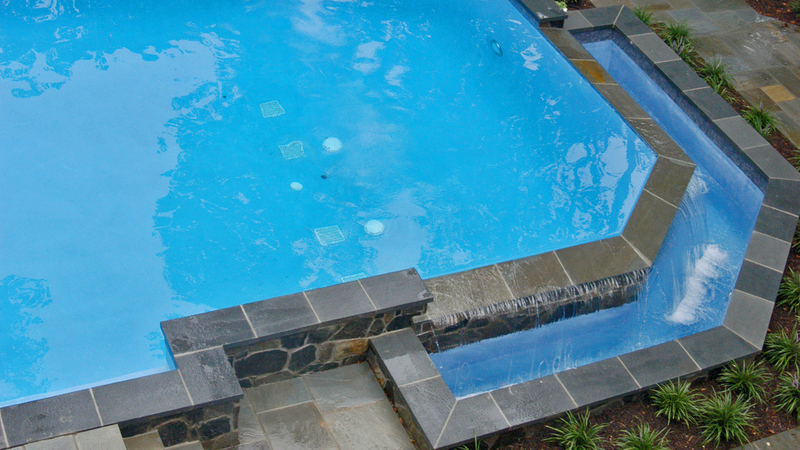 information about remodeling/updating an existing pool. 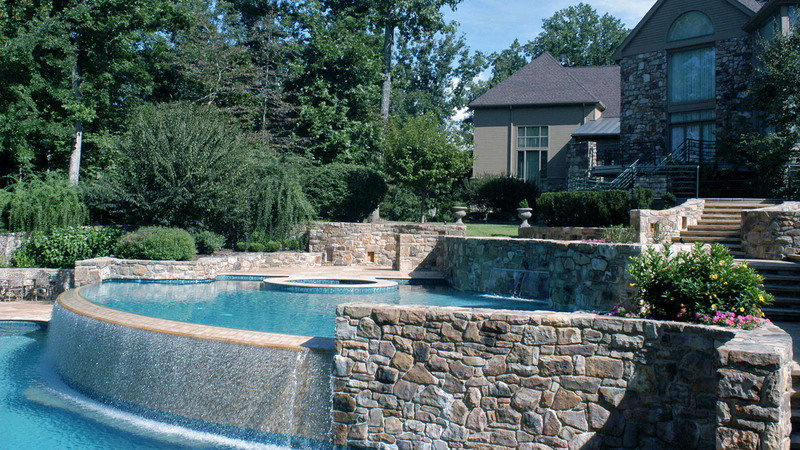 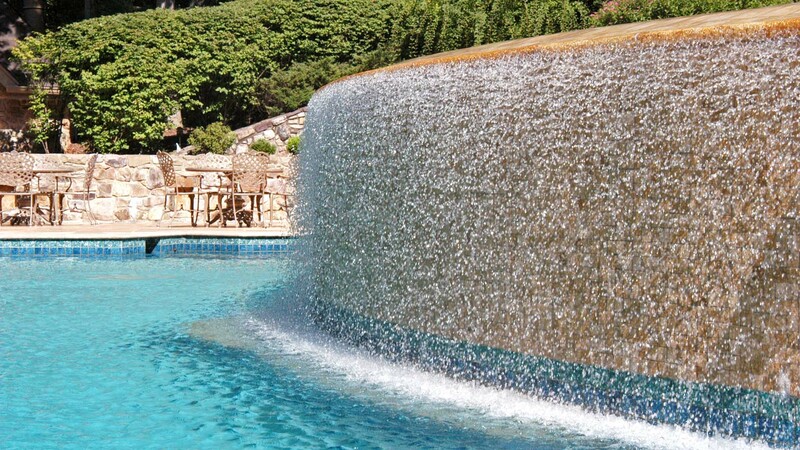 to hear from a pool design consultant. 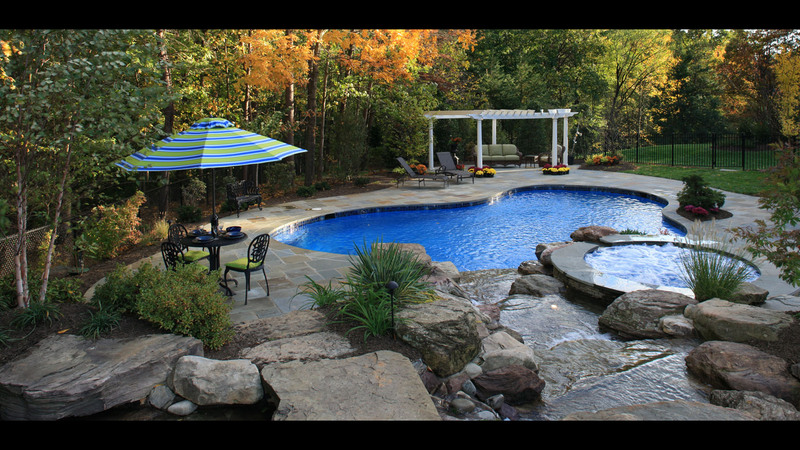 © 1981-2016 NVblu, Inc. All Rights Reserved.